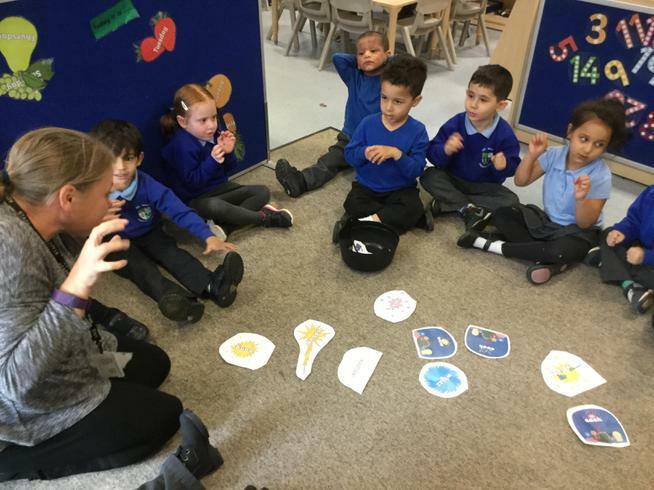 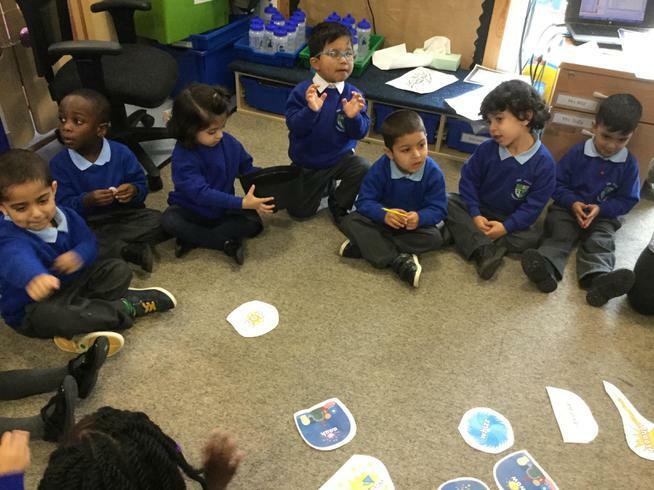 our Class Dojo's Click here to see how many Dojo's we have got ! 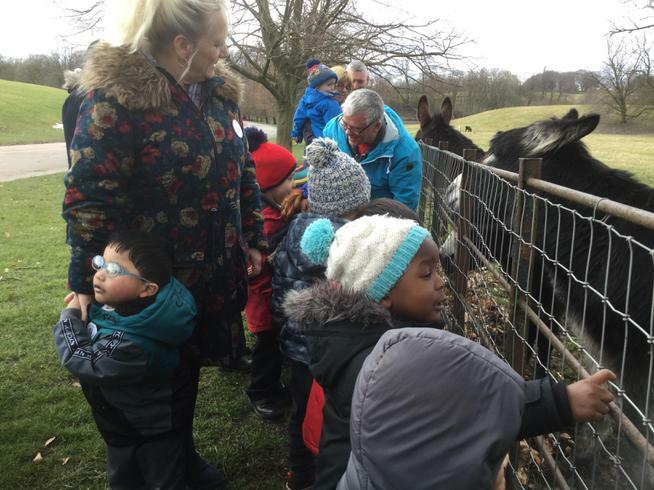 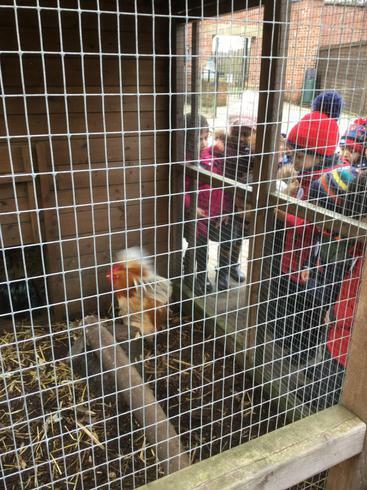 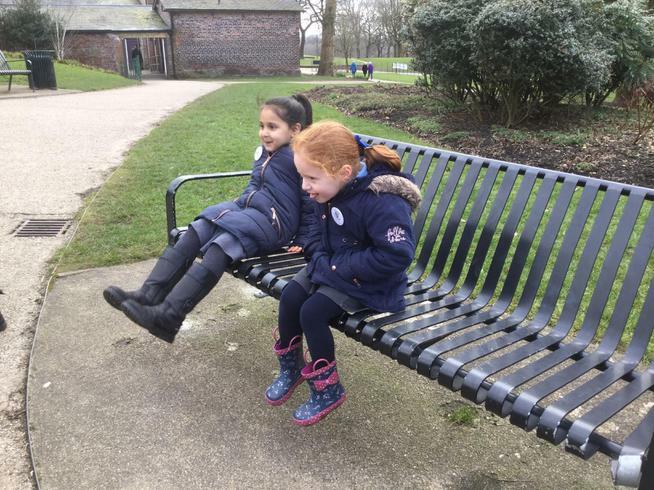 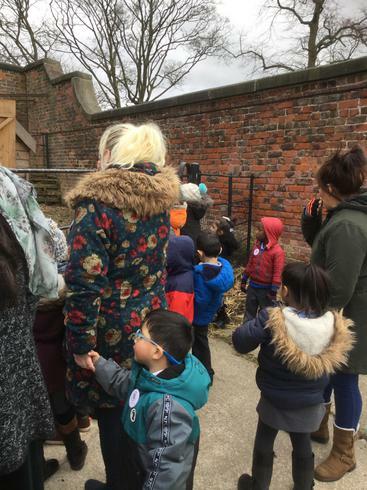 Today we went on a trip to Heaton park farm. 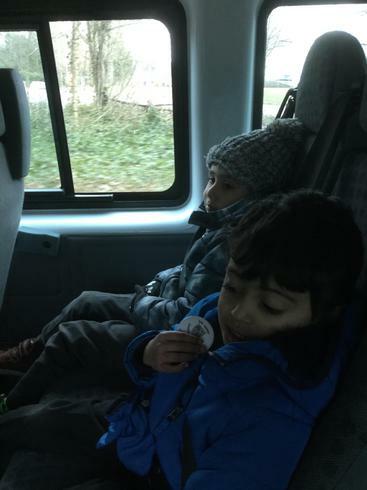 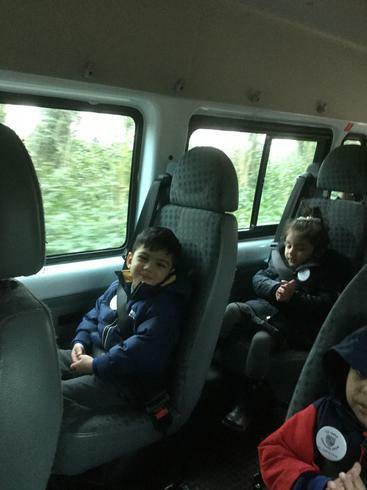 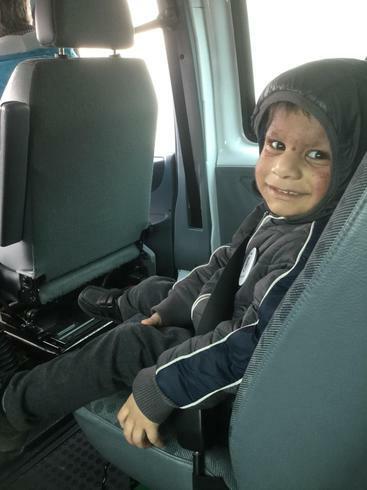 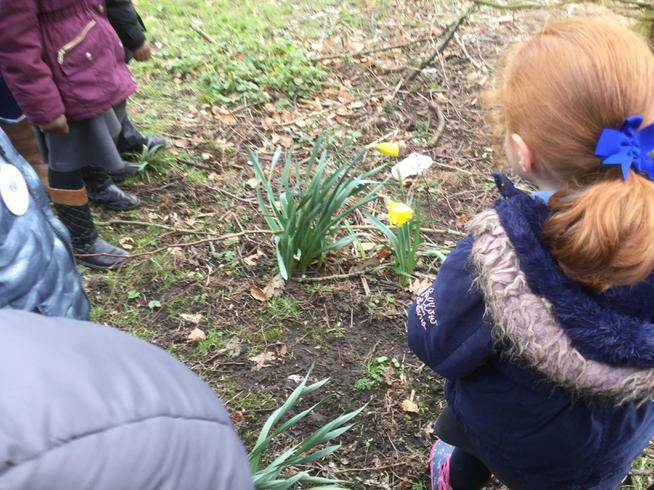 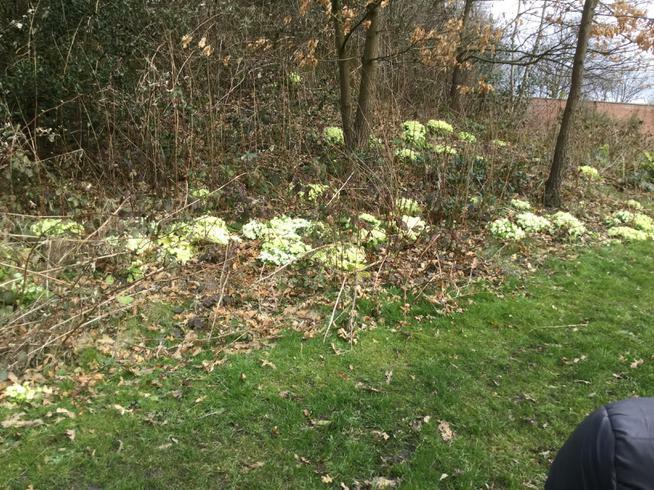 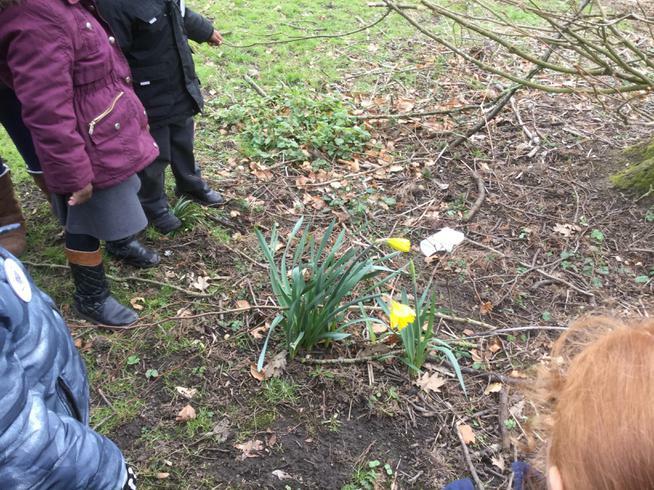 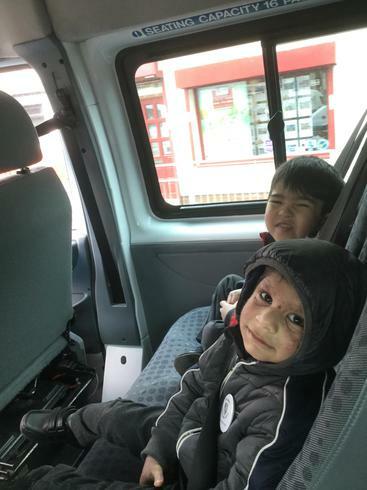 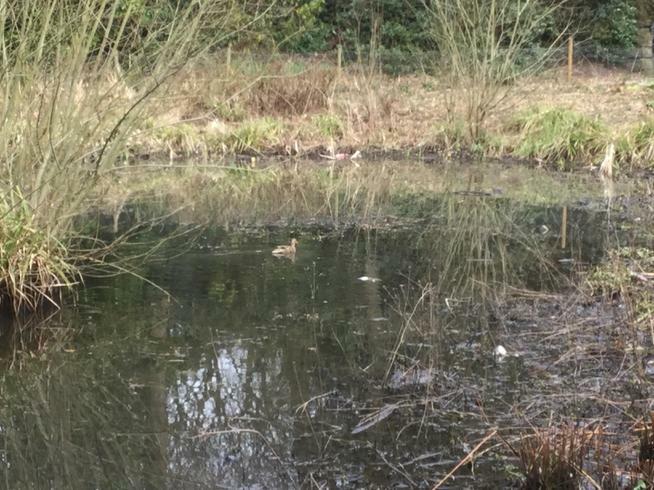 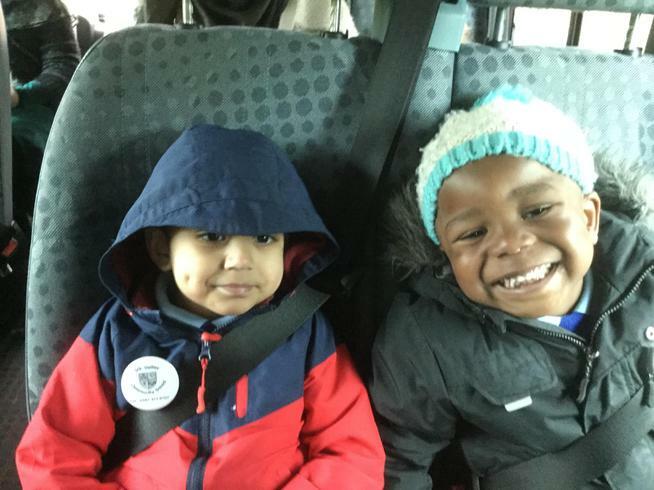 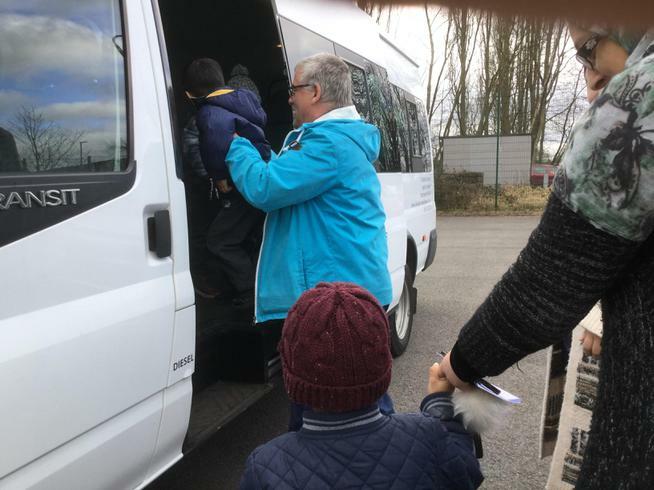 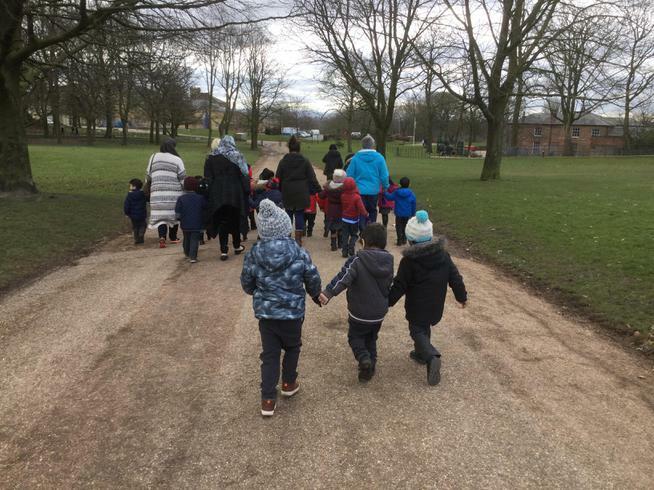 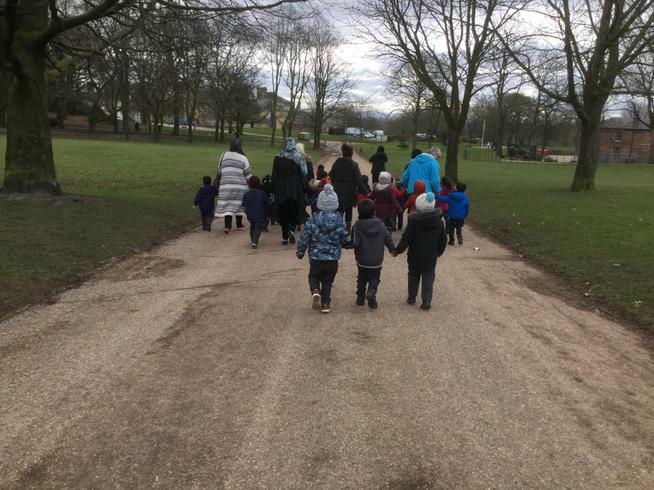 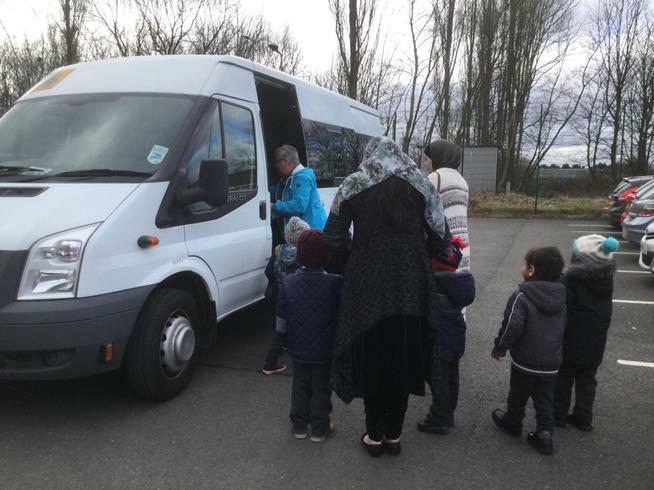 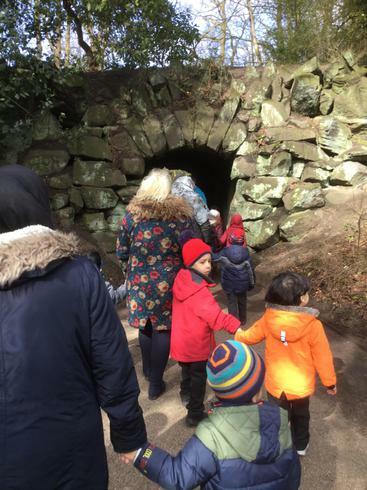 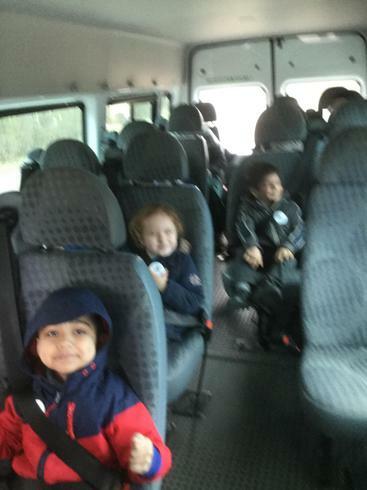 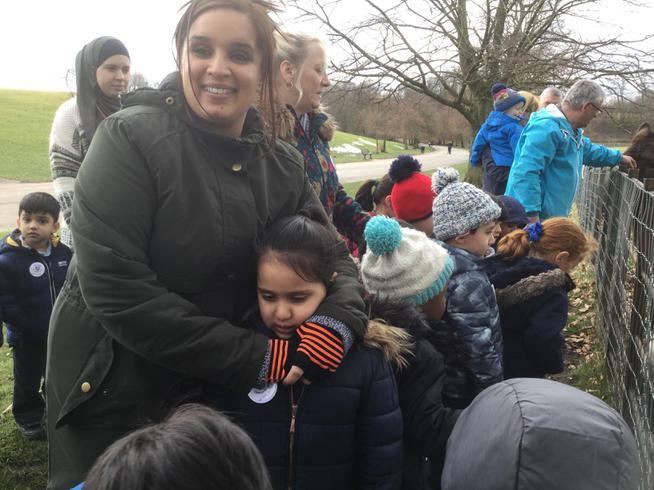 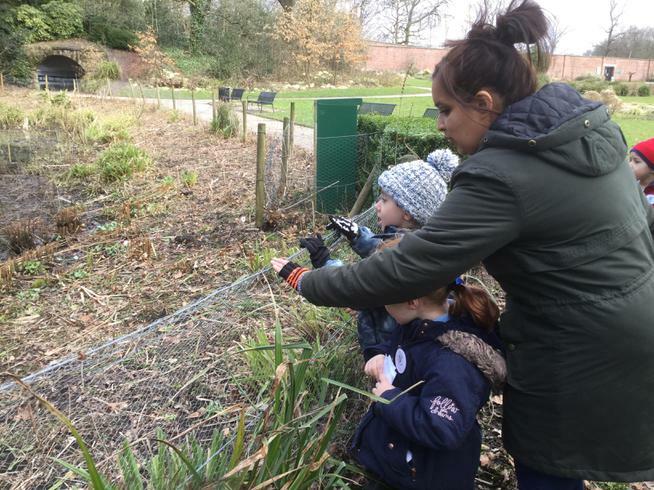 We had a lovely time , first we went for a ride on our Mini Bus , we had a lovely walk around the garden spotting spring flowers and walking through the dark tunnel to listen to how our voices changed in there. 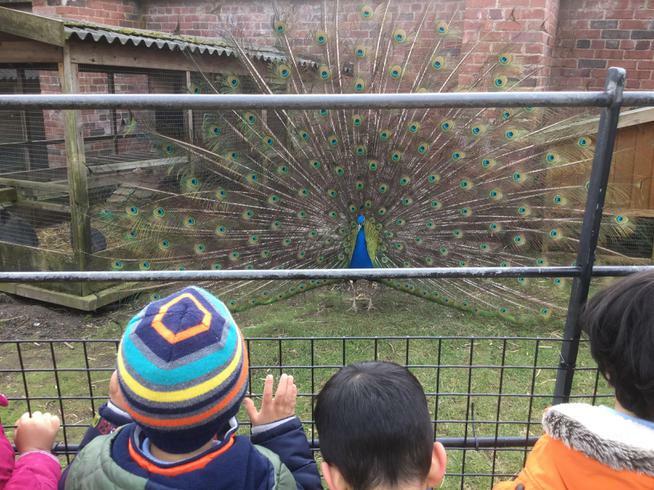 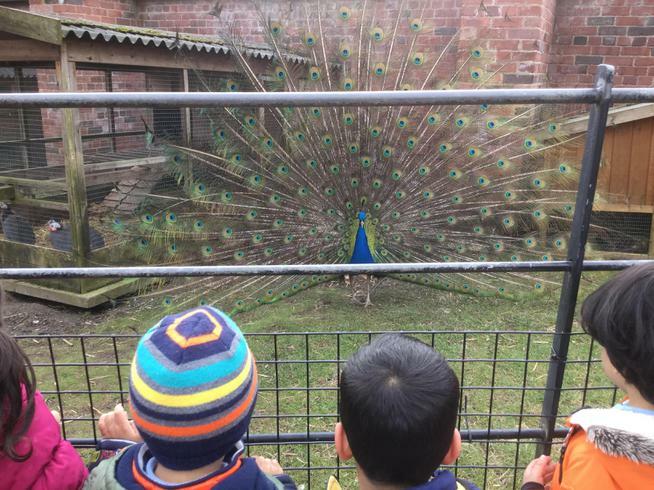 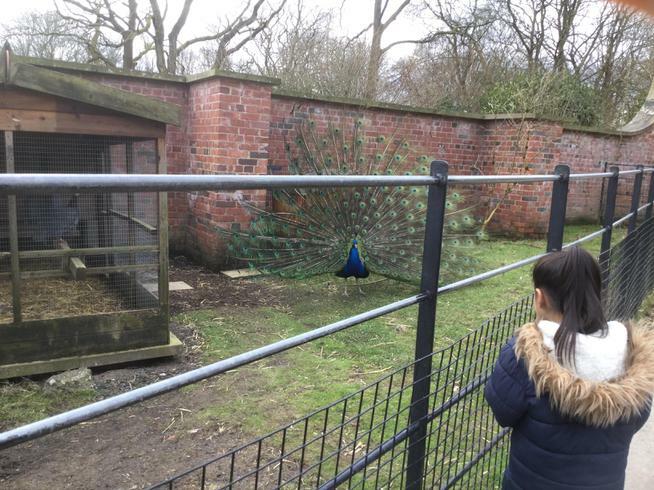 Next we visited the animals in the farm , we saw rabbits, hens, goats, and a baby pig that was fast asleep, a lama and even a peacock who was very excited to show off his tail feathers. 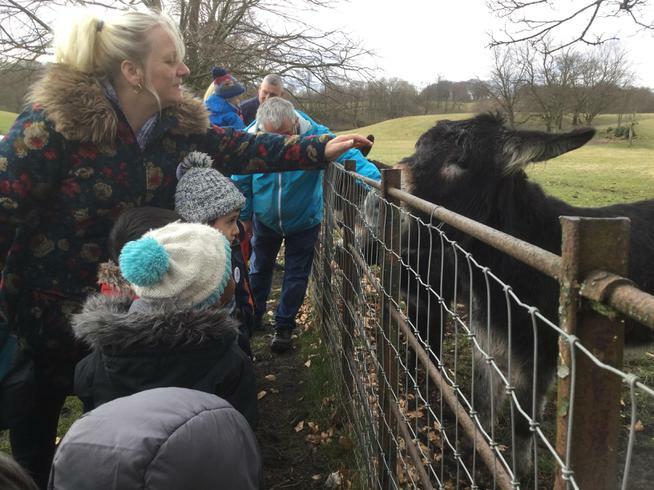 Lastly we went to see the donkeys they were very friendly. 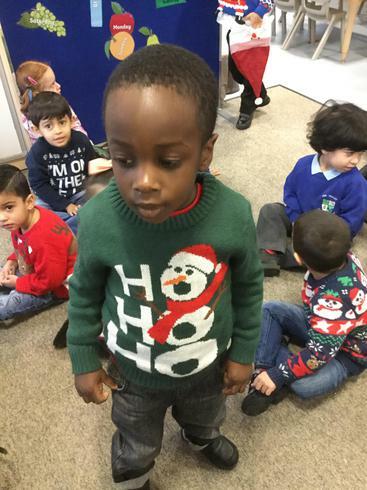 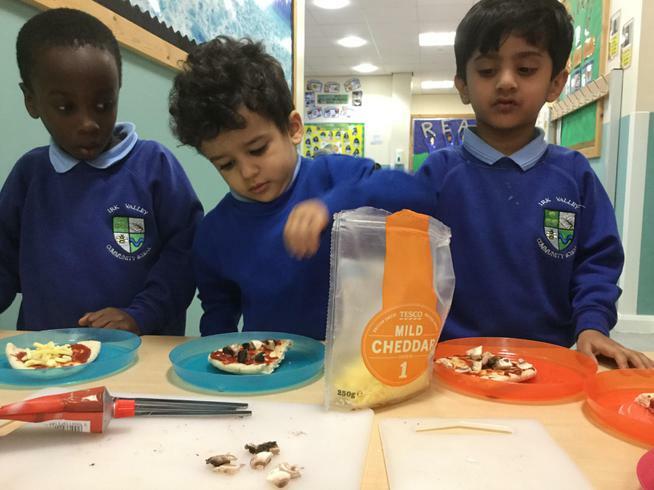 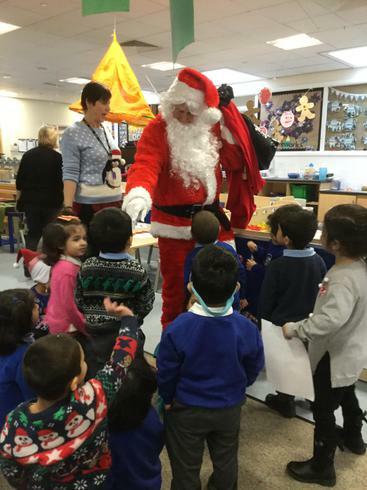 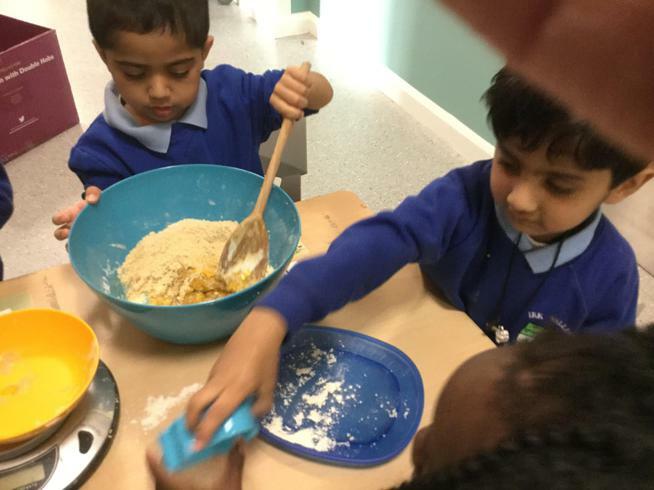 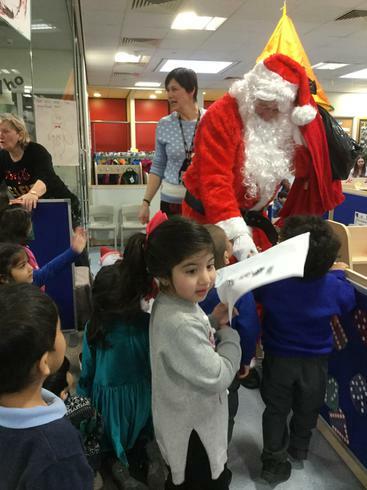 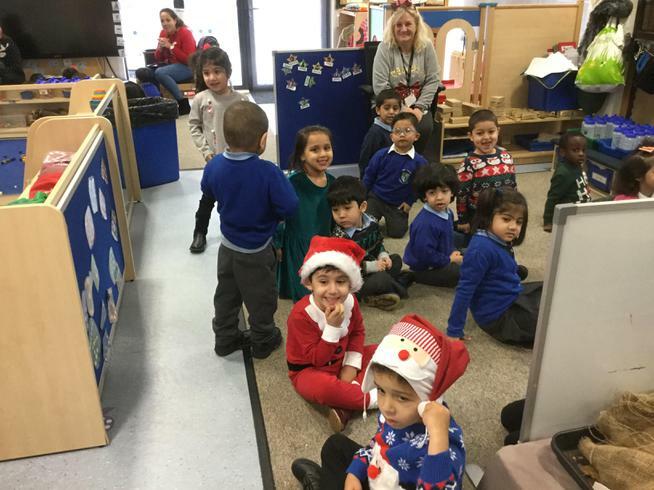 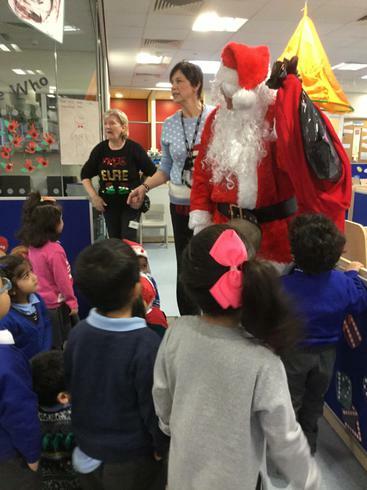 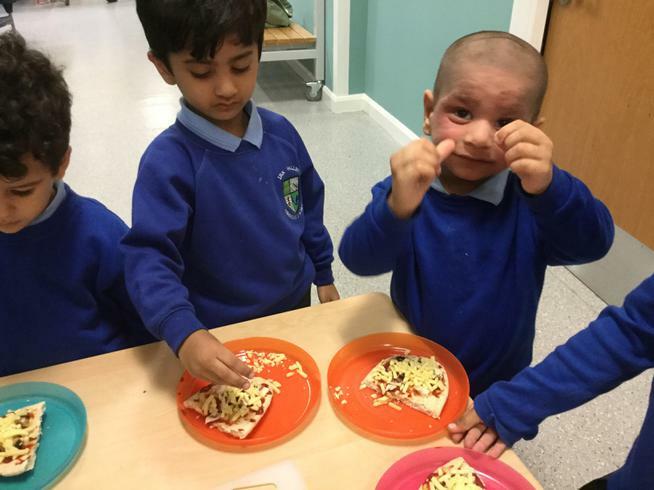 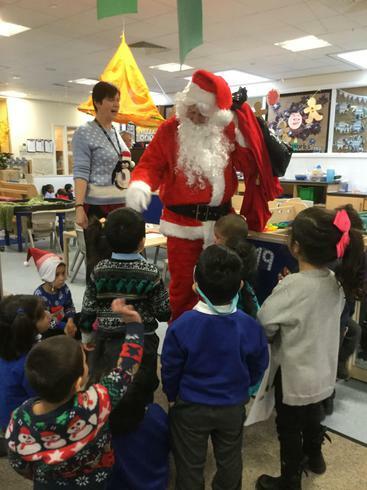 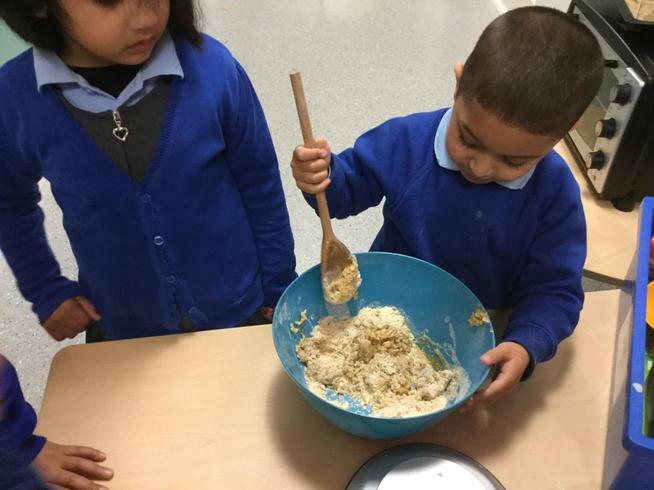 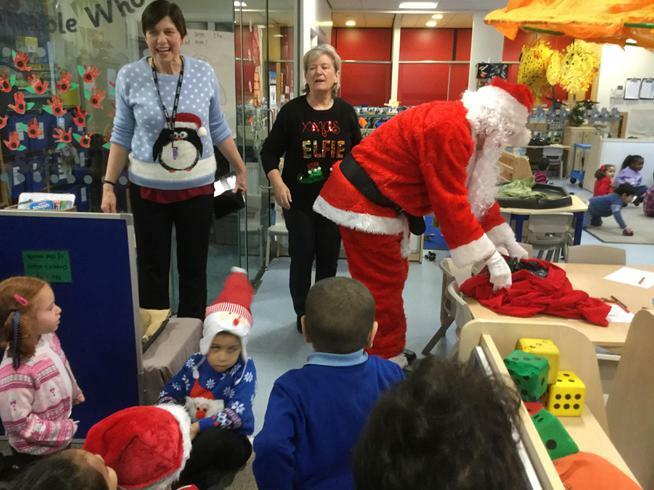 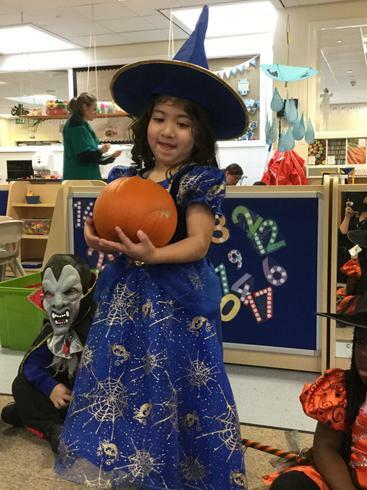 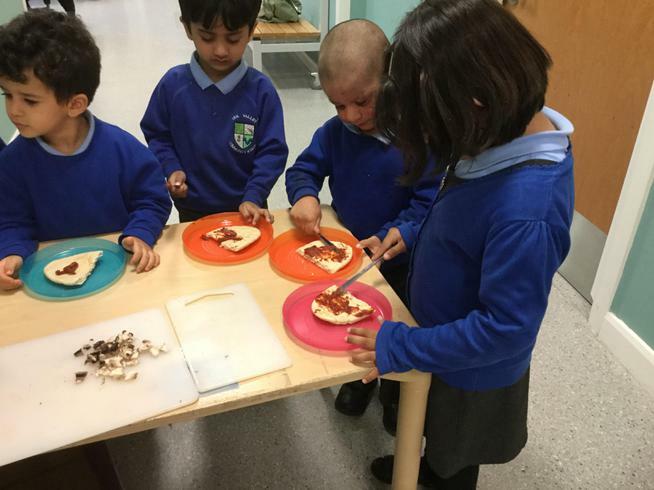 We then came back to school just in time for lunch , we had such a great time thanks to all the parents that joined us. 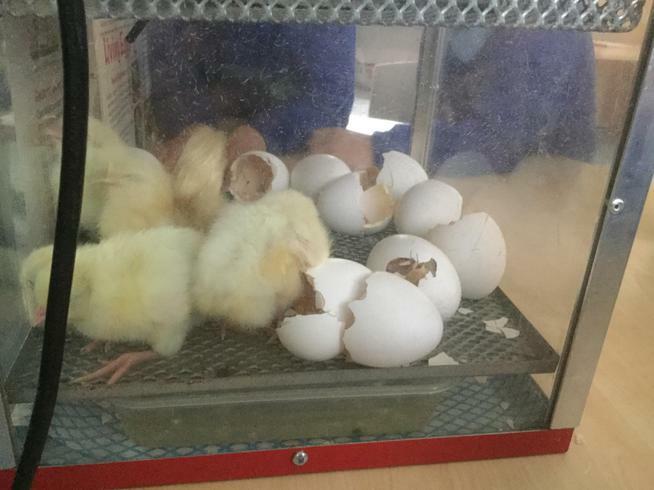 This week has been very exciting in Nursery, we have had new arrivals... 10 eggs ! 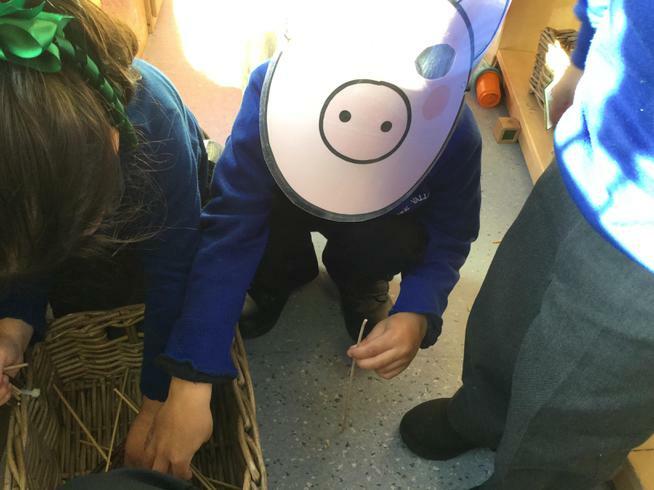 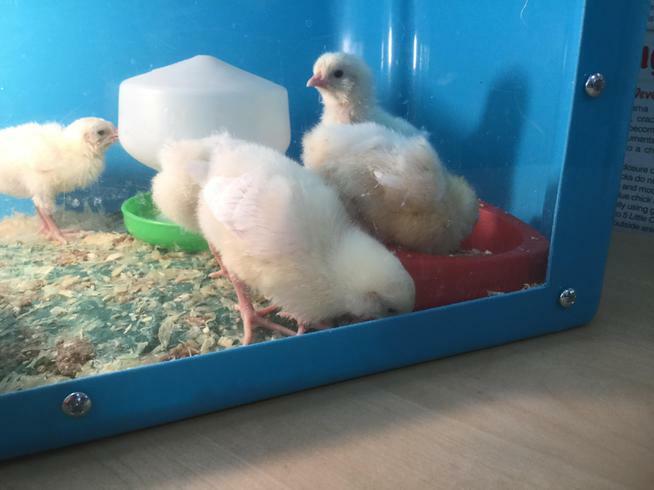 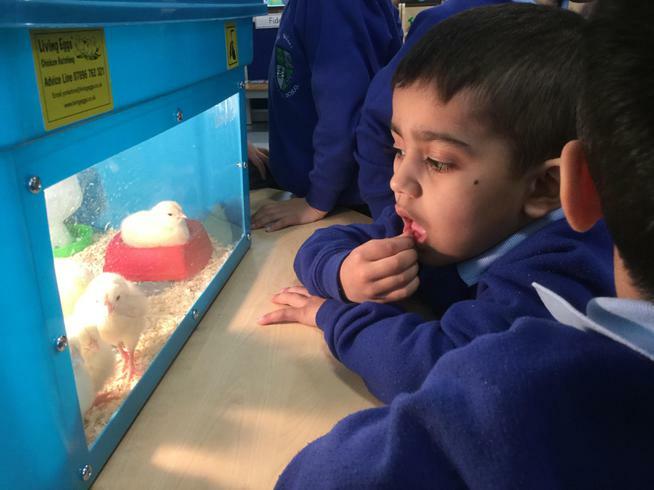 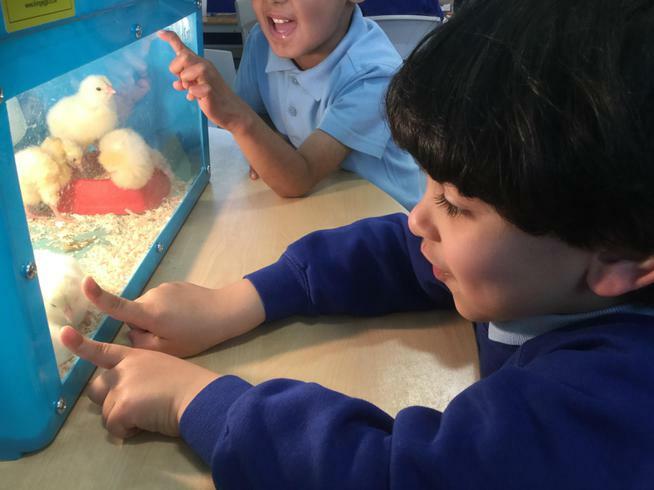 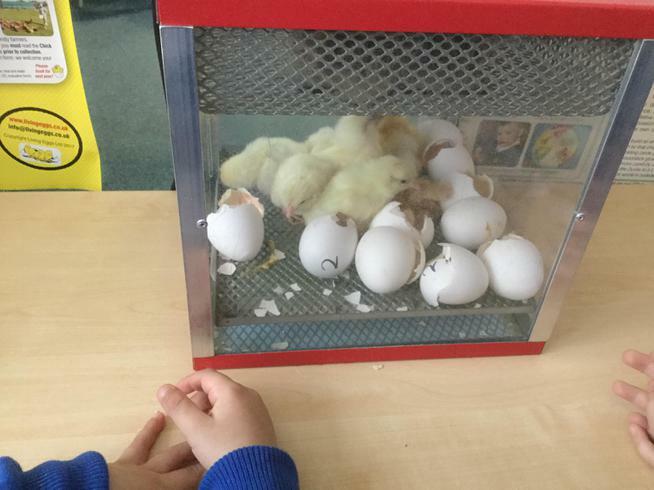 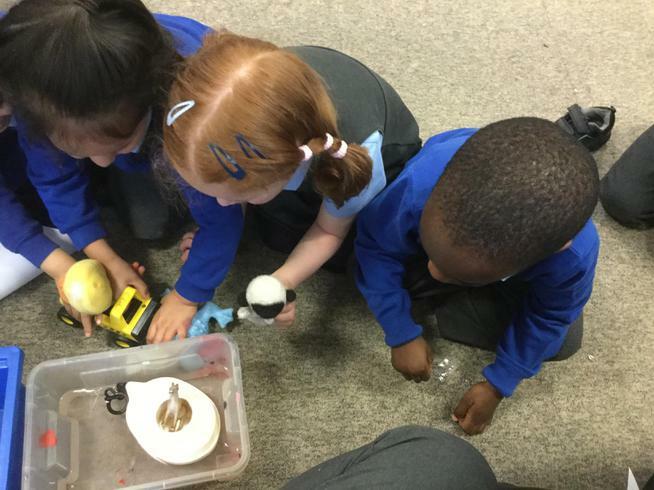 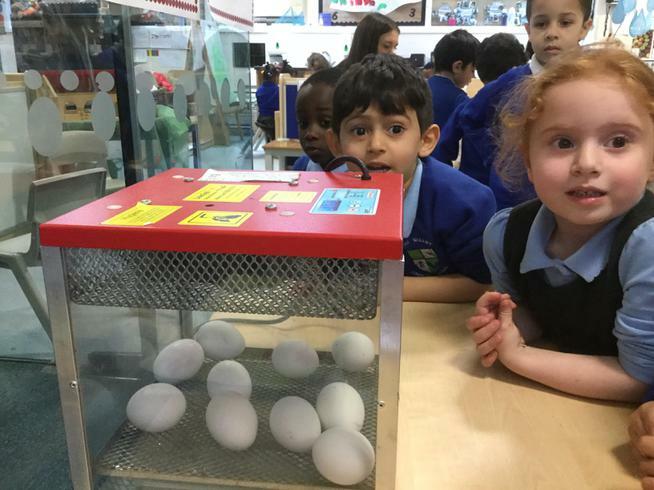 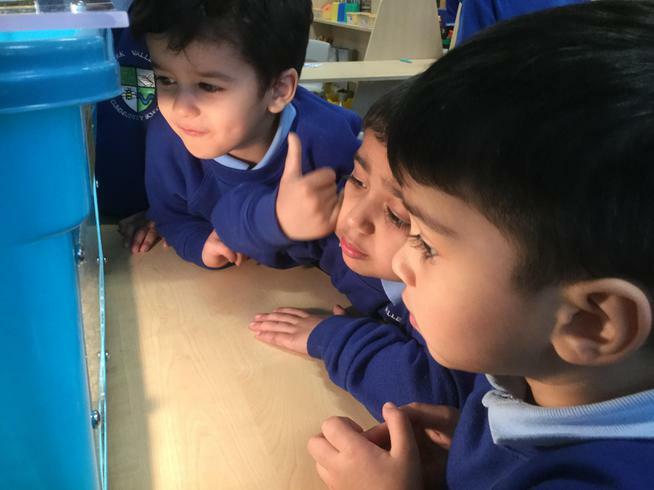 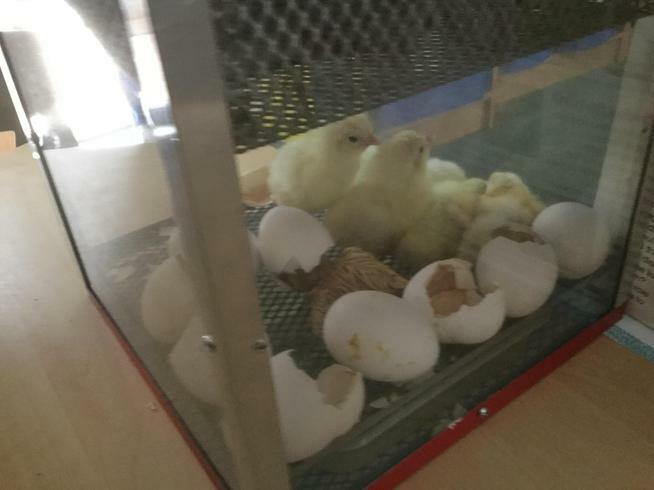 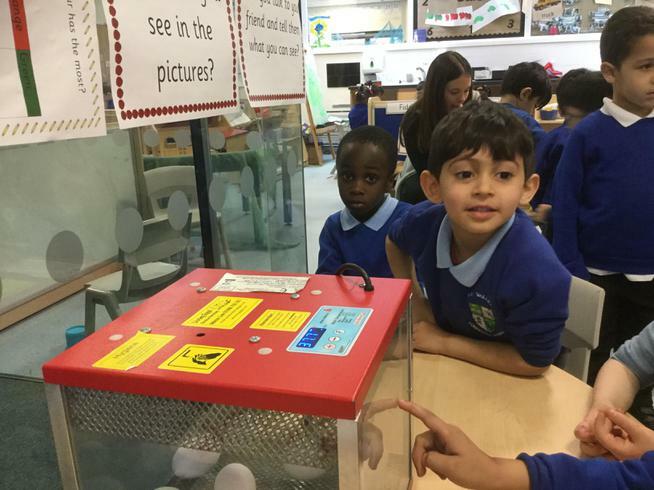 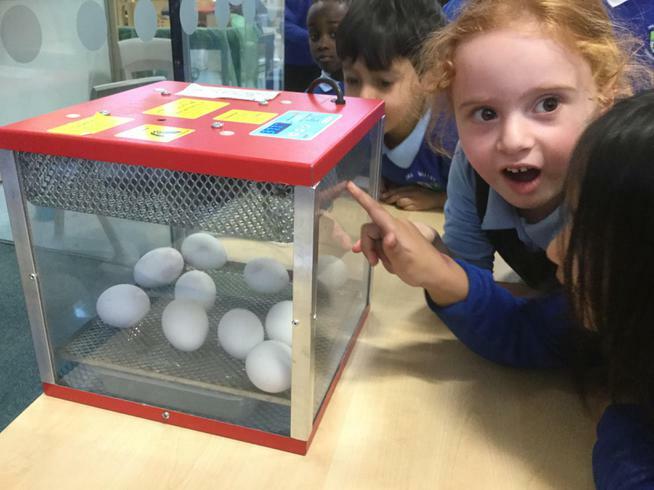 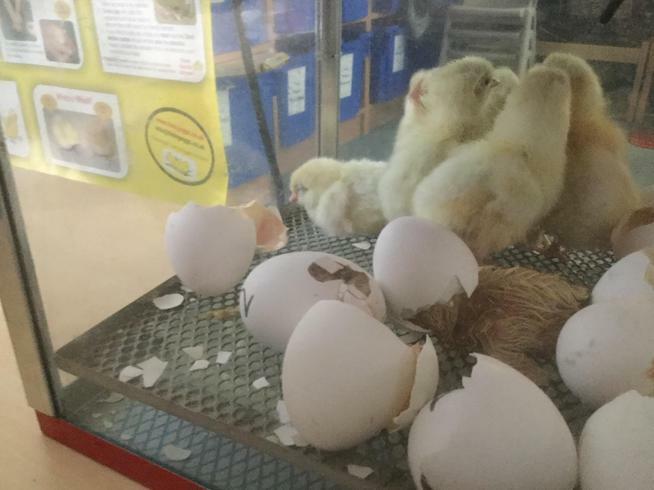 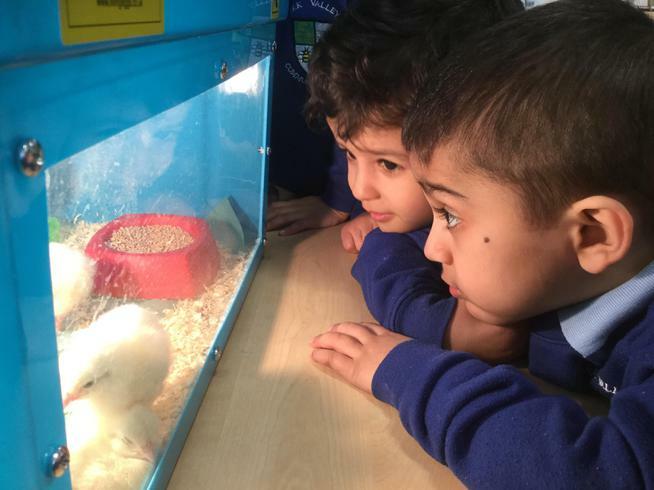 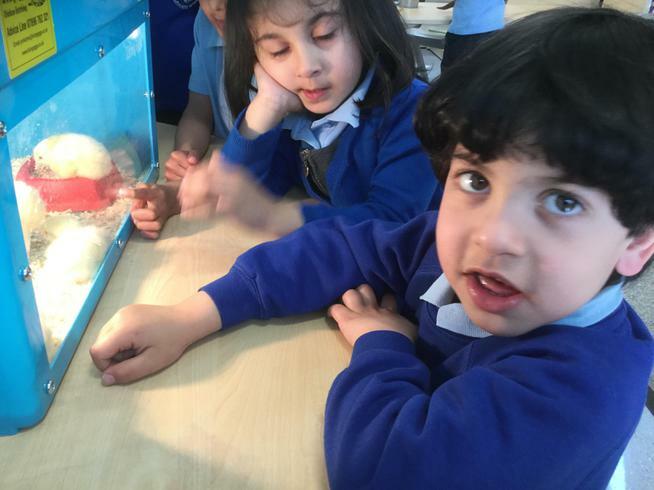 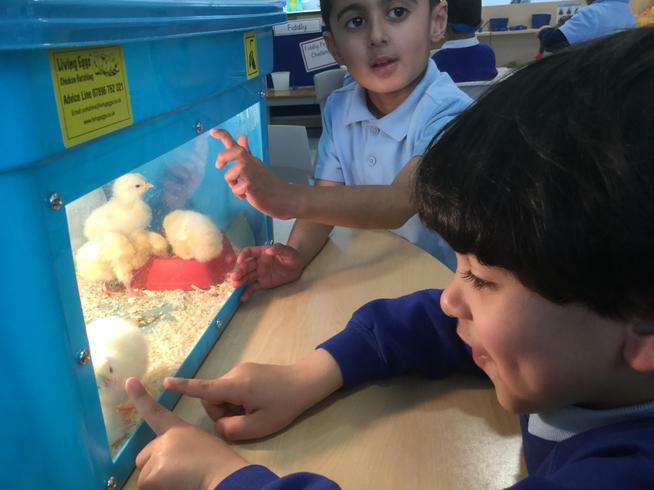 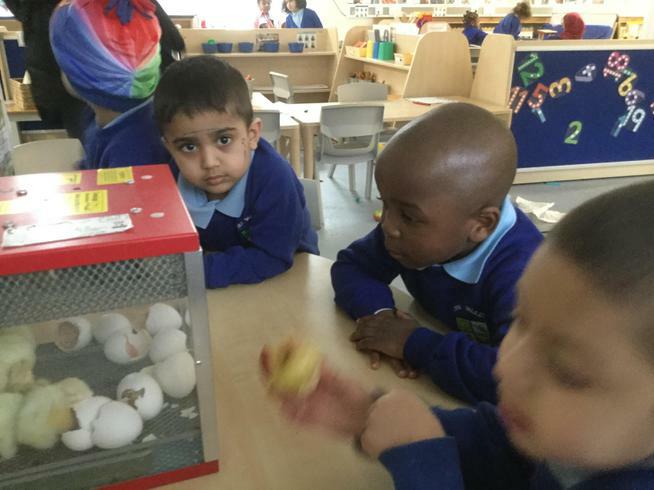 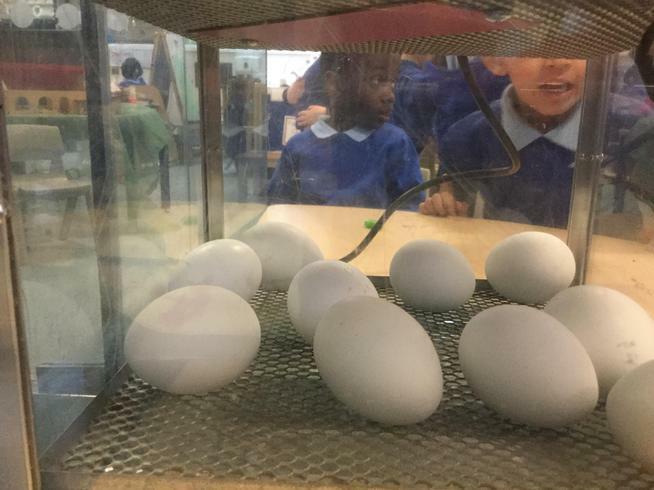 The children are very excited about watching these hatch and seeing the baby chicks grow. 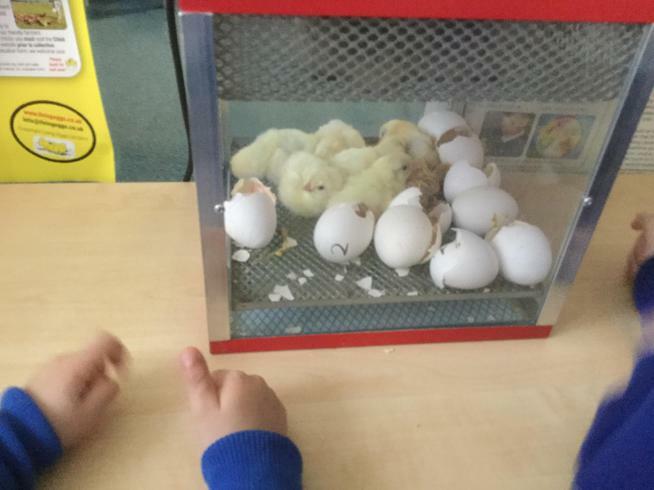 We will gets lots of fantastic learning from this we can't wait for our first egg to hatch. 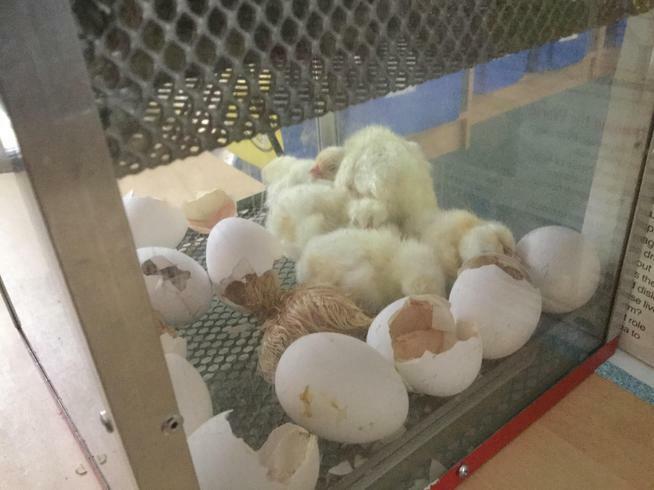 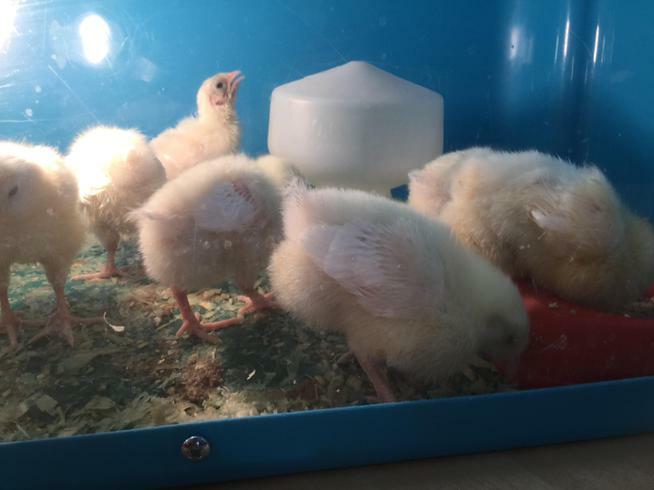 Please feel free to call in and see our eggs and chicks they are just adorable ! 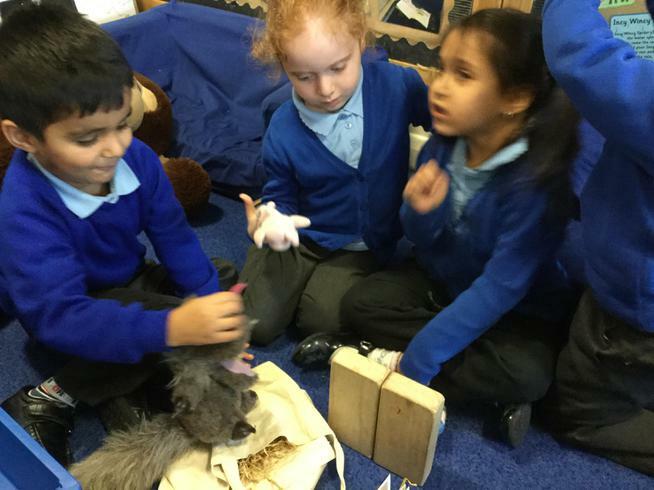 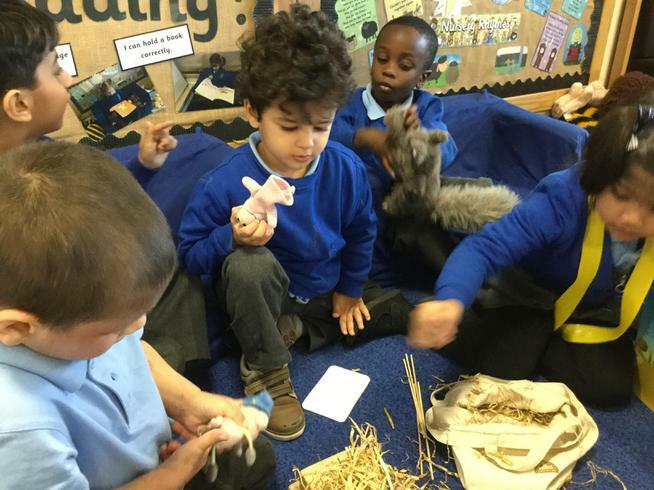 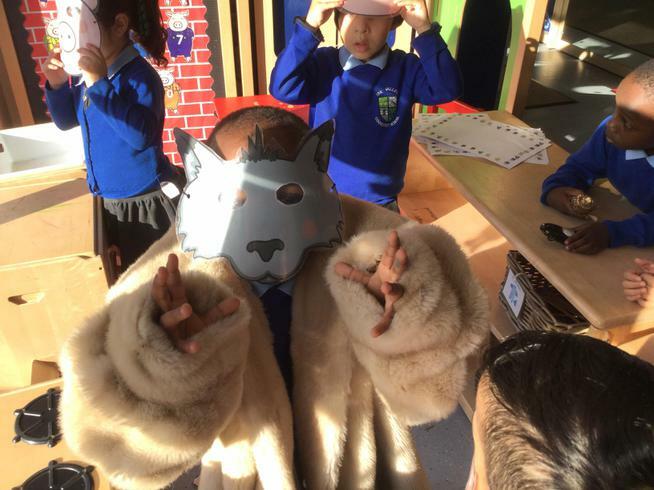 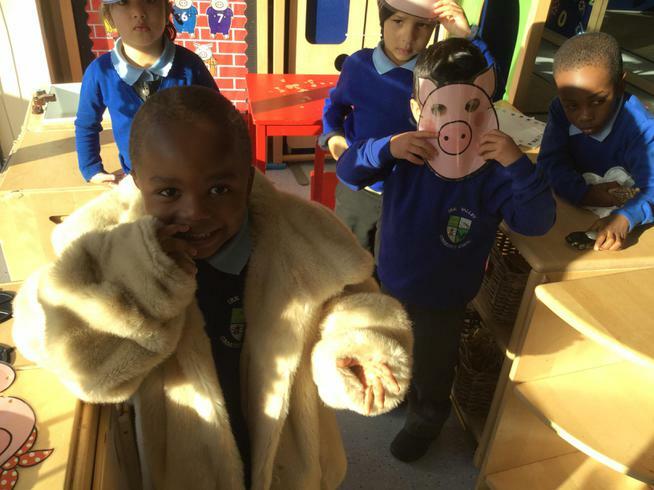 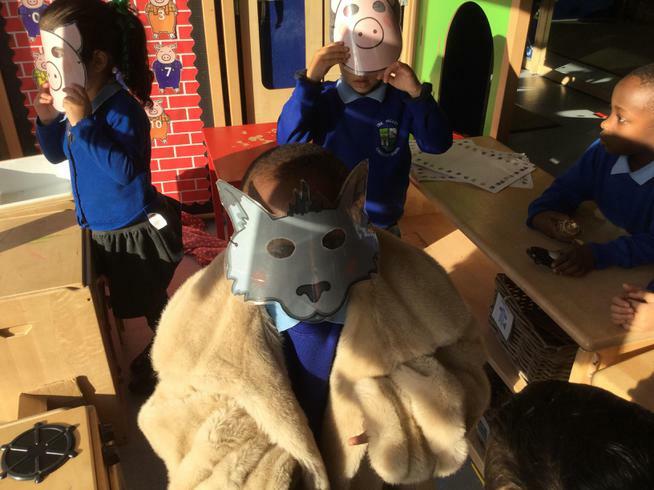 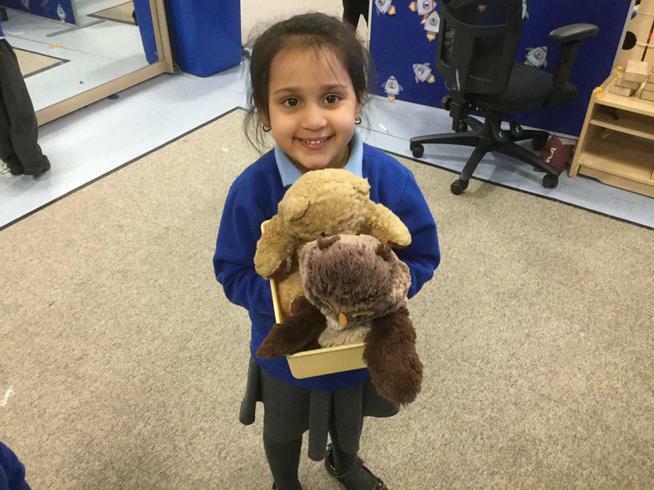 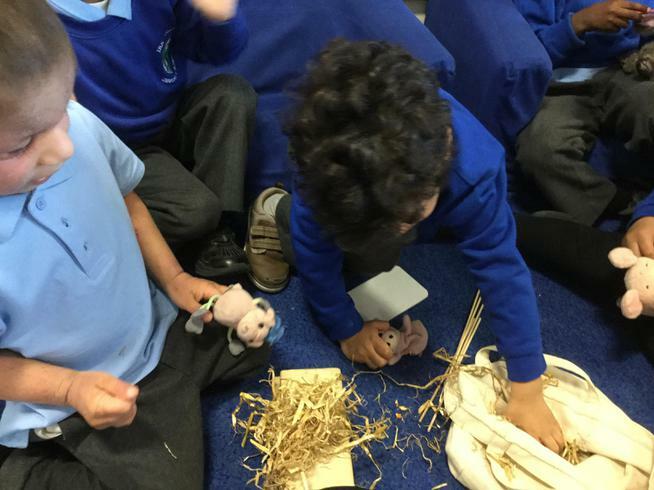 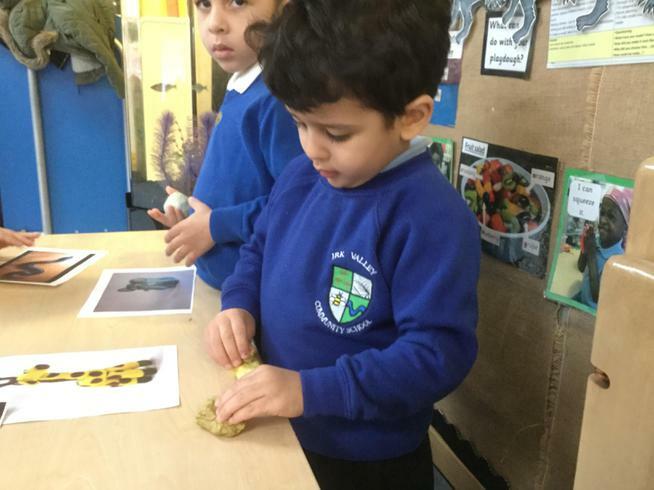 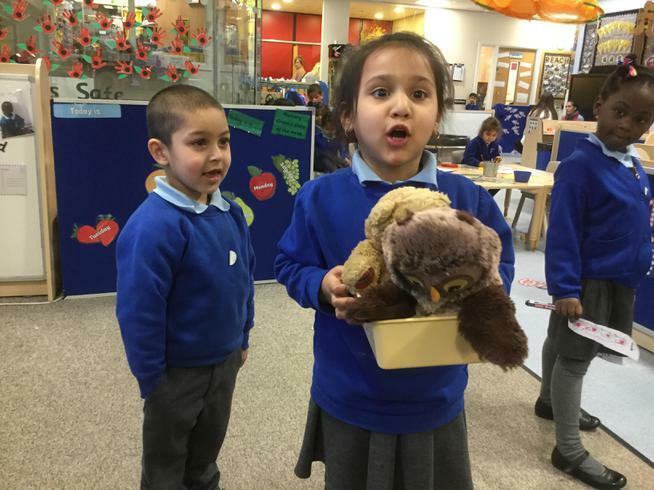 We have had a great time already this half term learning all about Animals. 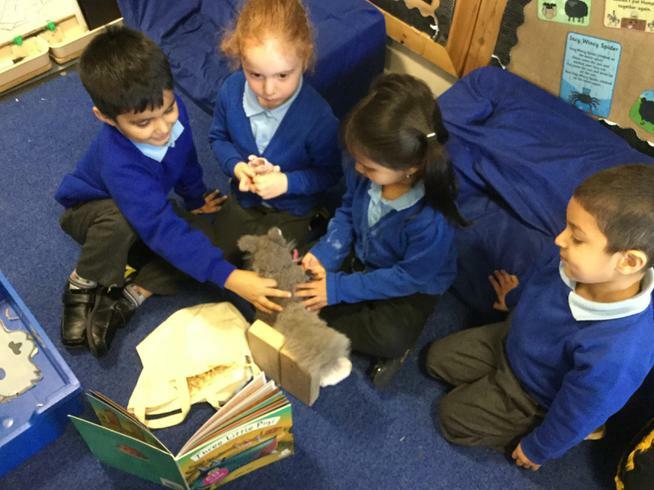 We have a vets role play area and are ready lots of exciting books such as 'Dear Zoo' . 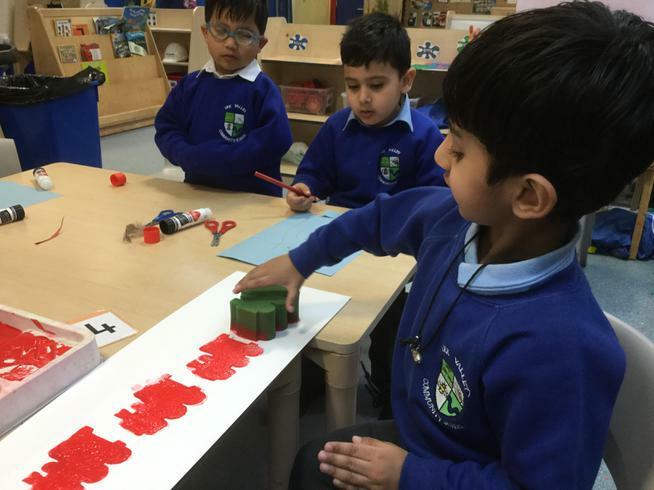 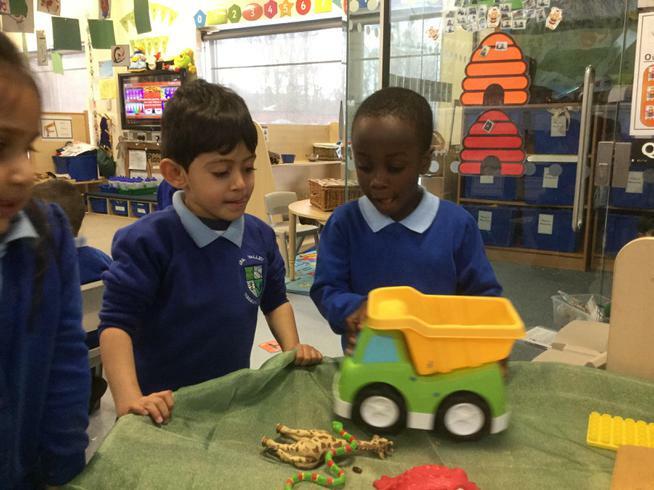 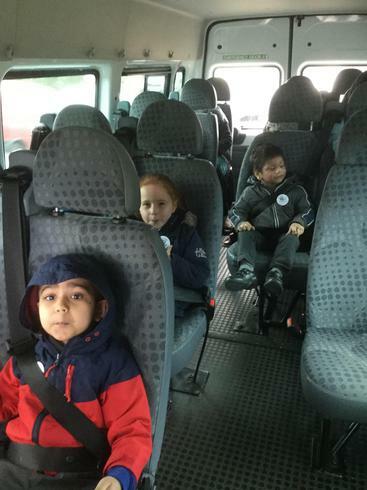 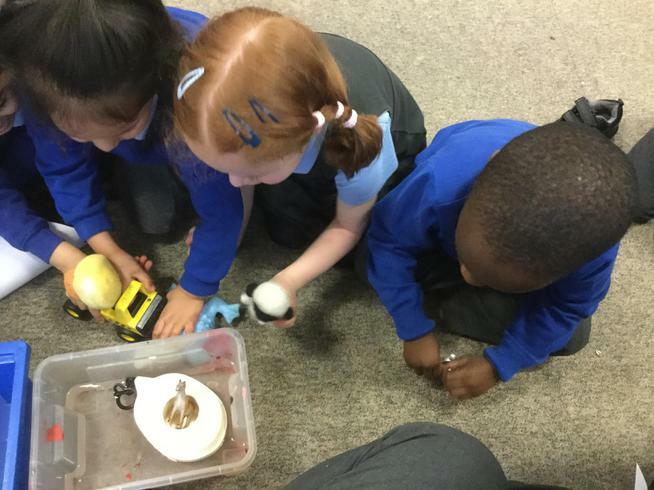 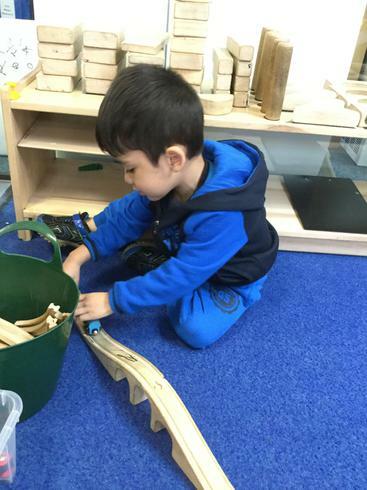 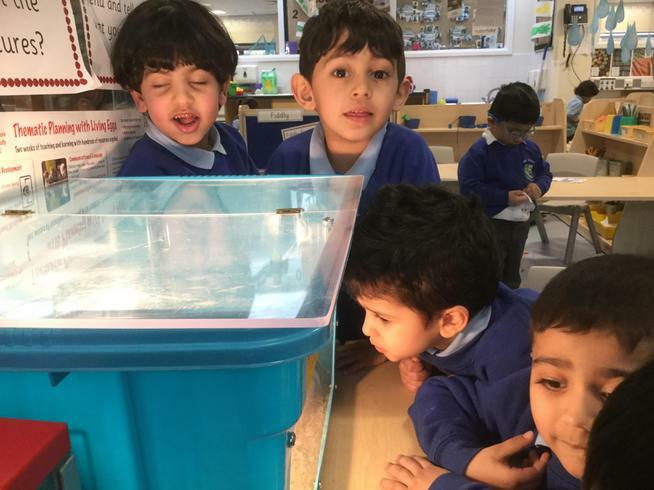 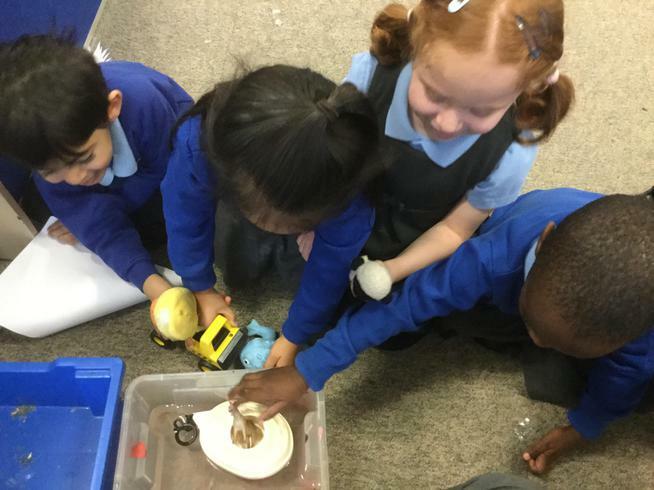 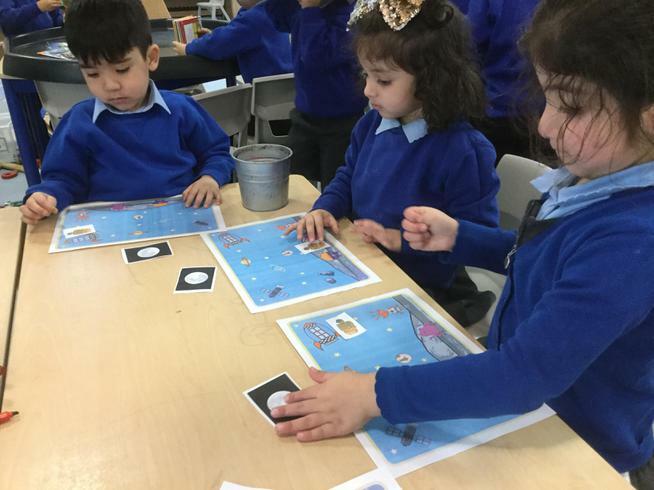 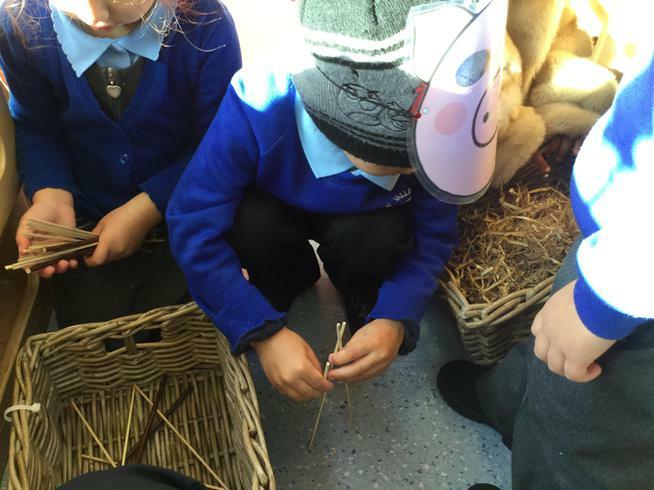 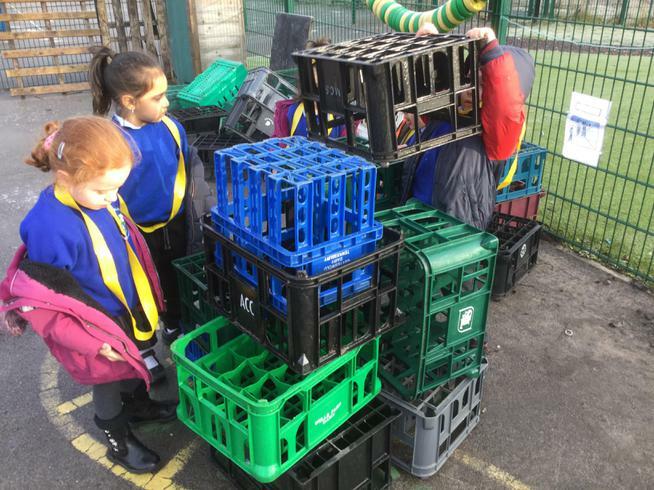 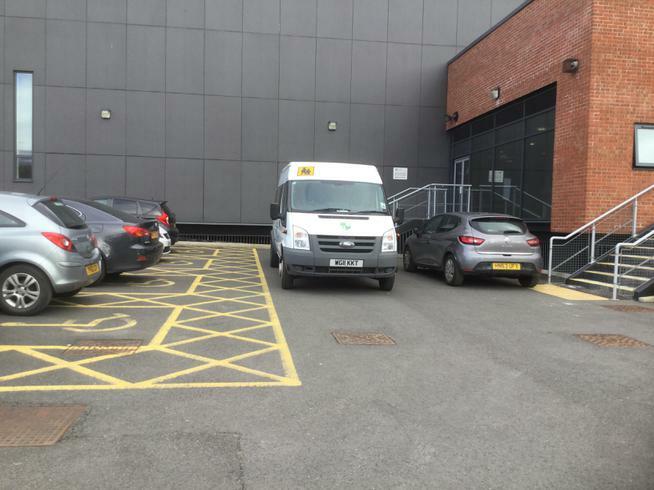 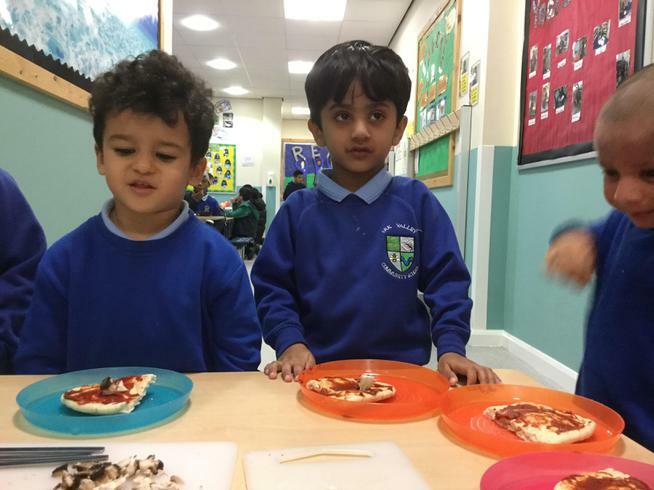 We have had a busy start to our spring term, learning about transport. 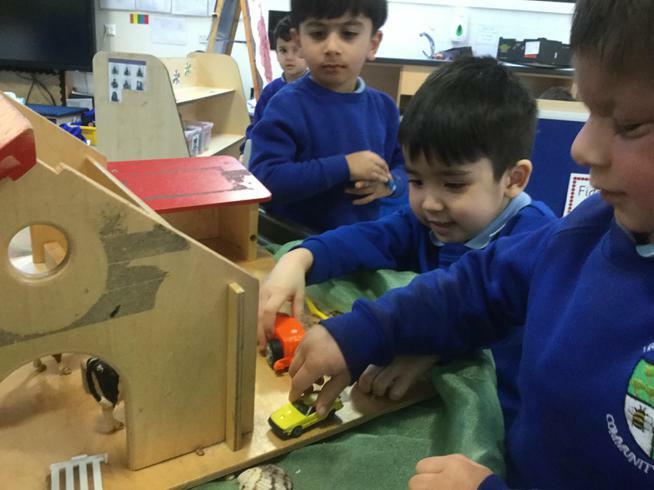 We have a garage where we can build and fix cars. 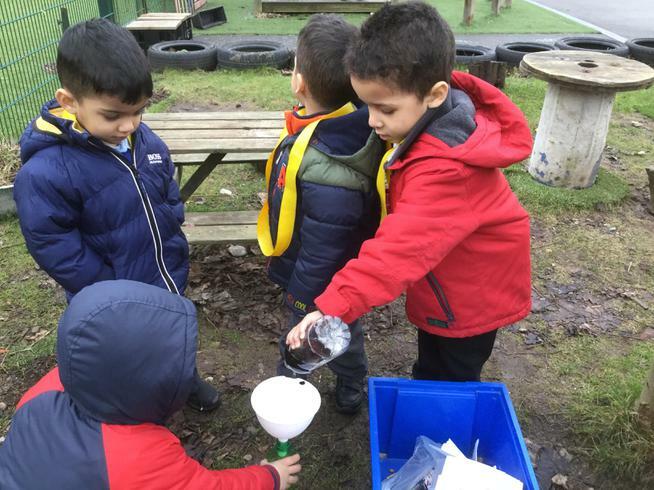 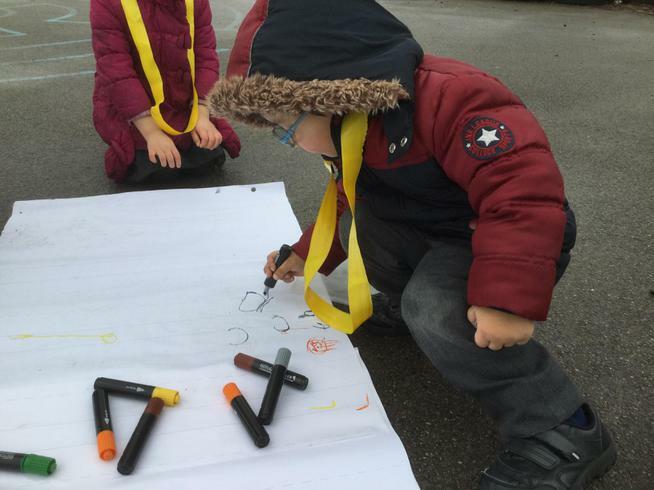 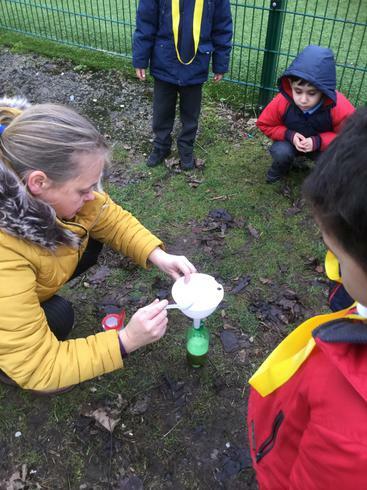 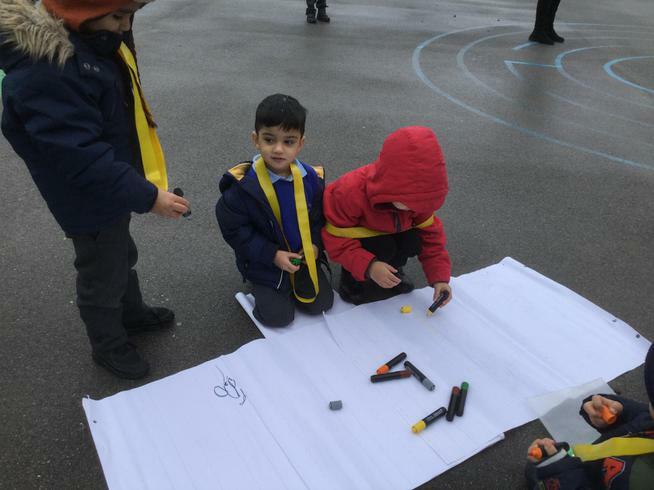 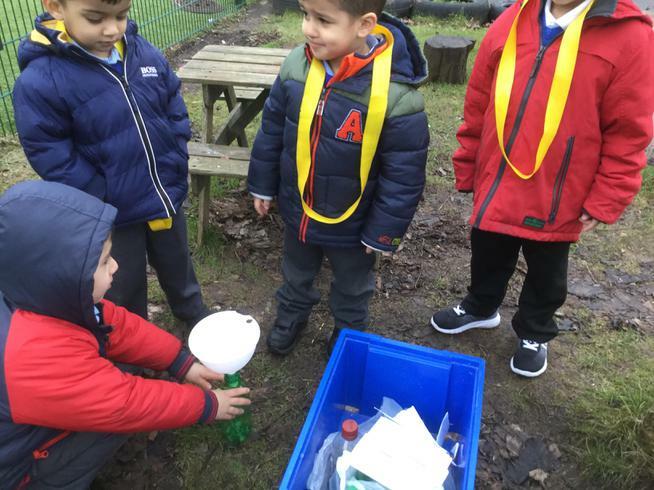 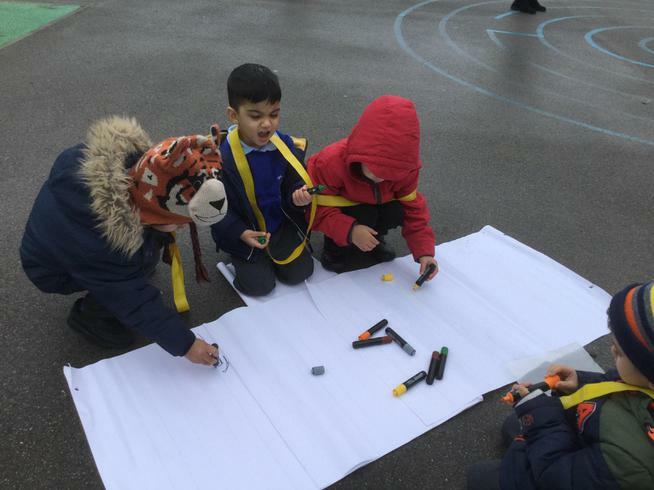 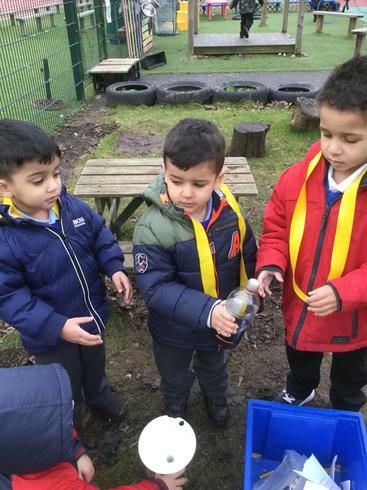 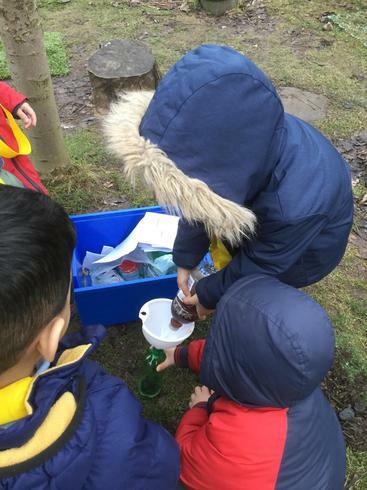 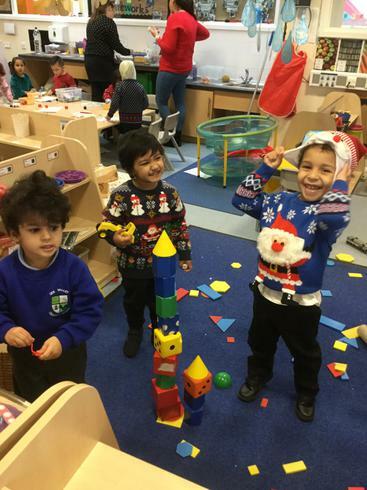 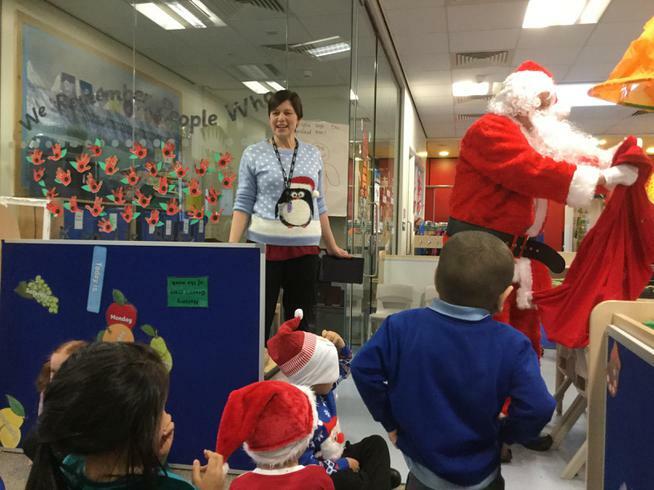 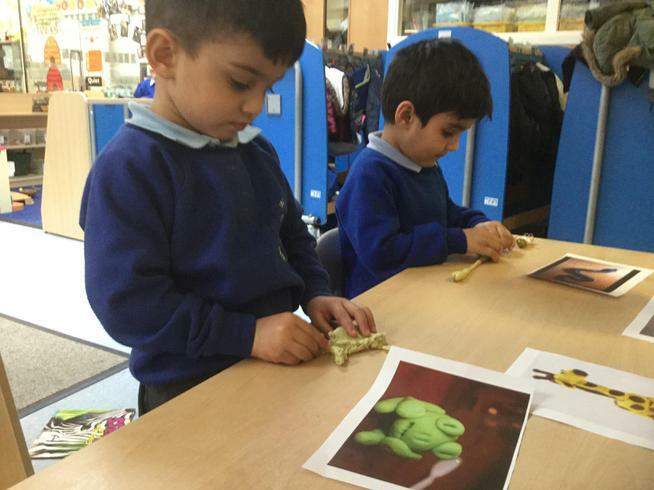 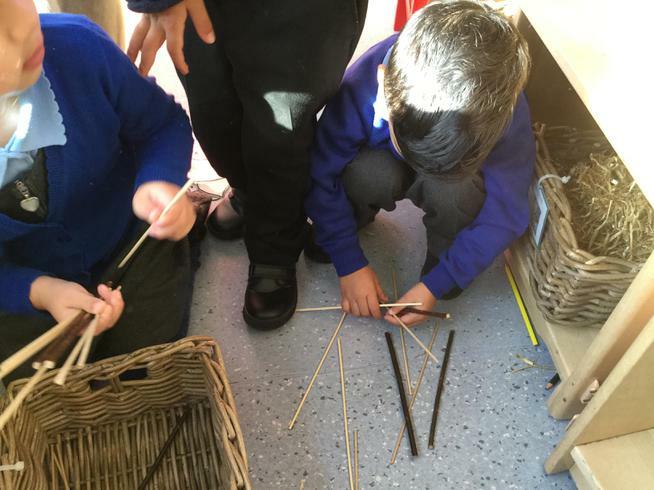 We have read 'Whatever next' we even build our own rocket and watched them blast off ! . 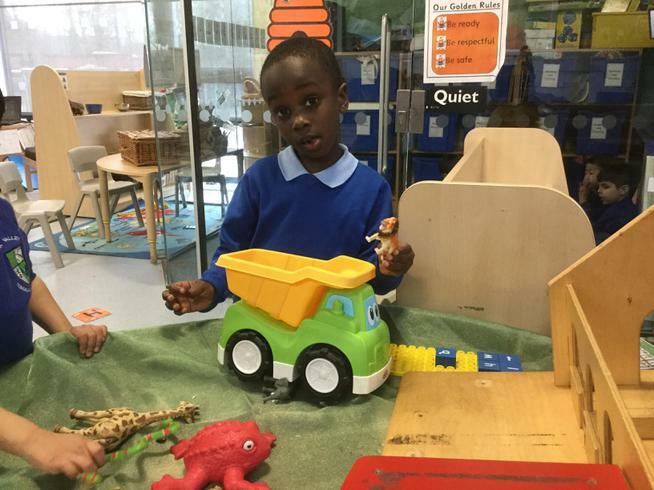 We are now learning about the story 'Duck in a truck' this has lots of rhyming words maybe we can practise at home. 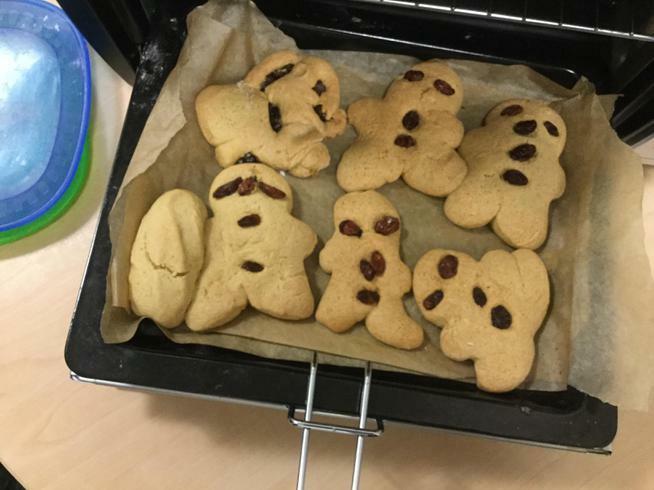 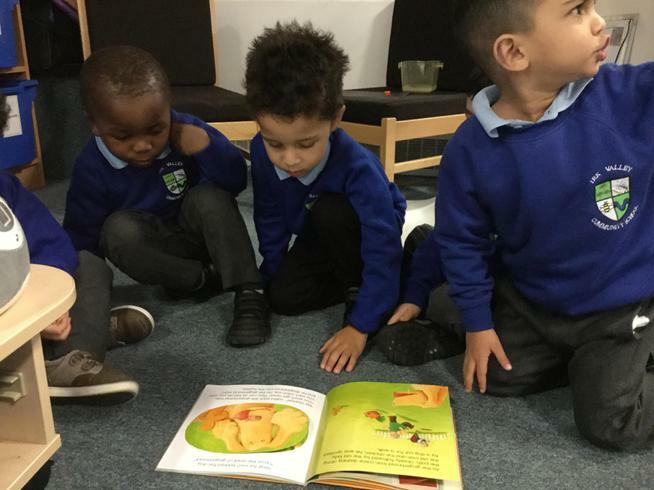 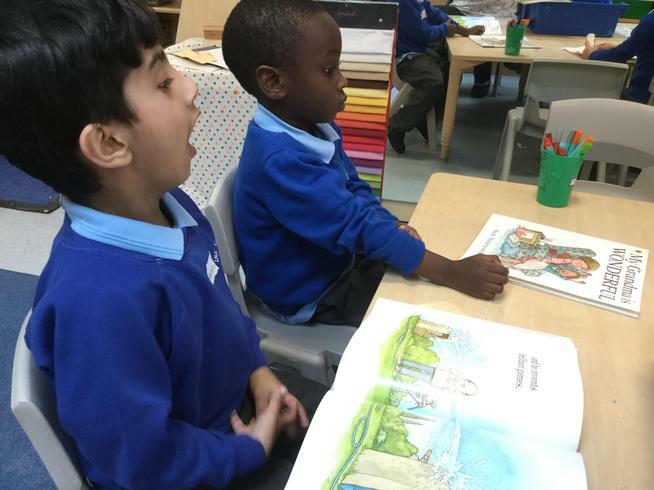 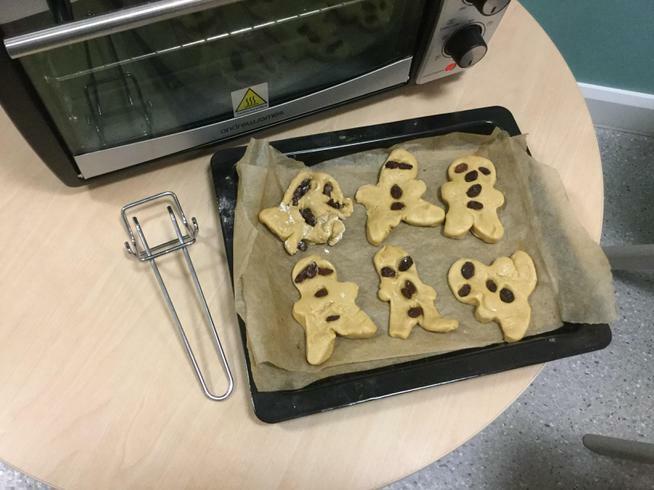 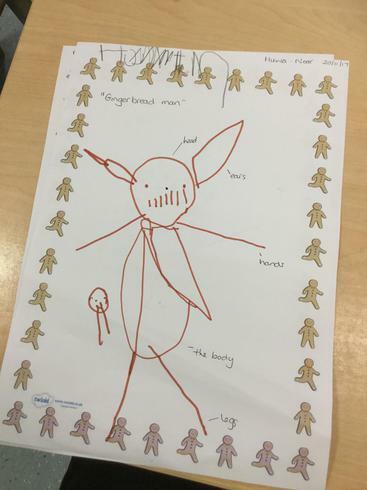 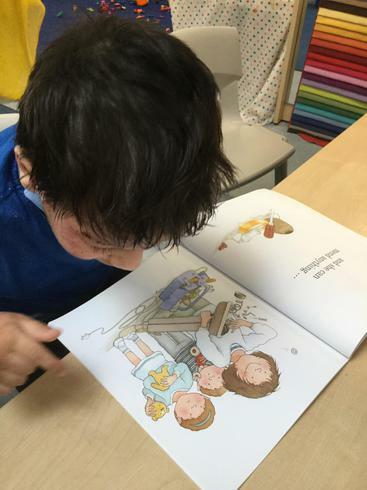 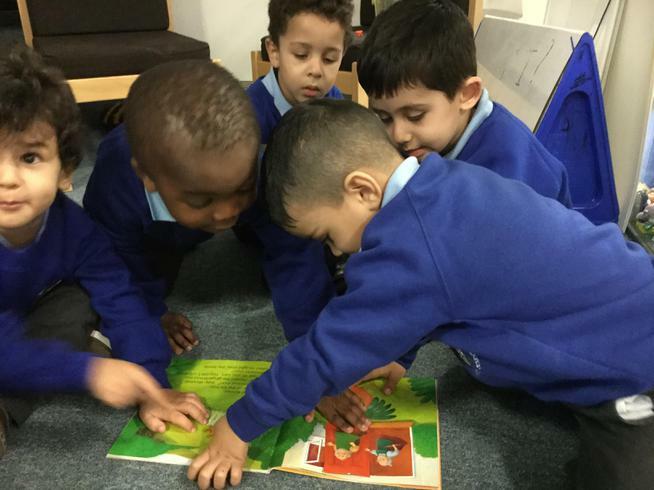 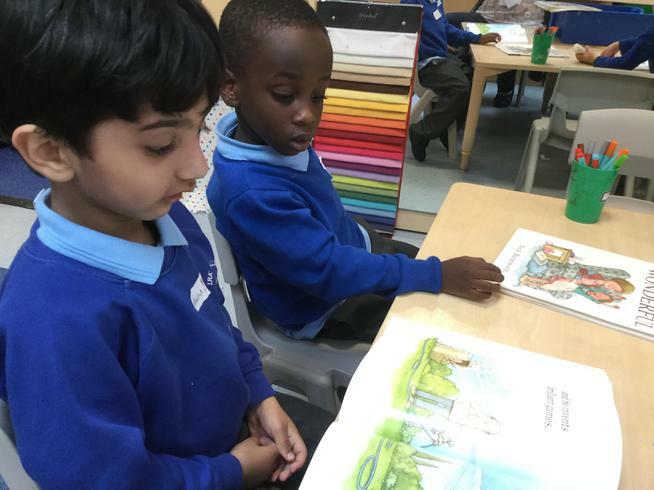 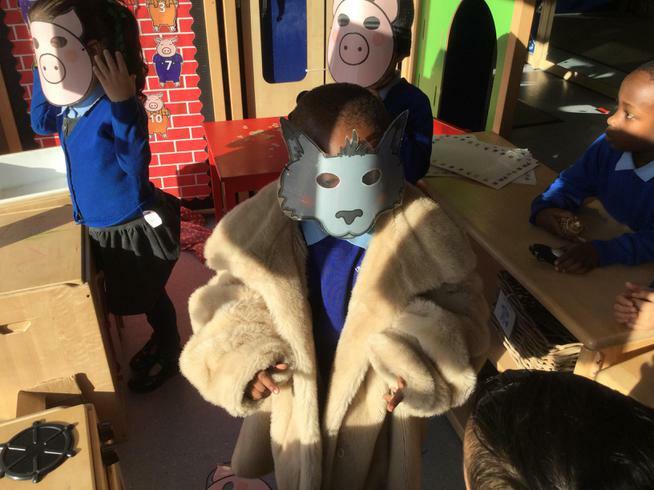 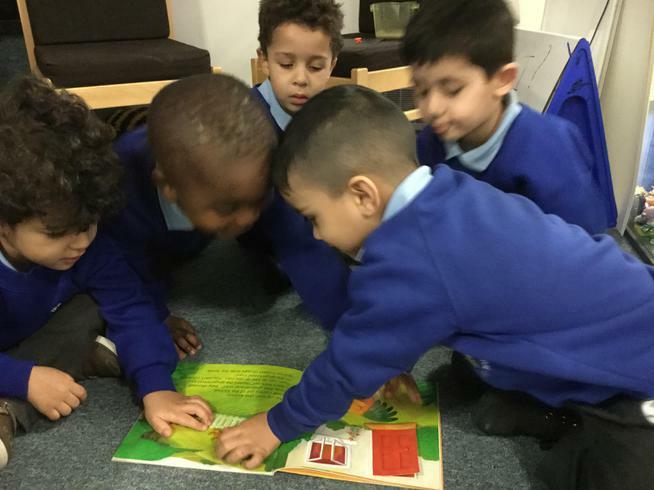 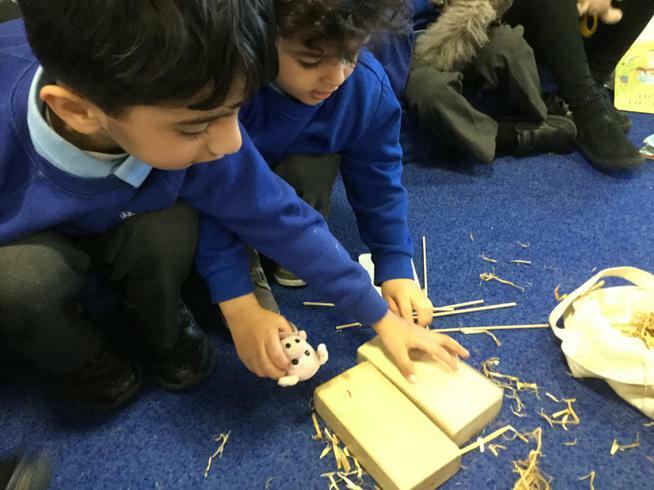 We have loved learning all about different fairytales this term our literacy books have been, 'Ginger bread Man' , ' Red Riding Hood' and ' The Tree Little Pigs'. 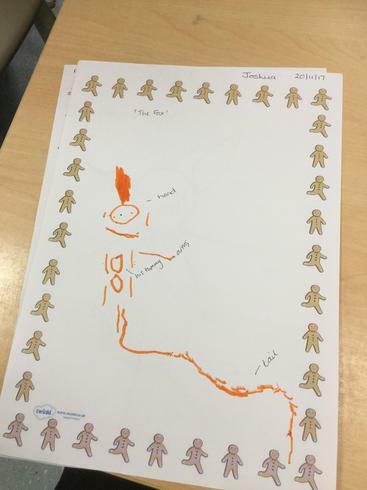 We have learnt new songs, baked Gingerbread, drawn our favourite Characters and lots more ! 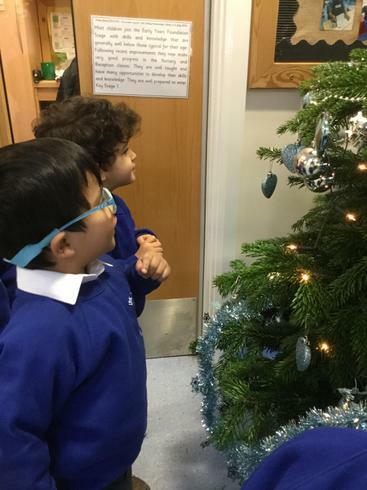 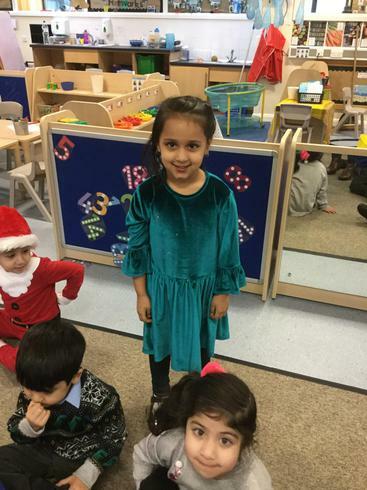 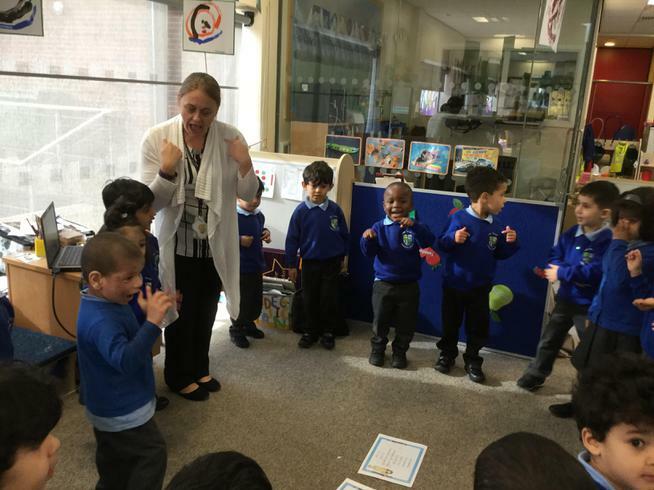 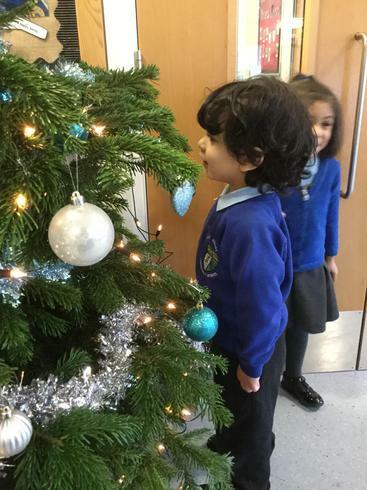 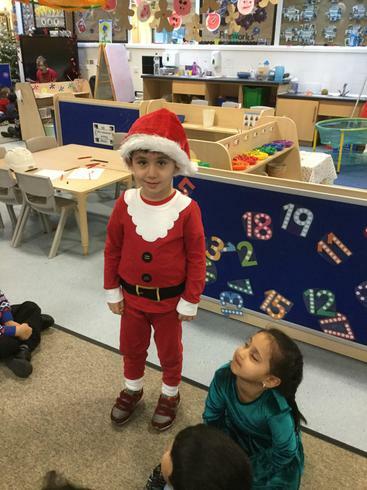 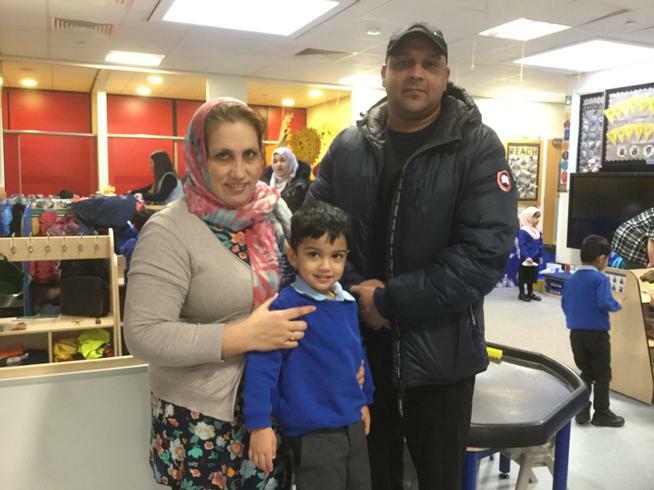 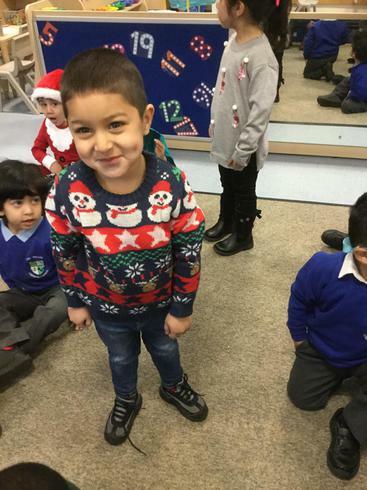 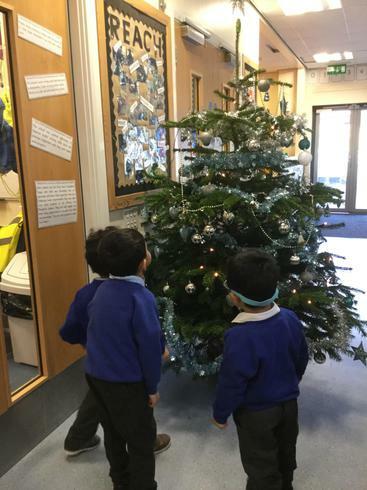 Celebrations week, we had a great time welcoming each other back after half term. 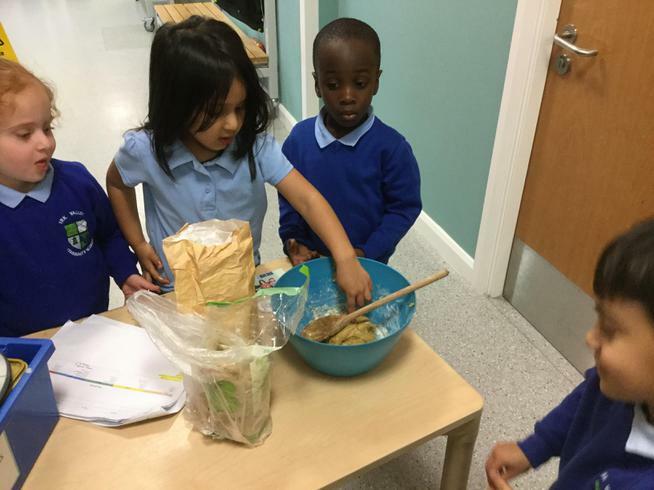 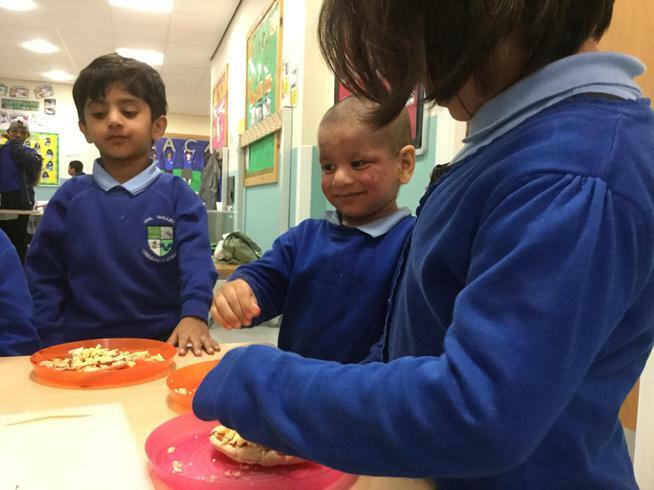 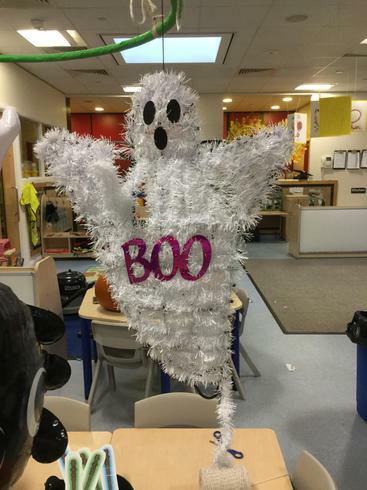 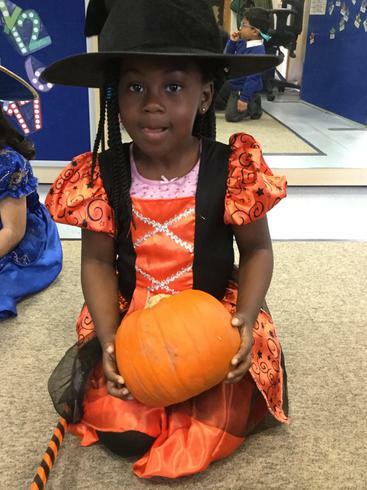 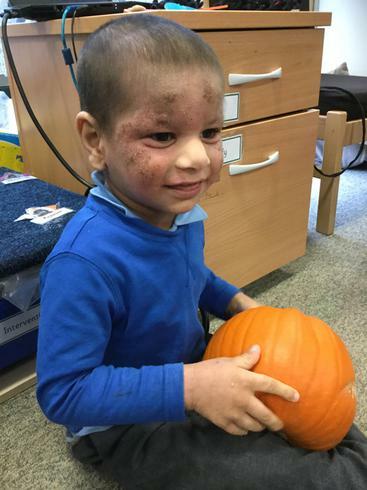 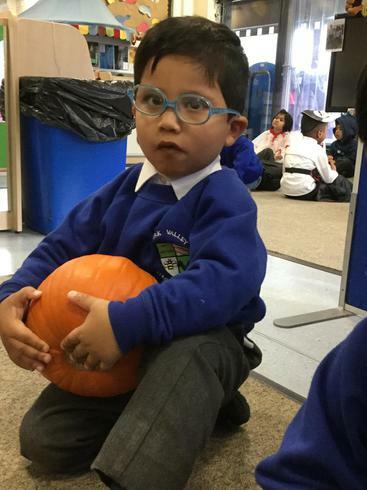 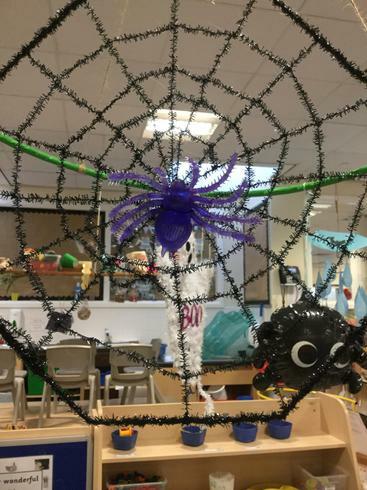 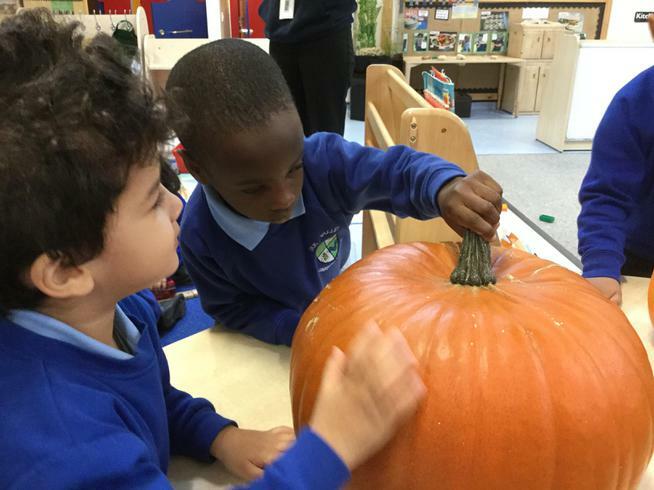 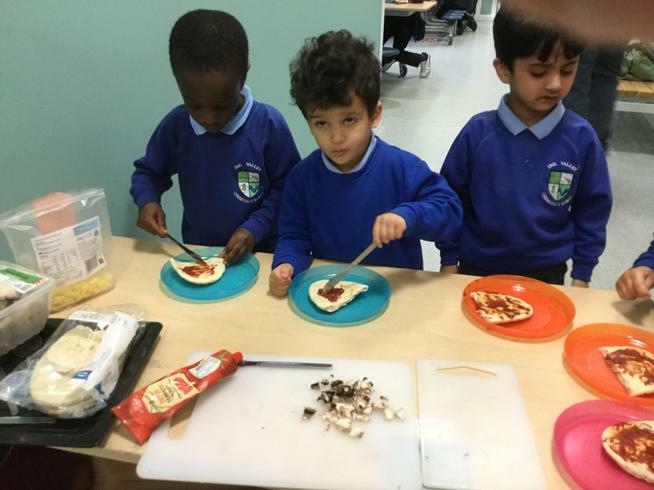 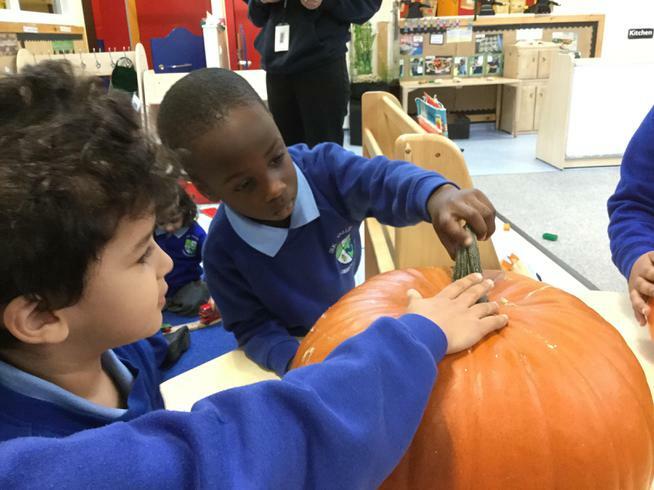 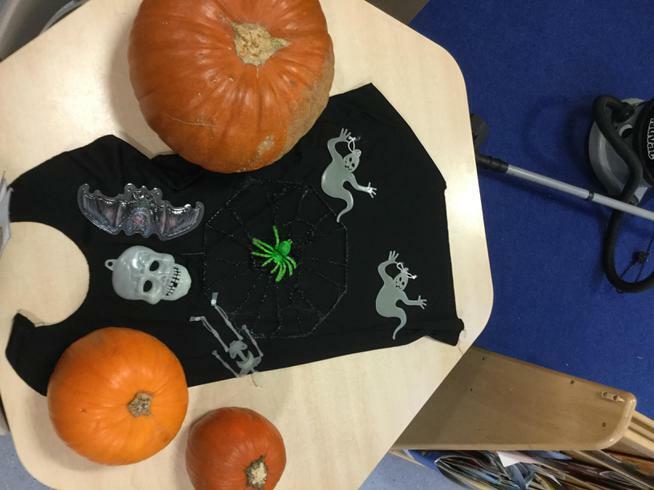 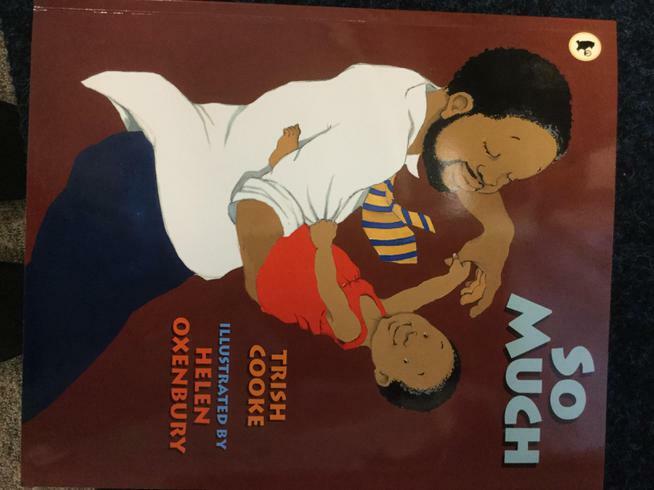 We have lots to celebrate this week with 'Black History Day', ' Halloween' and ' Bonfire Night'. 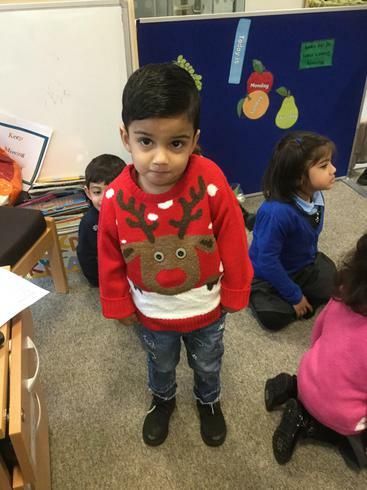 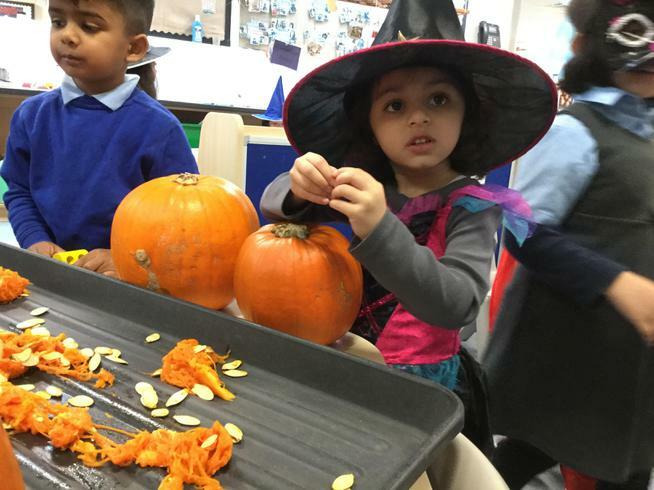 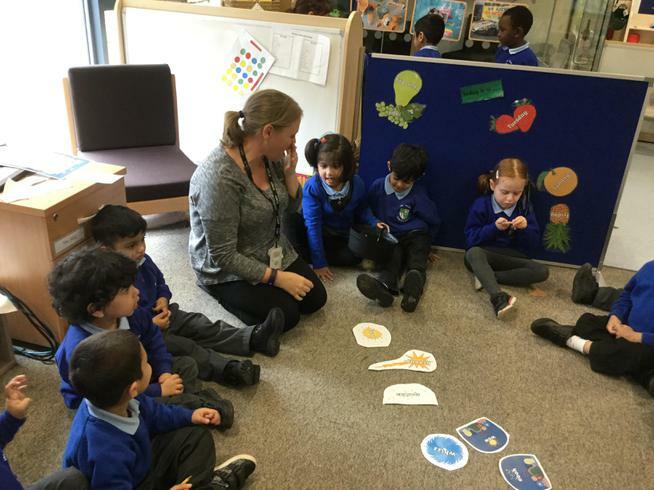 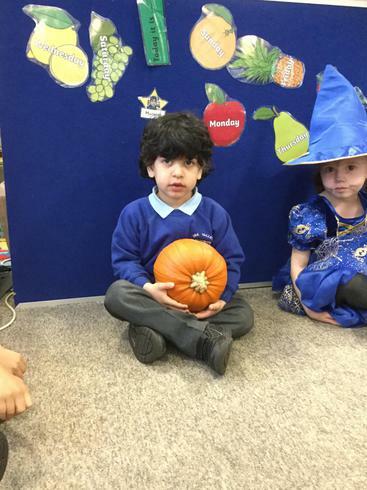 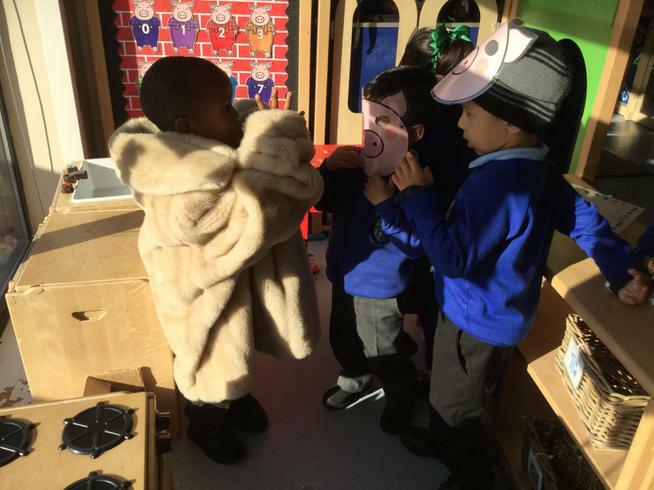 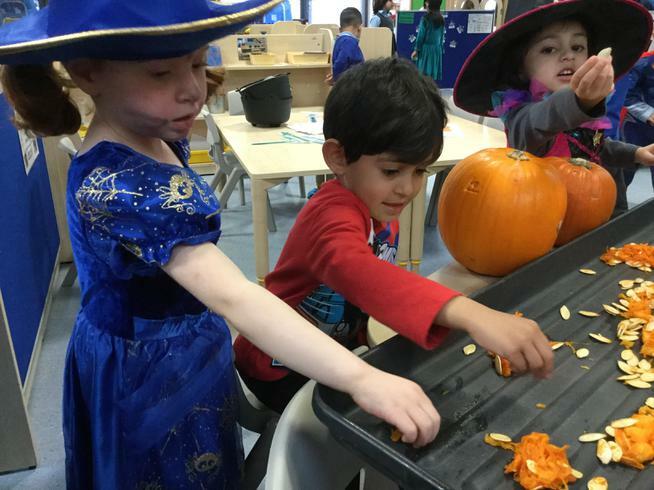 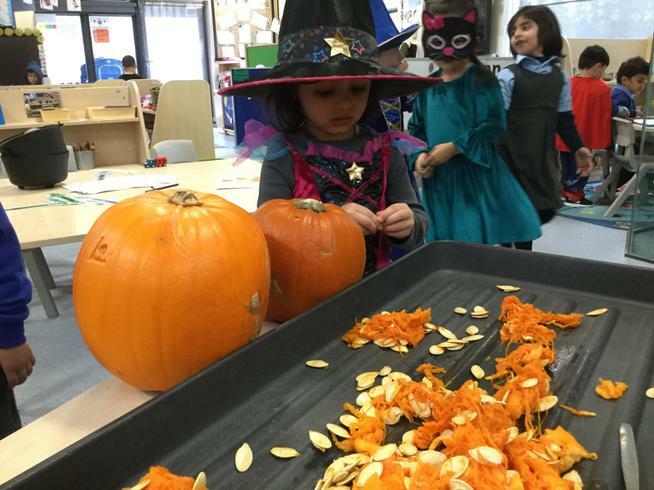 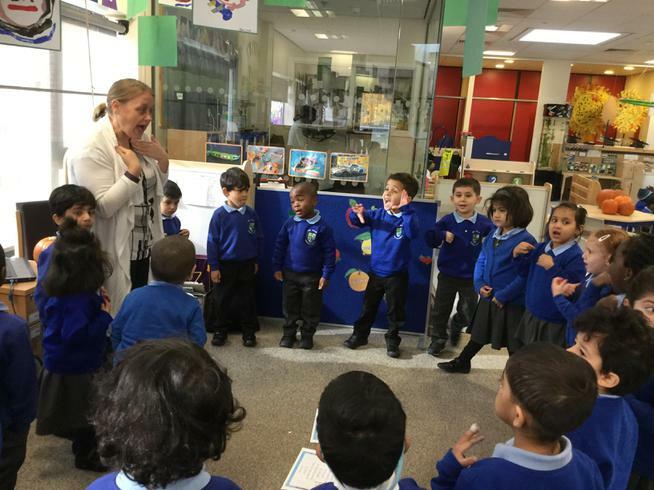 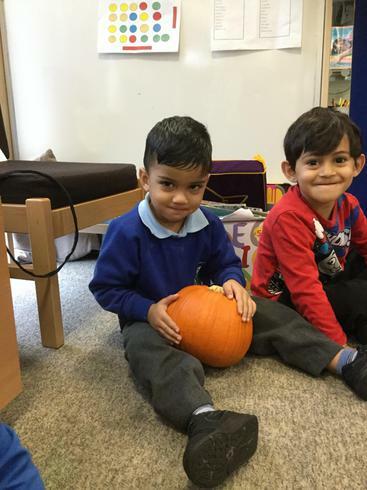 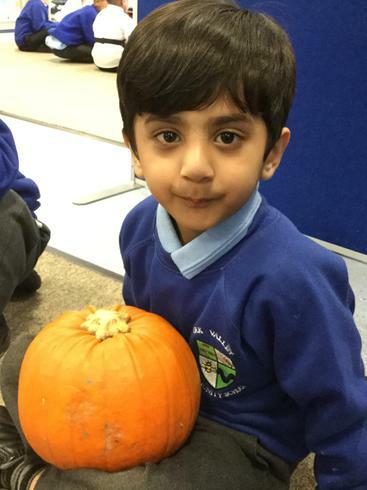 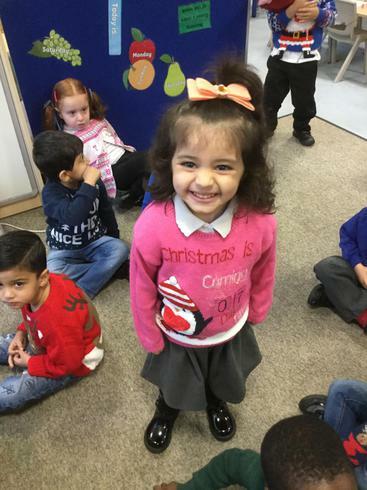 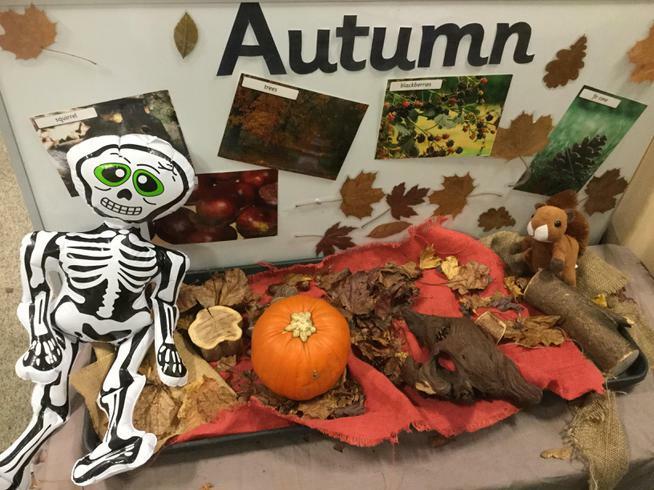 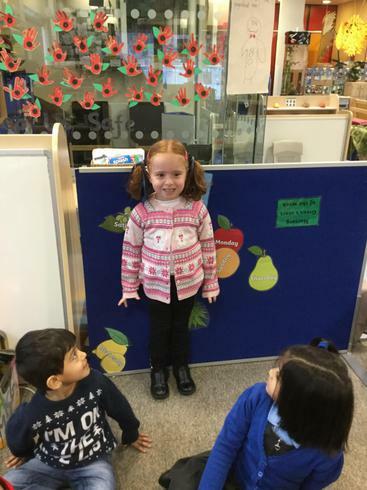 Autumn was a very busy time for us in Nursery, we learnt all about ourselves, each other and our likes and dislikes. 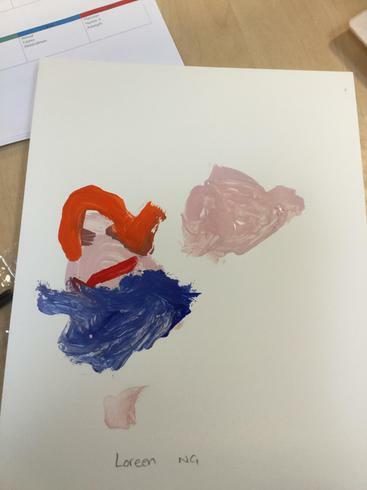 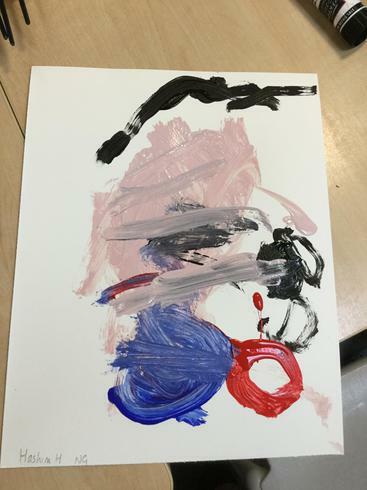 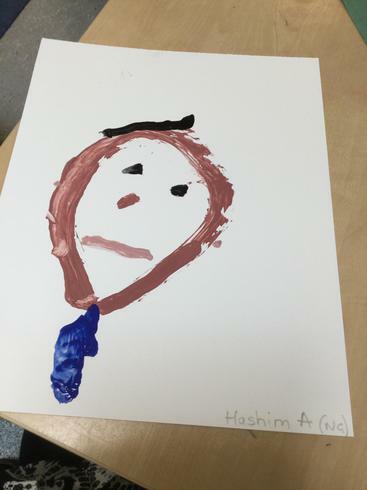 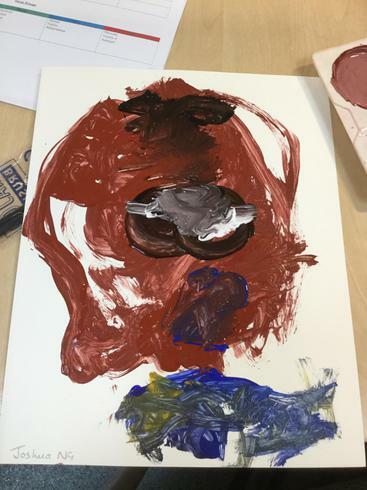 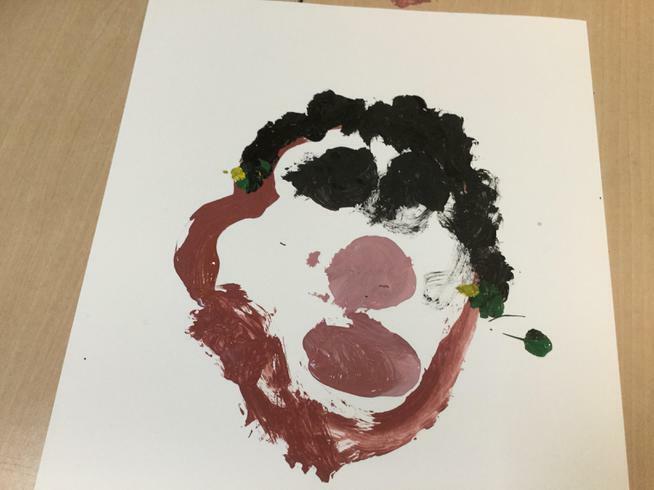 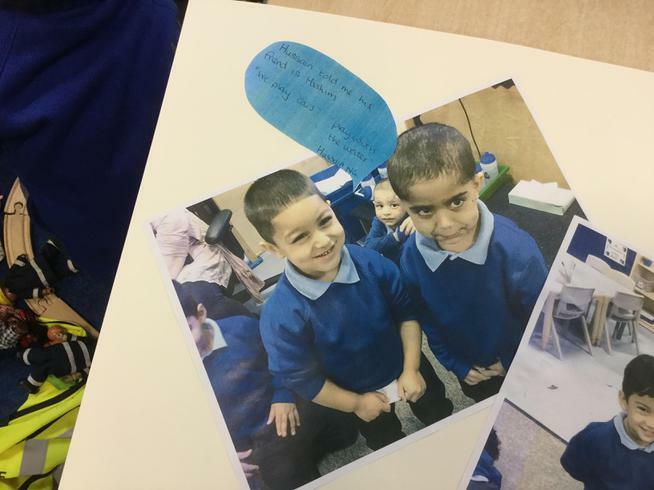 We have had great fun painting our portraites, talking about our friendships and family and deciding the things we like and dislike. 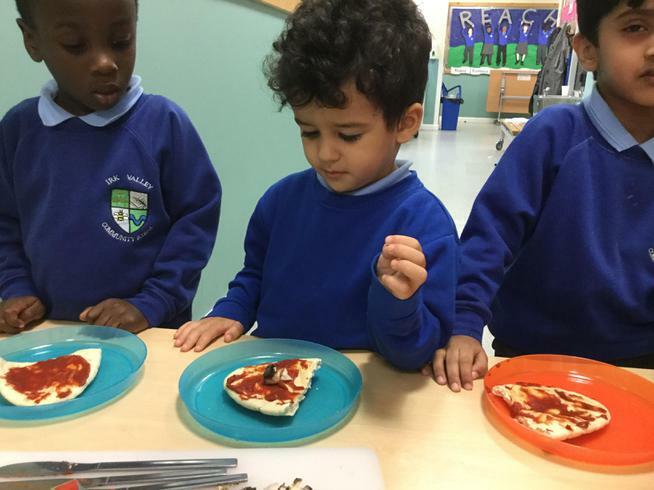 We all like pizza but we all like to put different toppings , what do you like on pizza ? 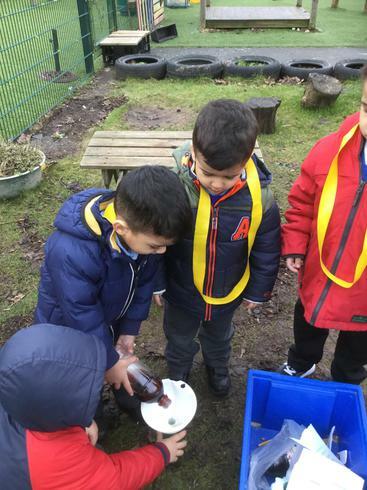 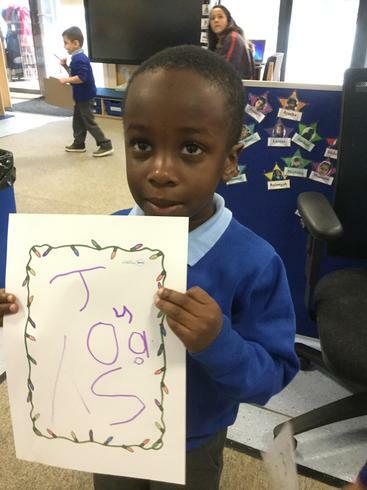 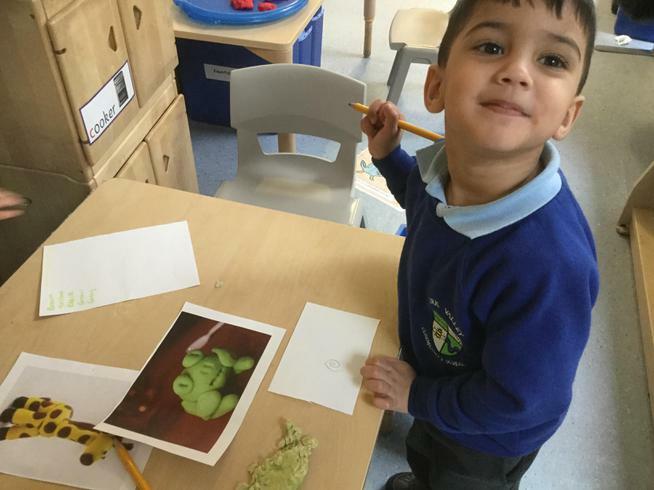 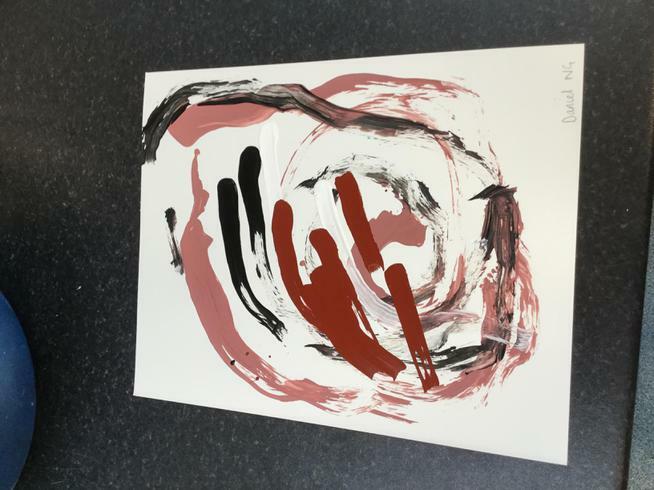 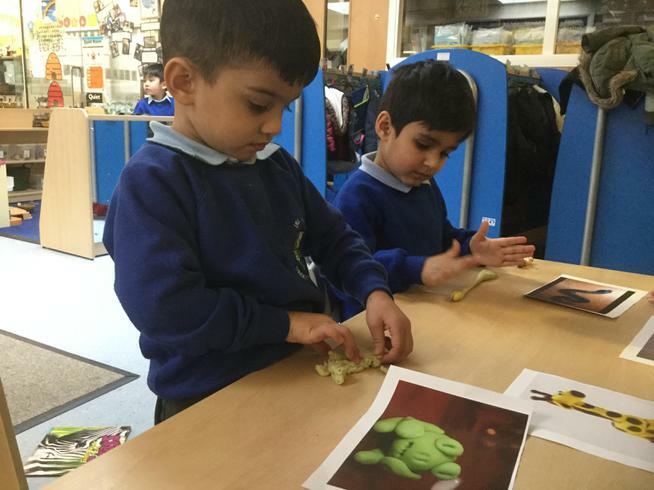 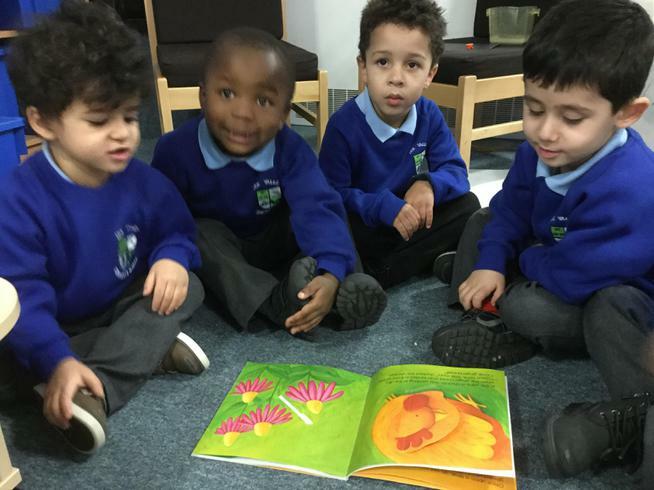 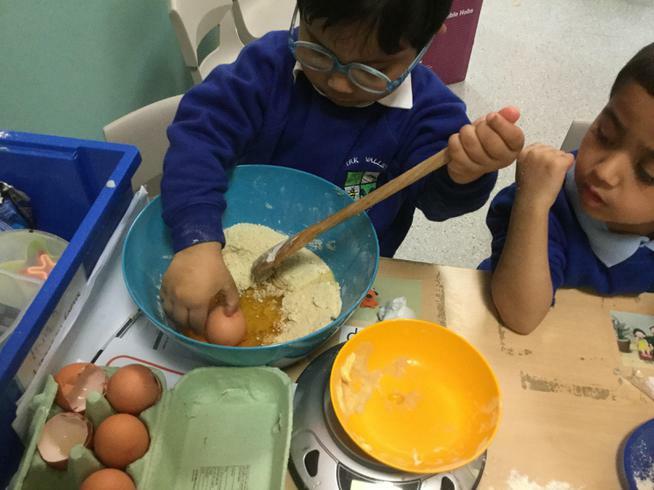 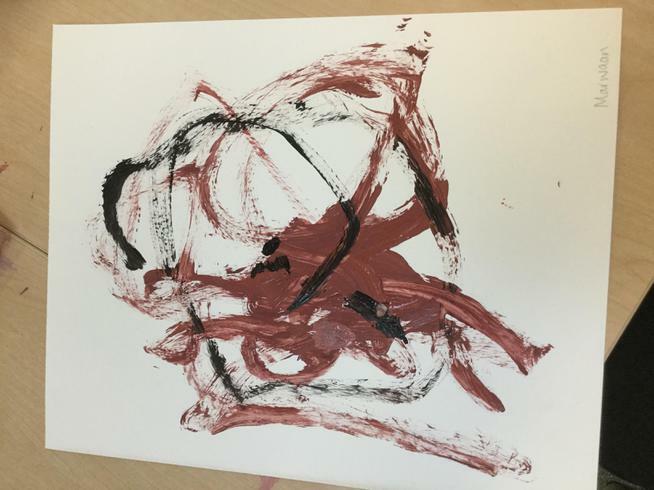 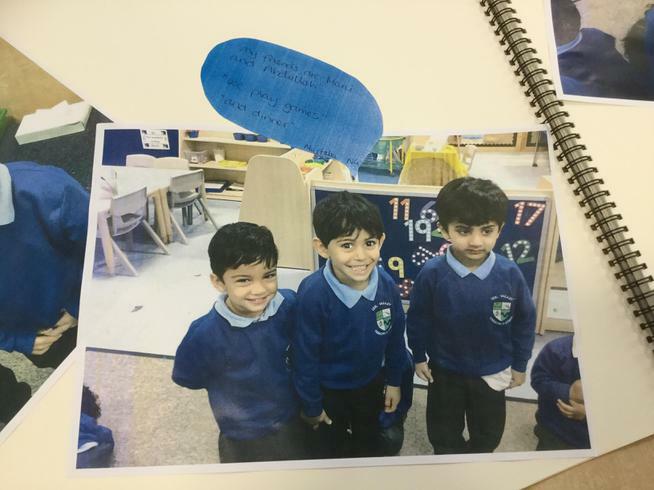 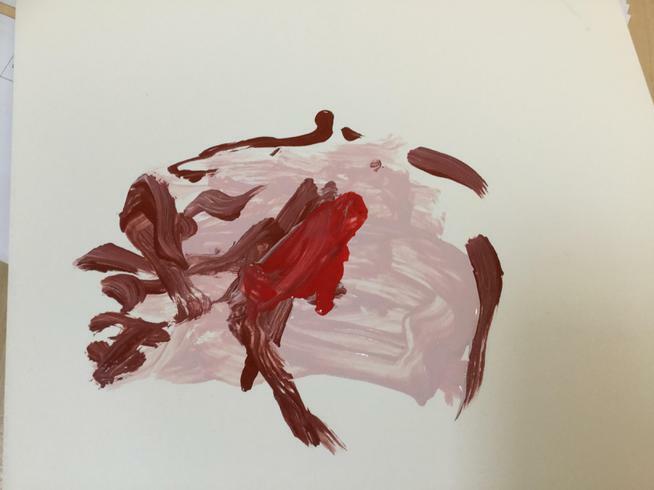 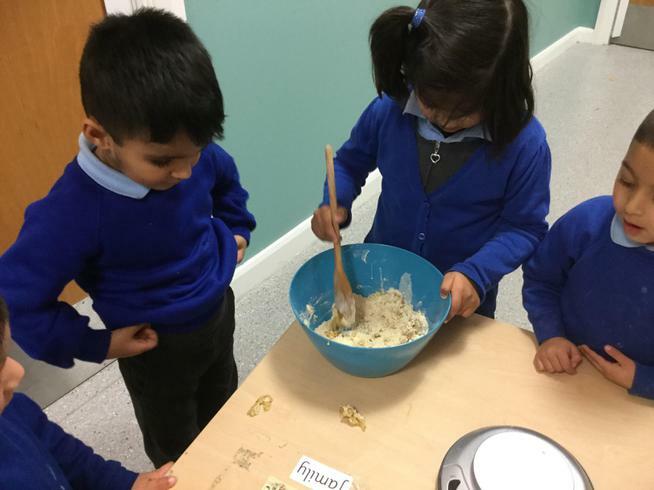 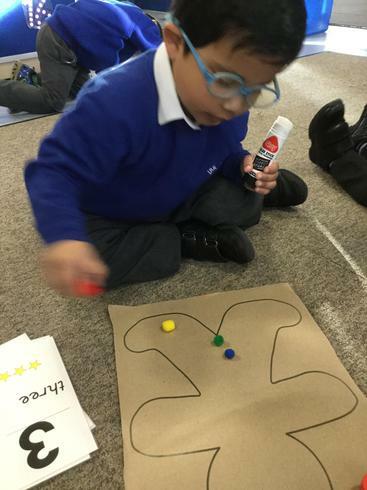 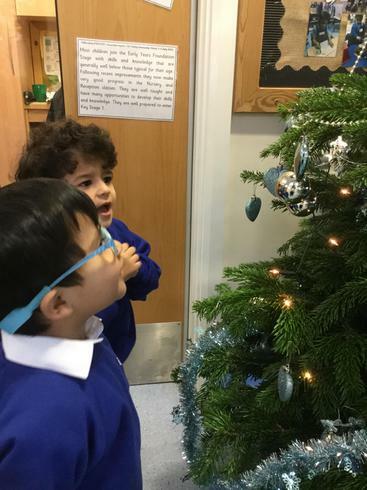 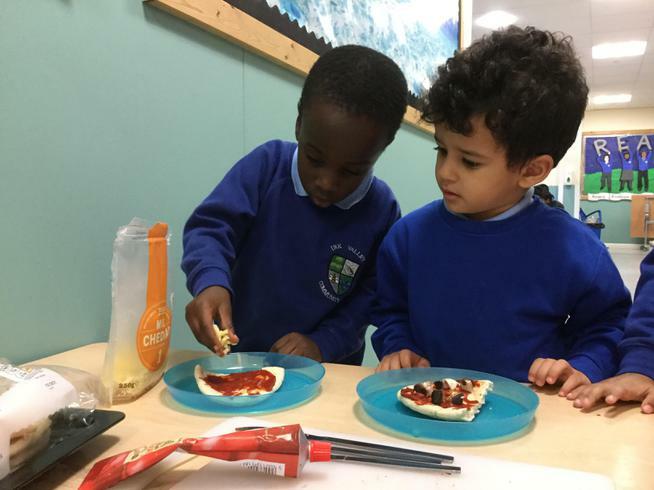 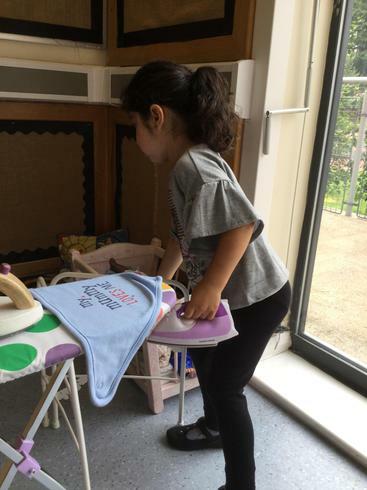 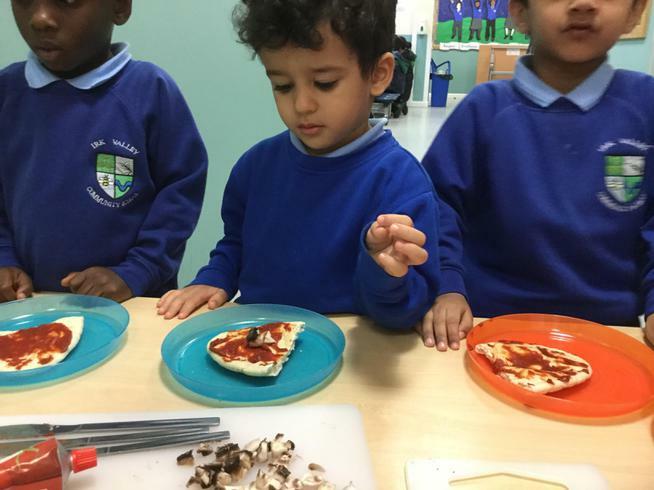 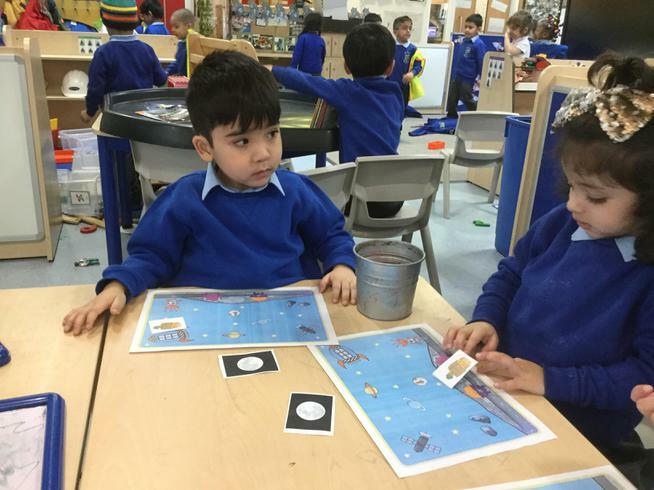 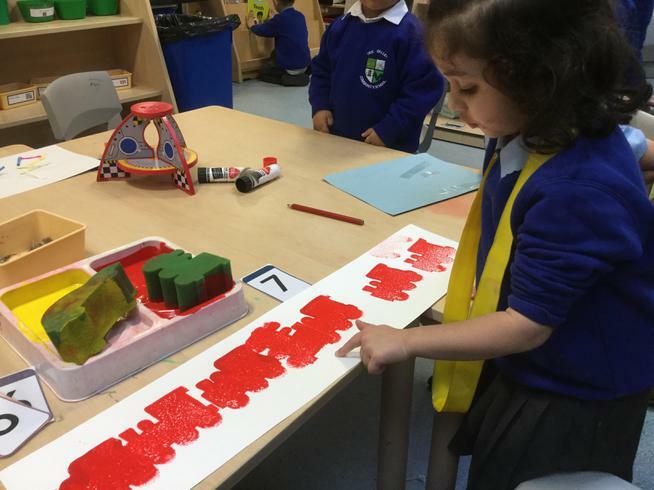 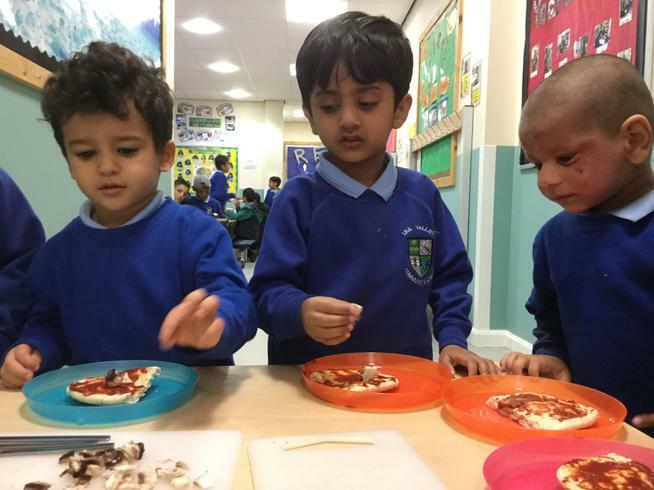 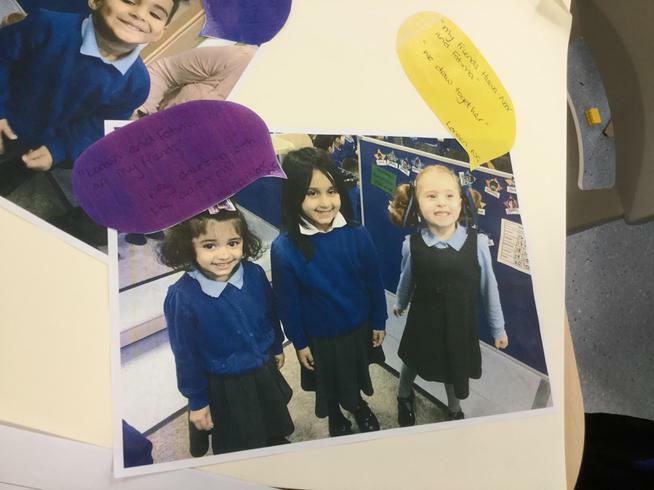 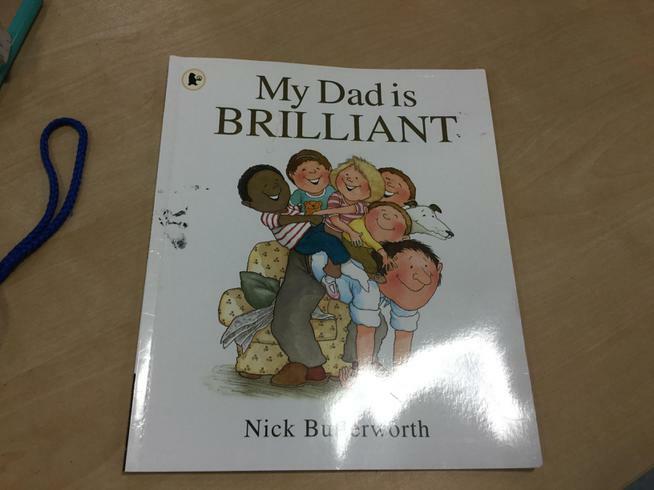 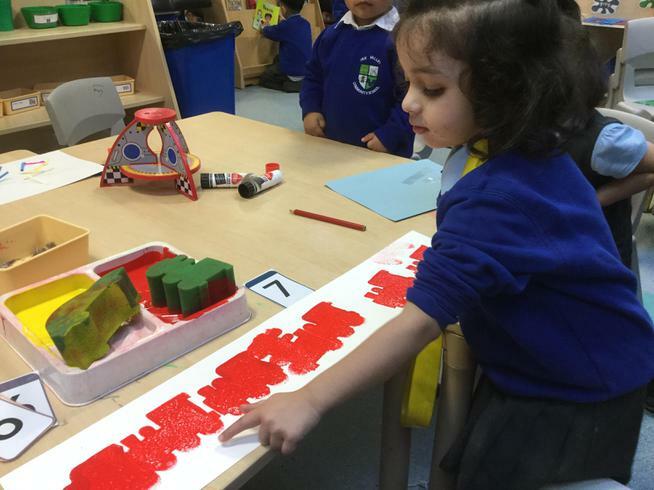 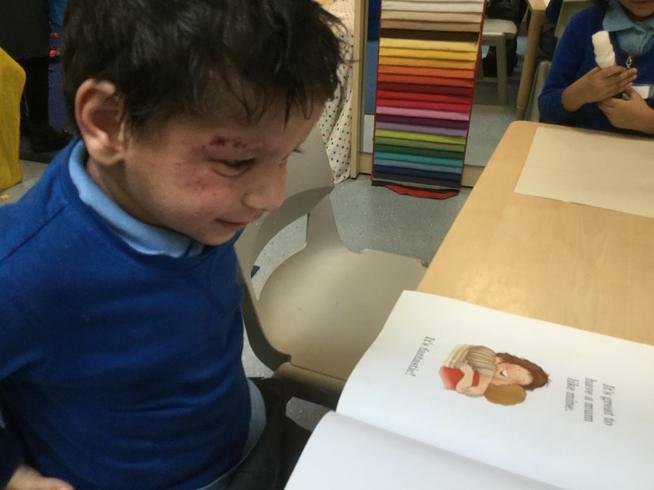 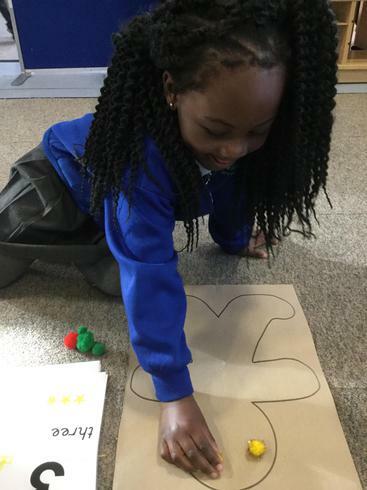 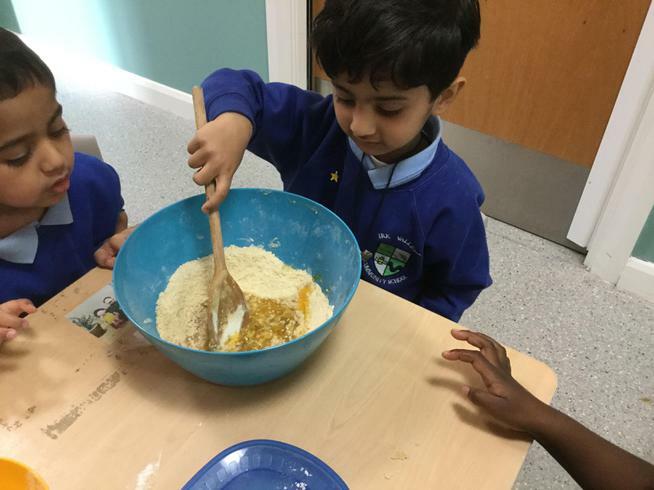 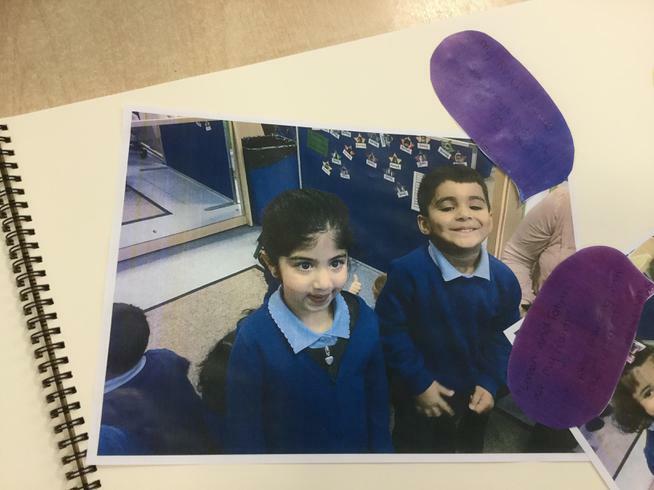 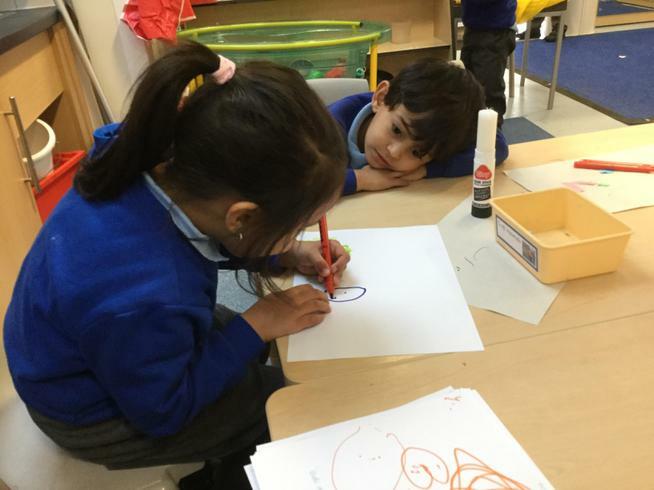 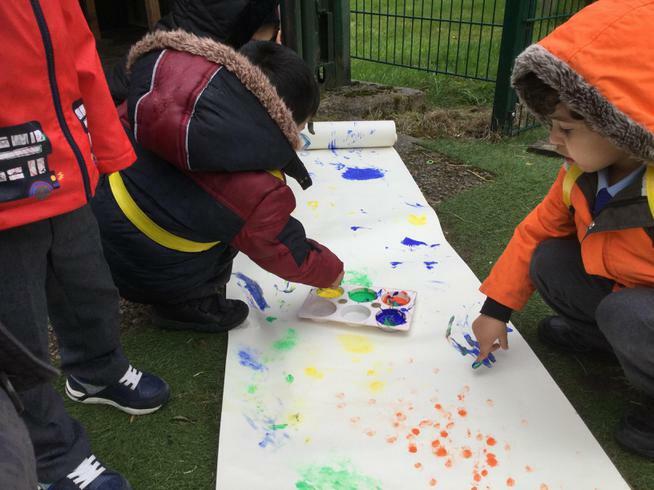 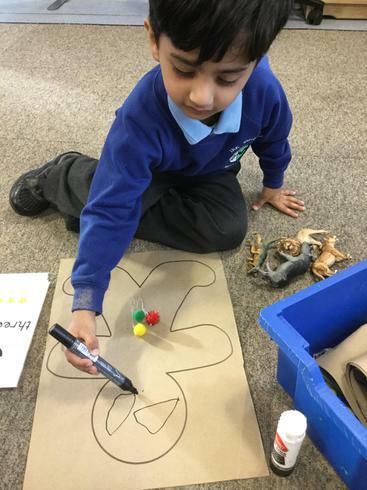 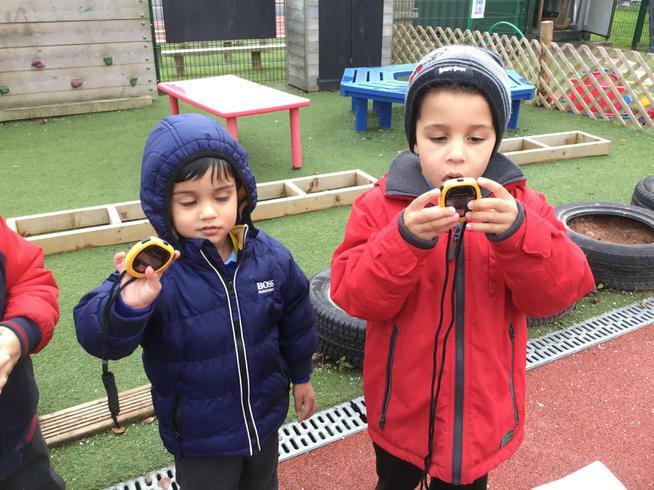 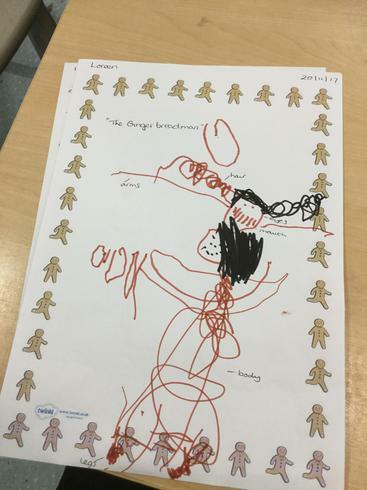 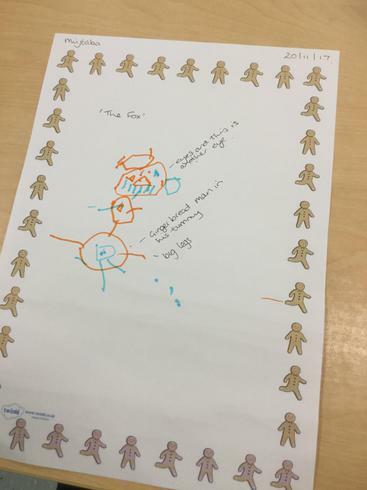 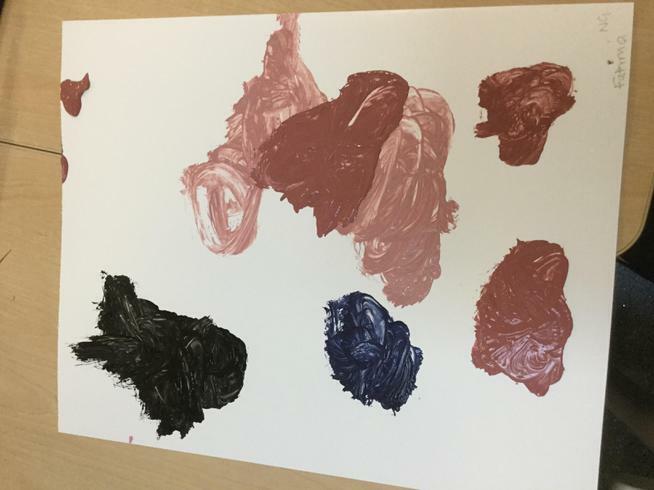 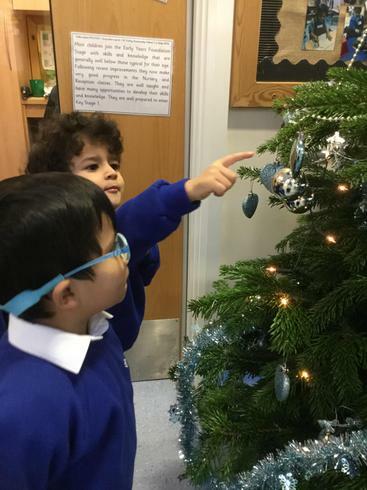 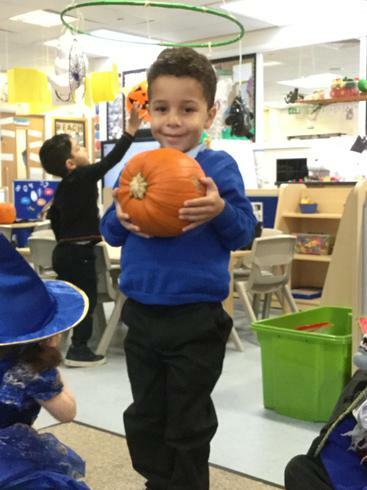 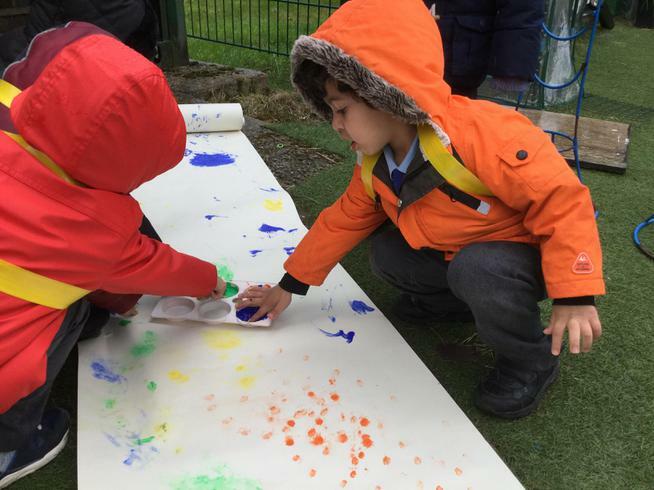 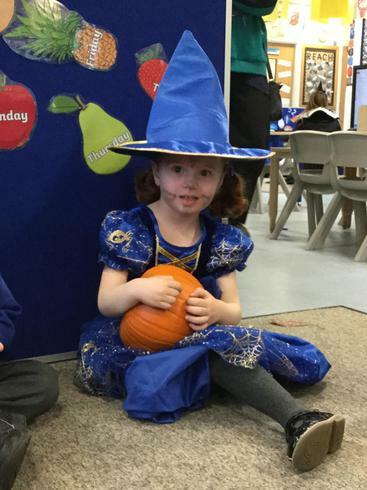 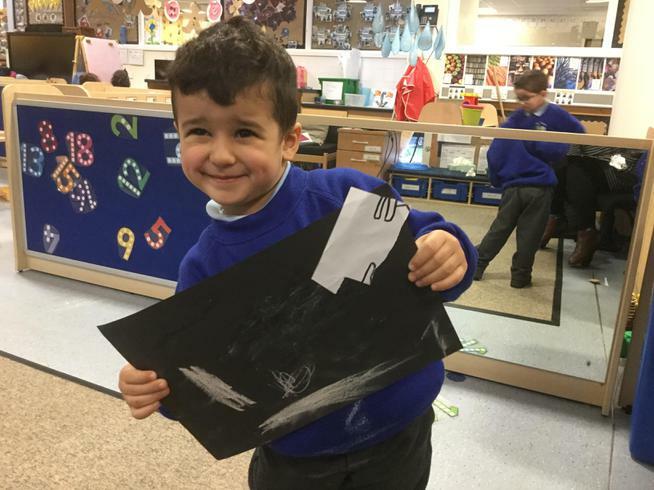 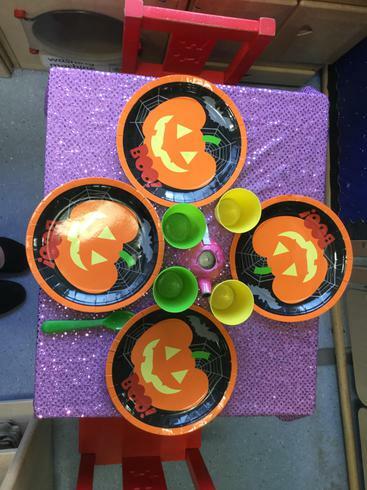 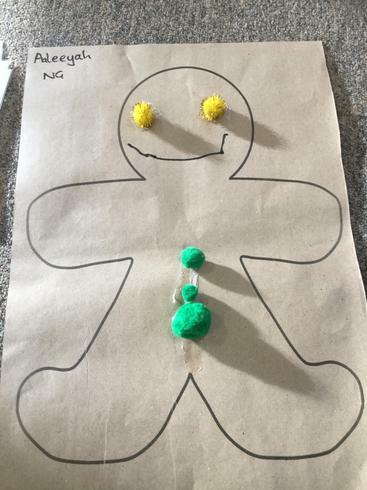 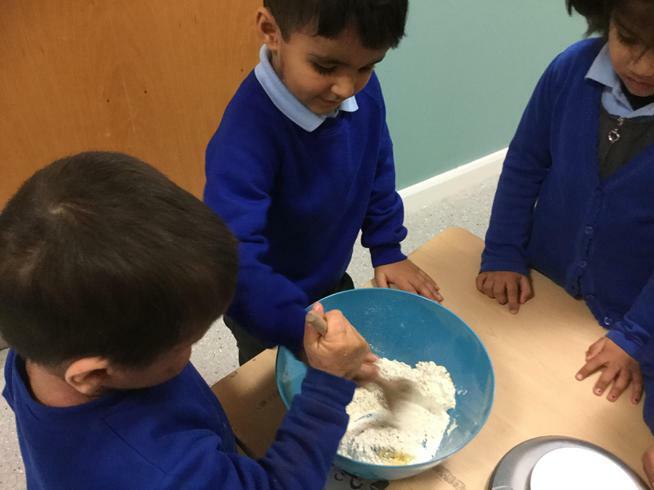 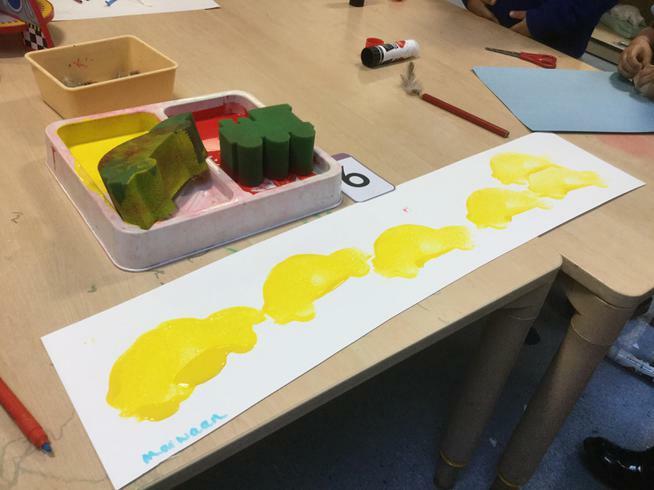 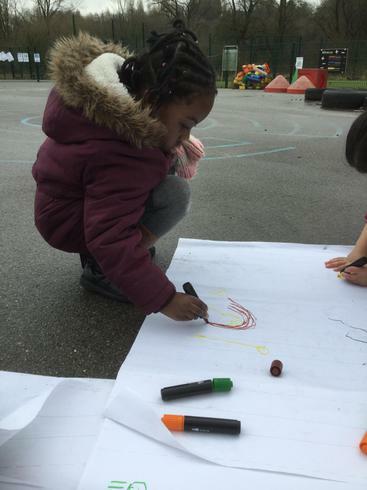 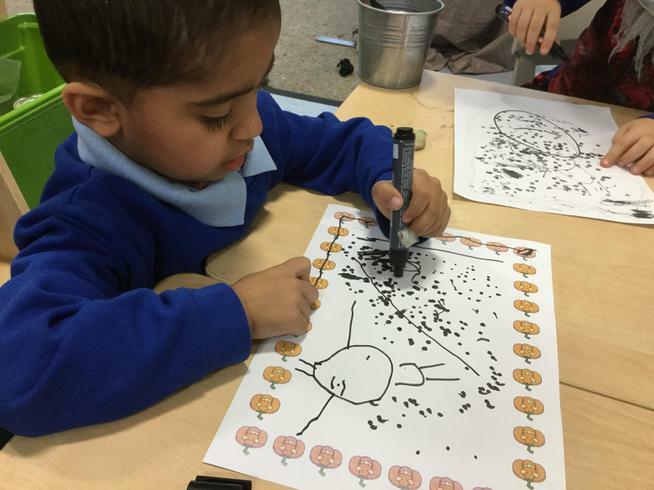 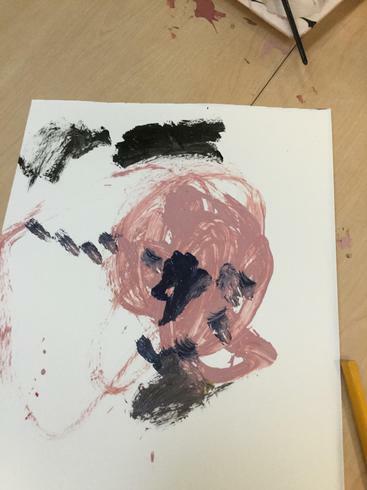 We love to share our news in nursery, if you have an exciting weekend we would love to hear all about it, maybe you could draw a picture or even bring a photograph to share. 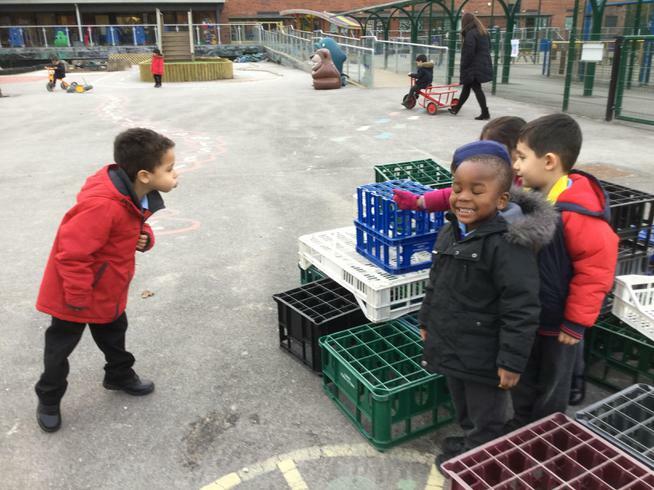 We would share these during our circle times during that week. 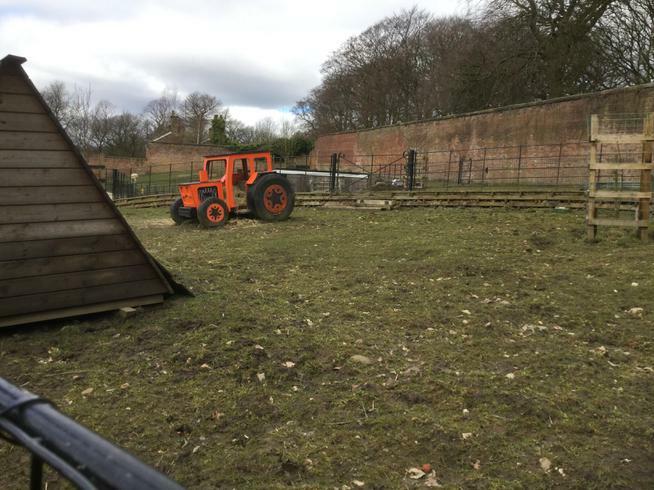 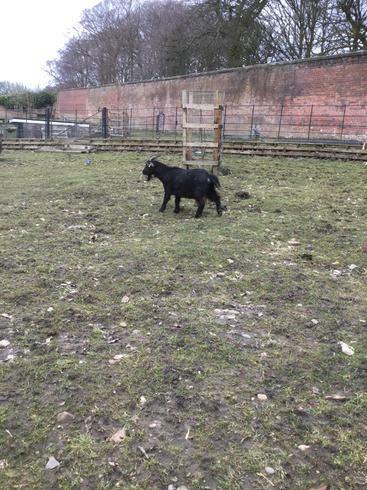 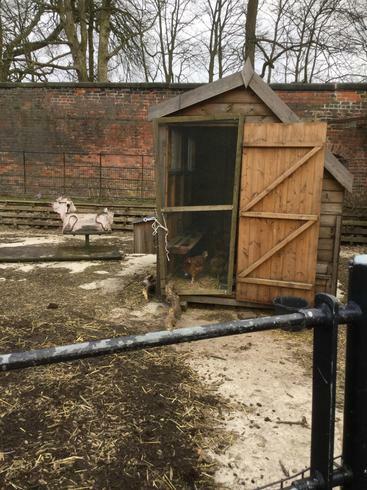 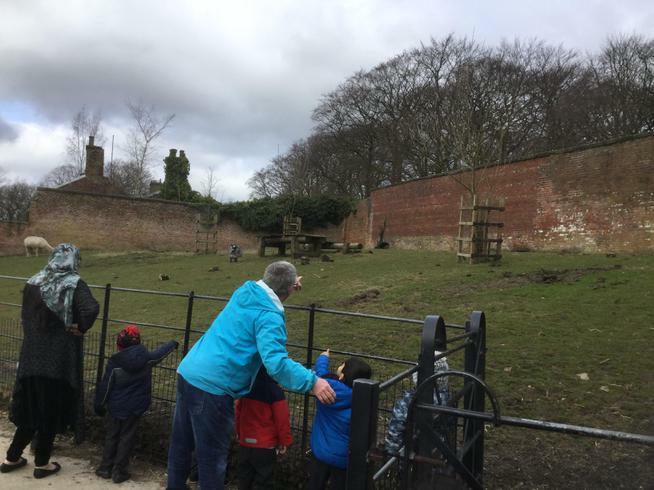 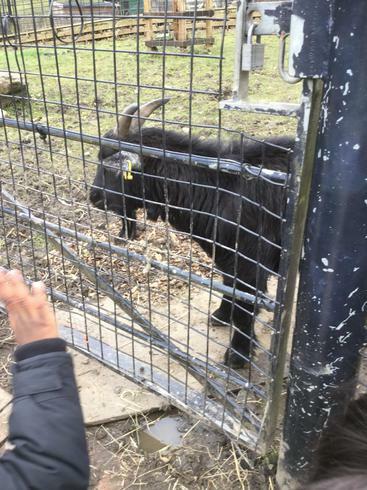 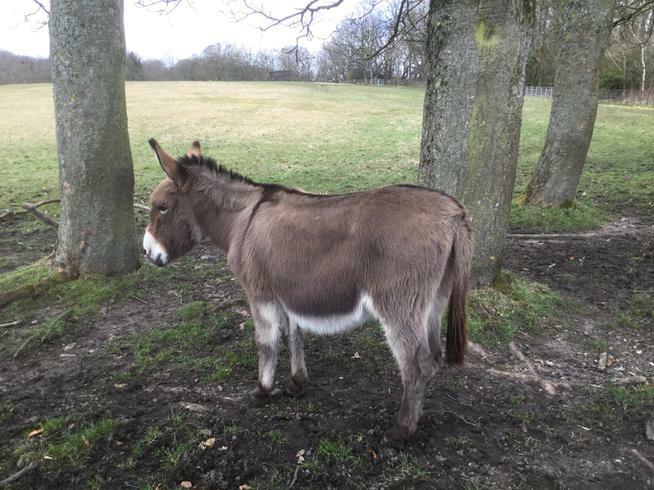 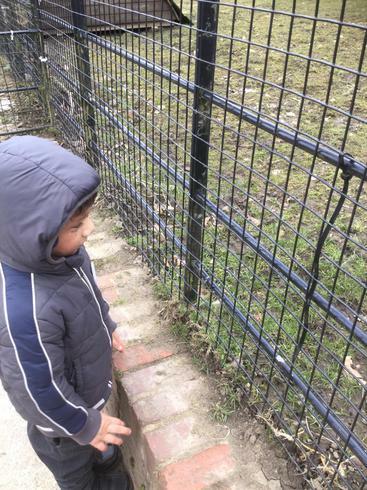 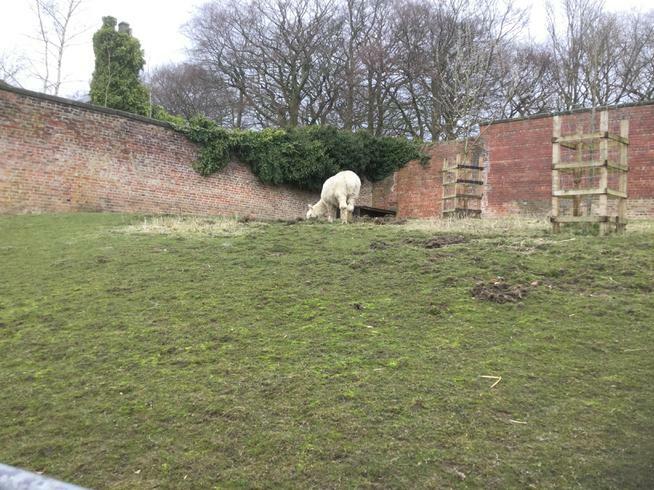 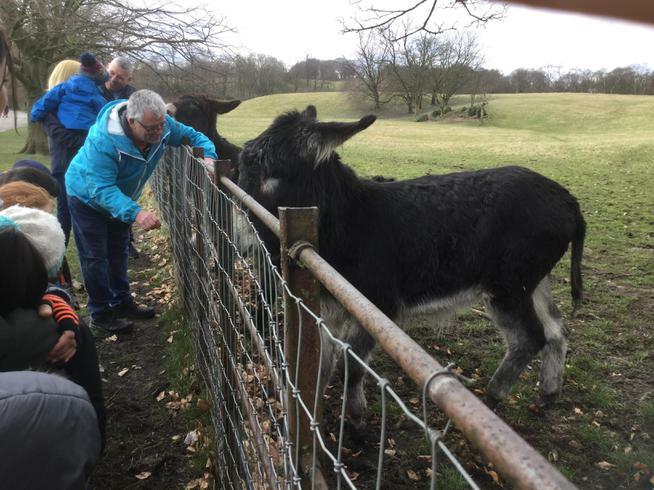 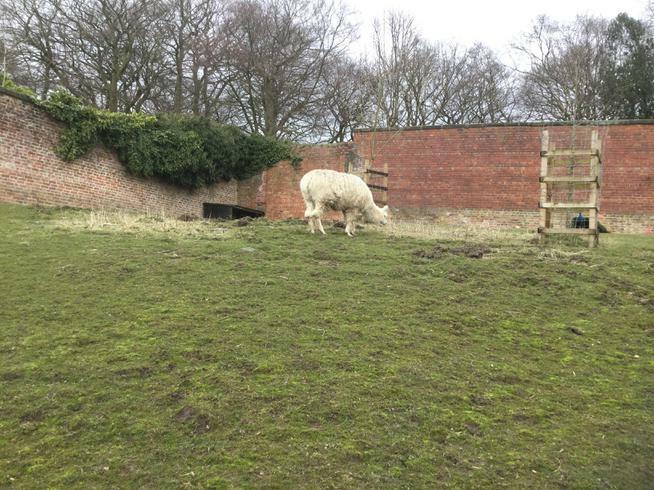 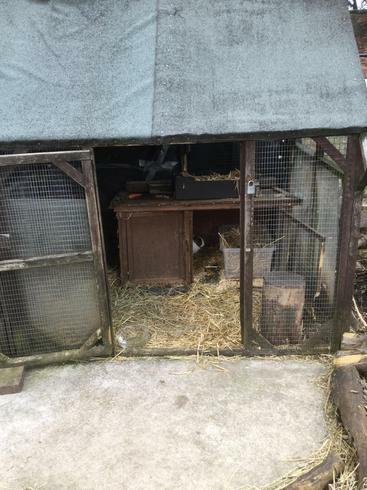 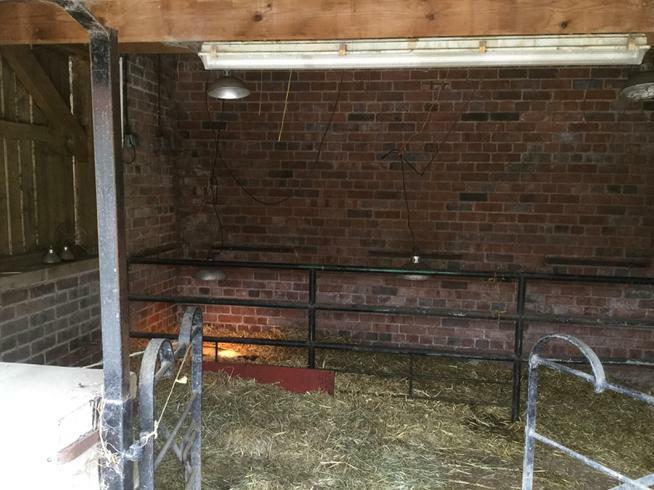 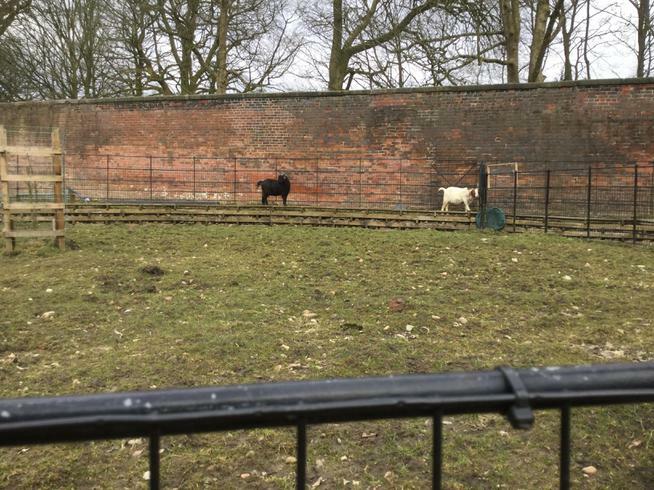 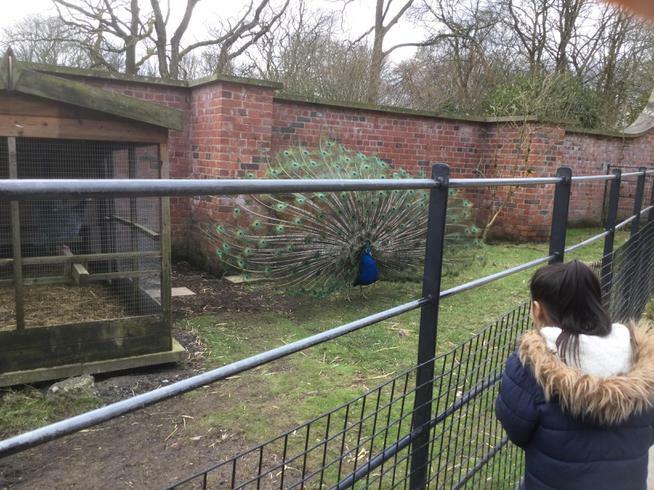 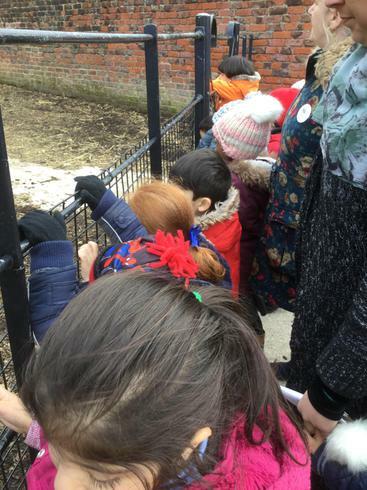 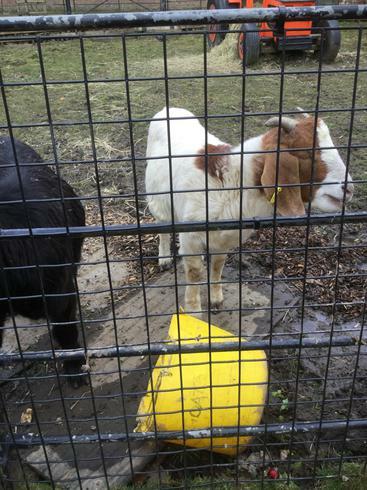 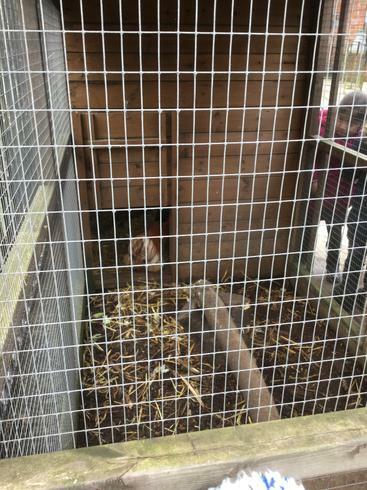 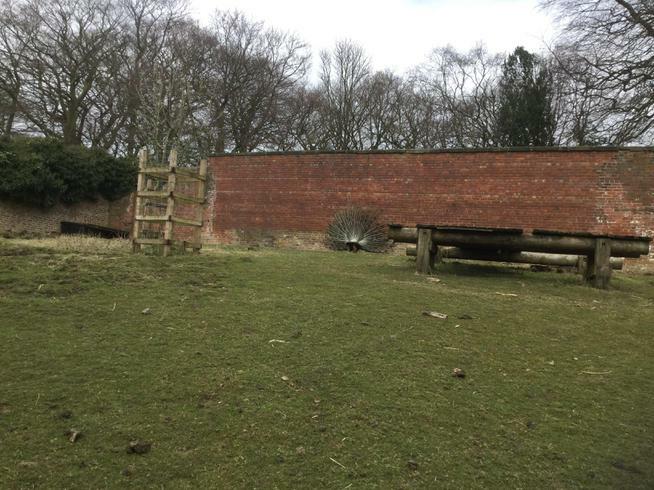 Our next Educational Visit: this will be to Heaton Park Farm in Spring 2 when we will be learning about Animals. 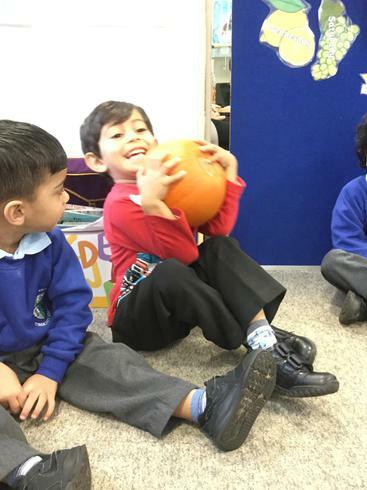 In nursery our P.E day is Thursday. 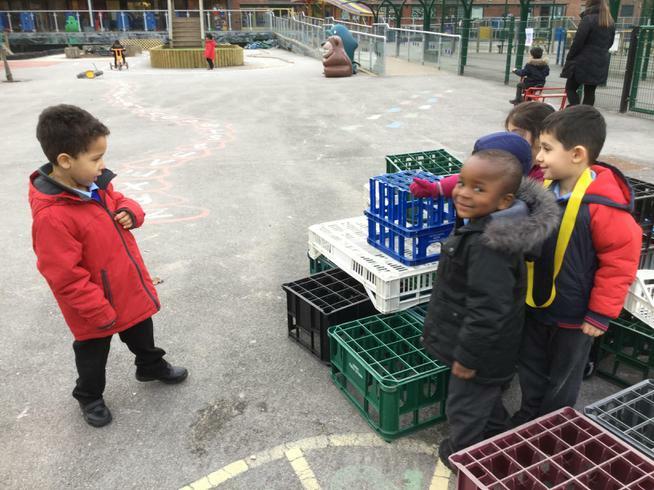 We do not need a P.E kit as we will just remove our shoes and socks. 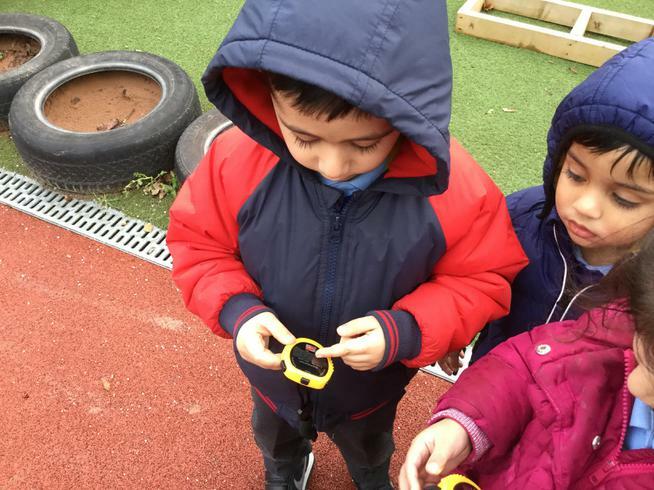 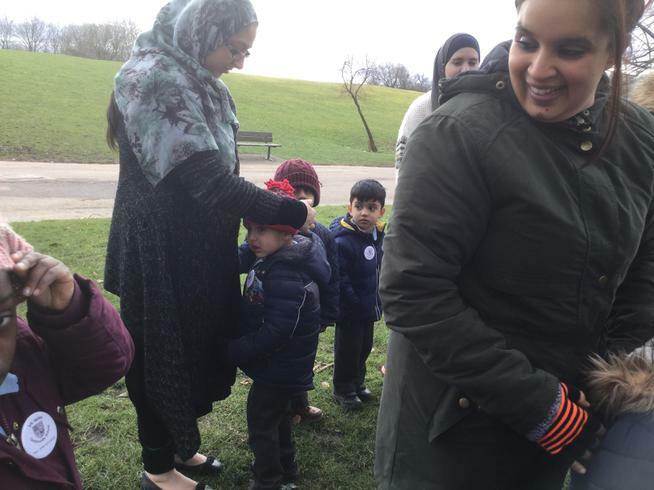 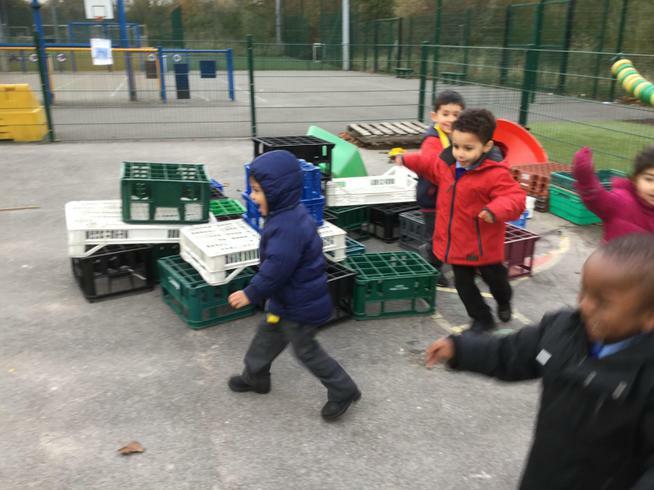 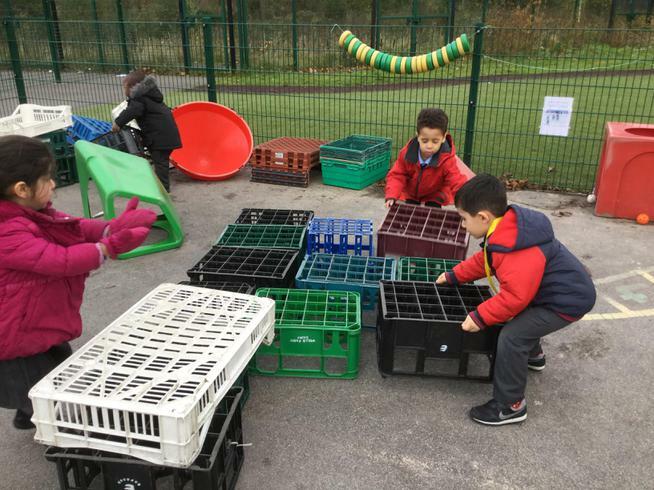 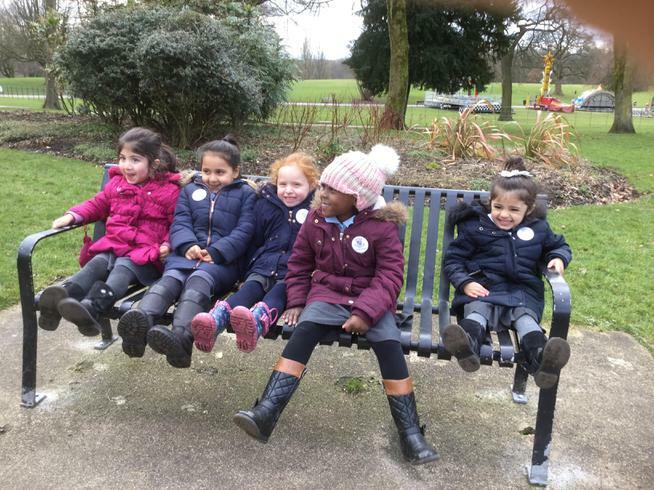 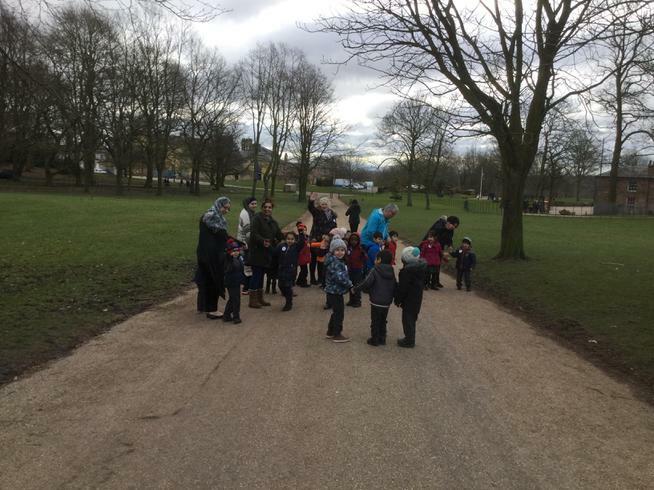 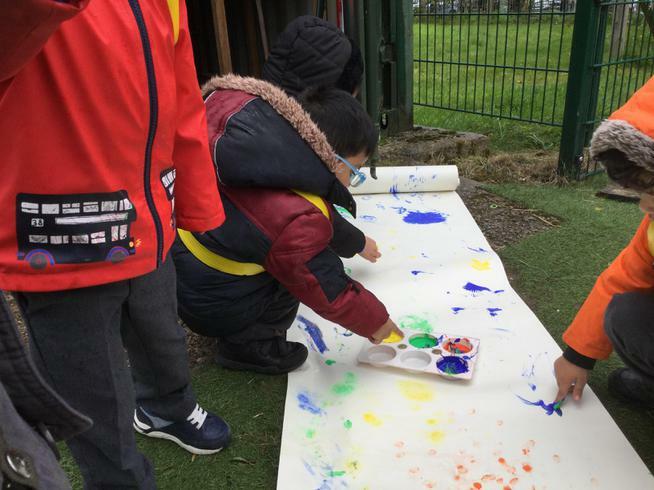 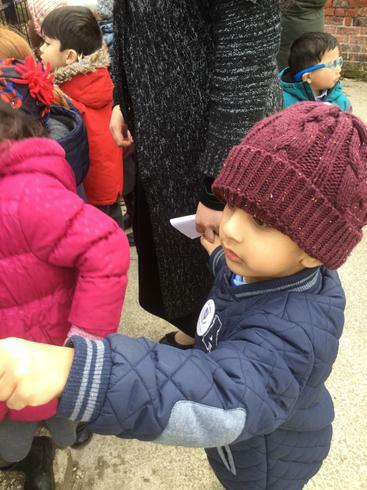 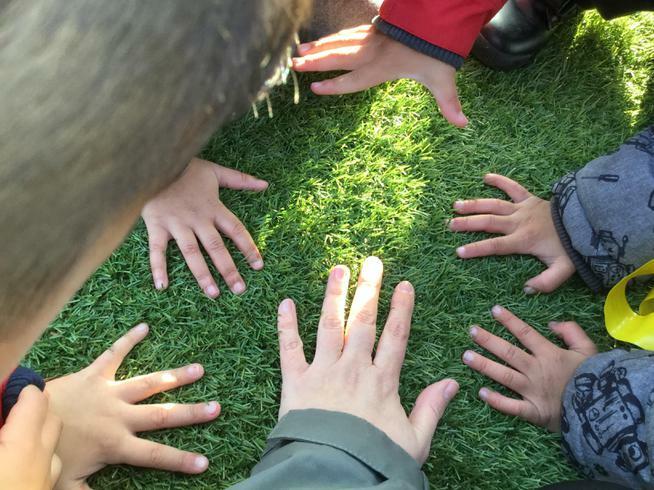 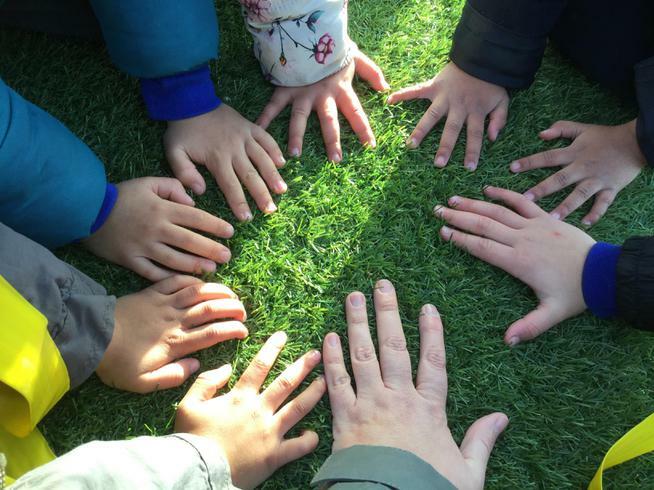 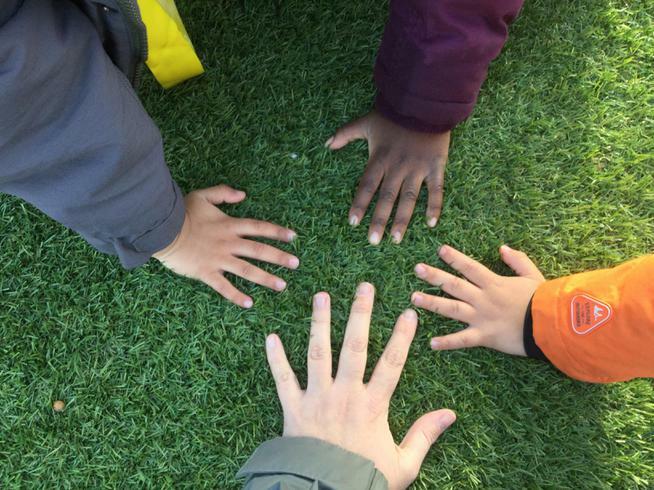 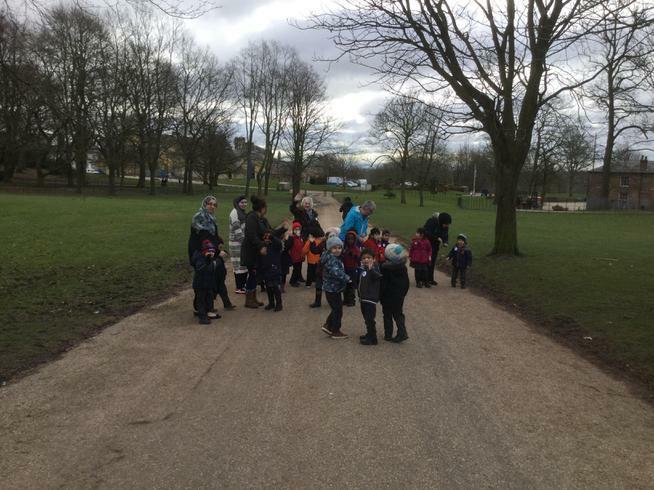 Every Tuesday : Nursery Green Stay and Play. 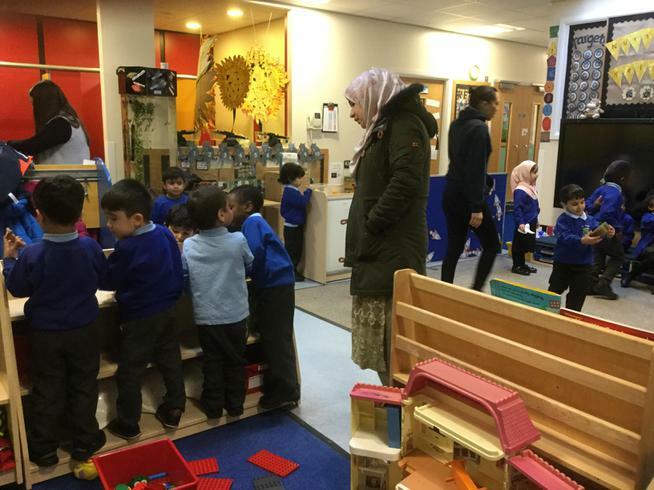 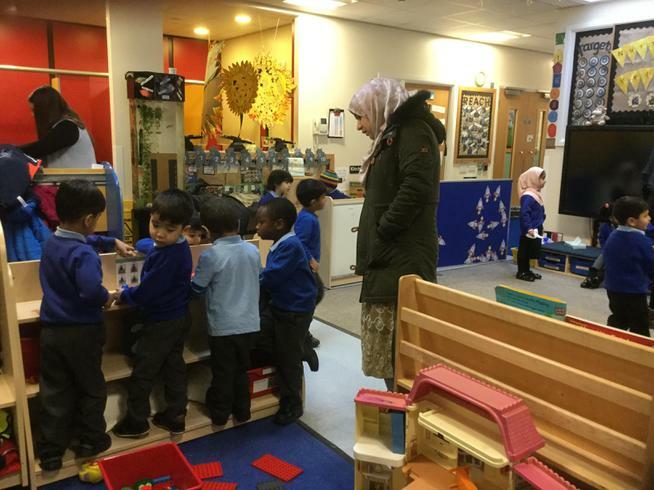 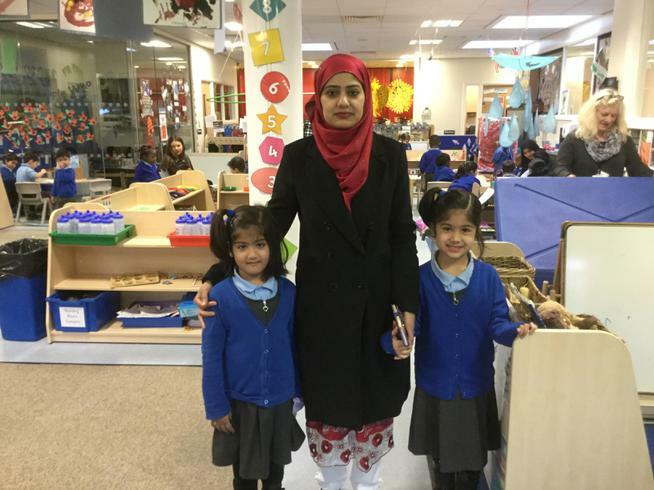 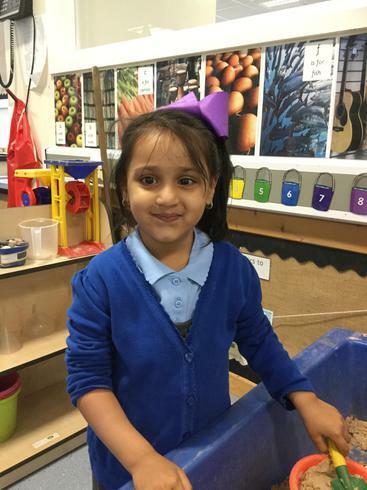 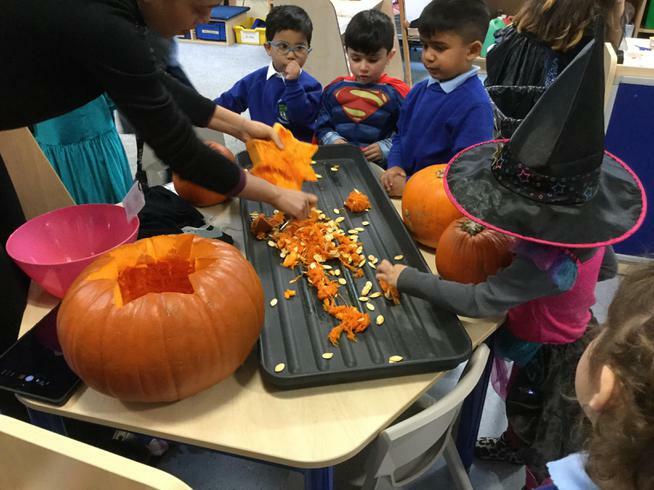 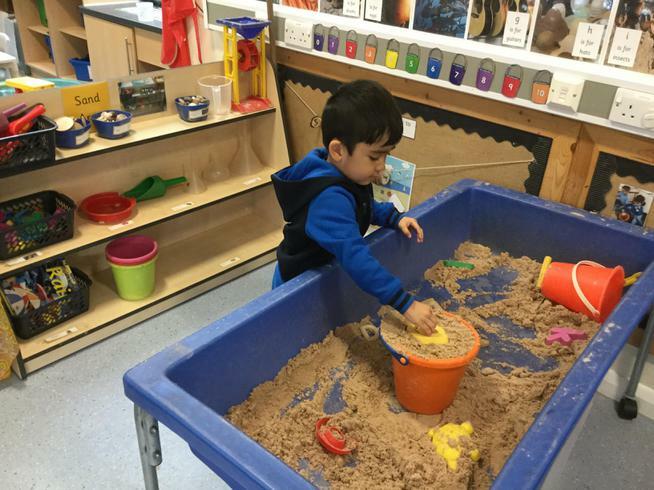 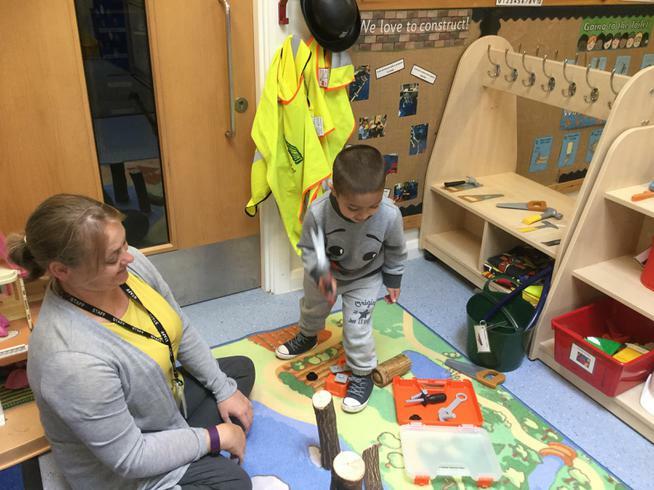 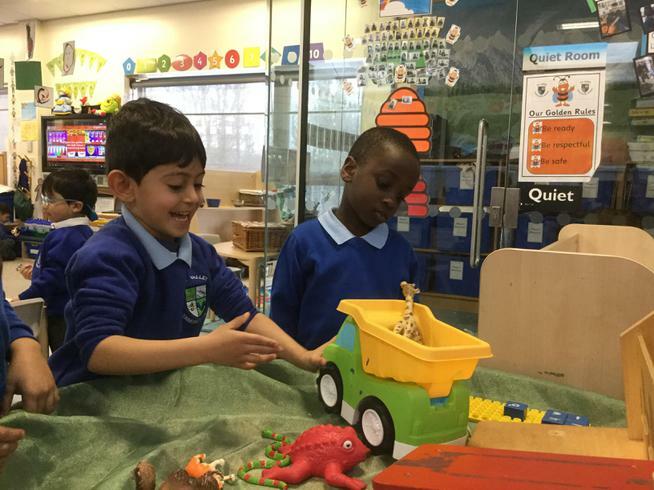 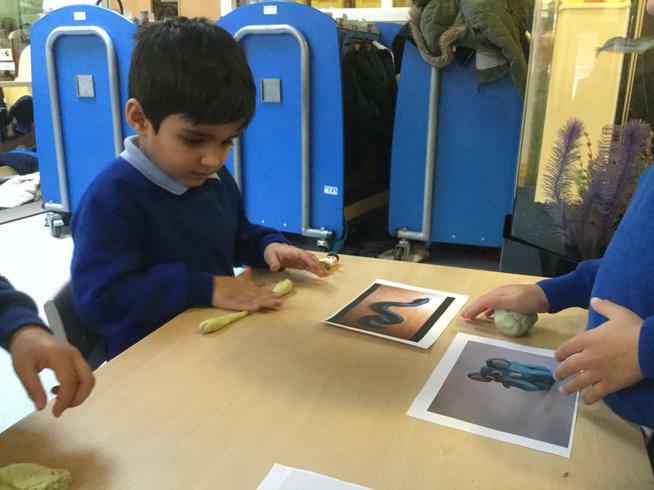 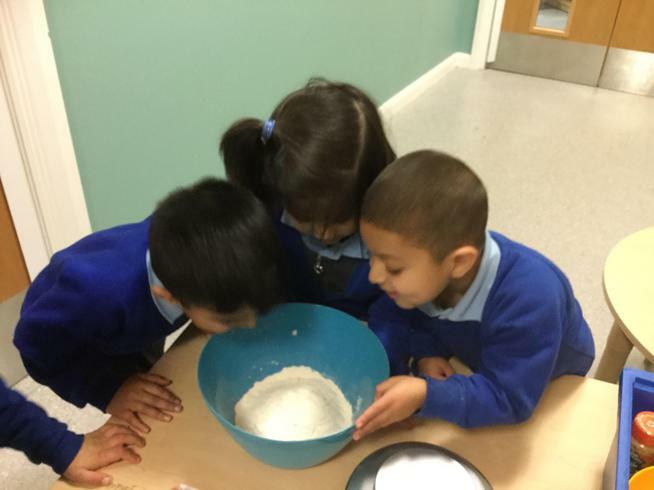 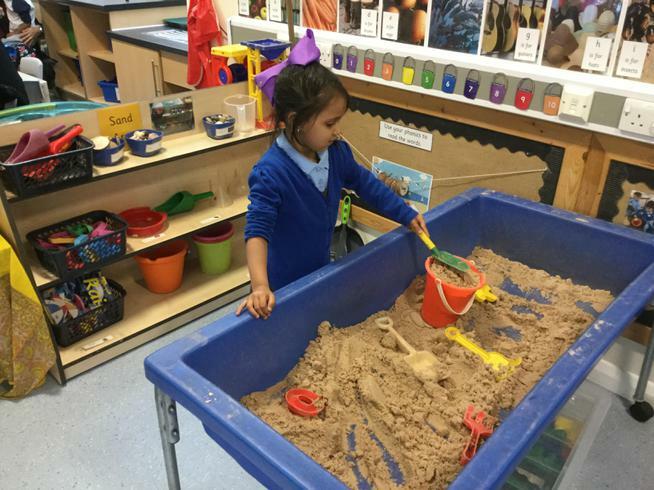 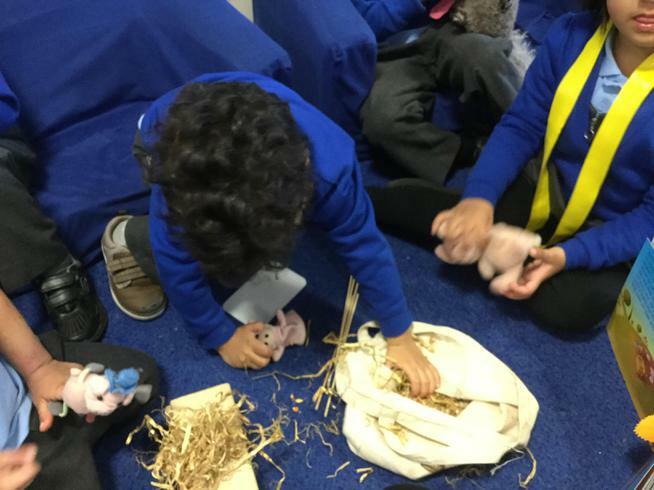 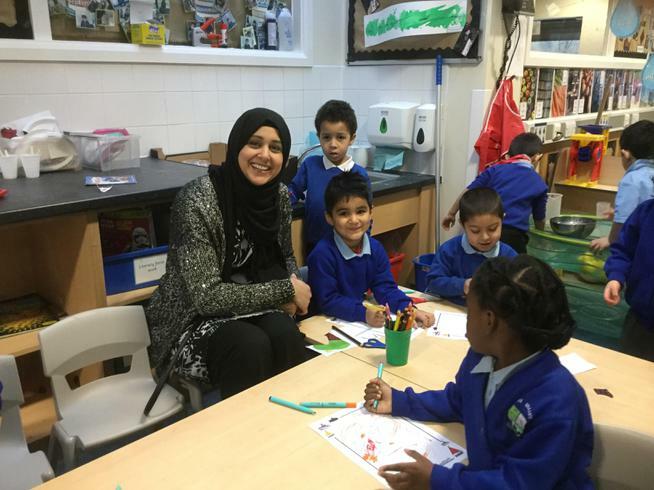 Stay and Play is a chance for all parents and carers to come And join us in nursery. 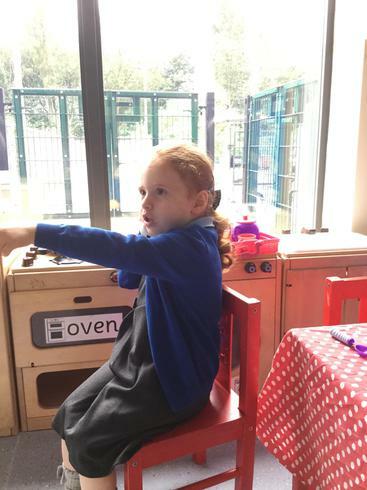 This is a good chance to see what your child is doing at school as you are welcome to stay for a little while to spend time with them. 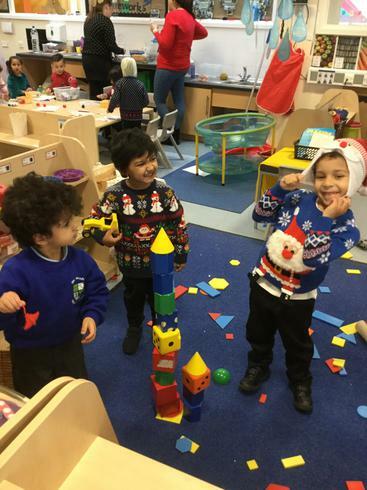 Our first stay and Play session have been very successful we look forward to you joining us next time.